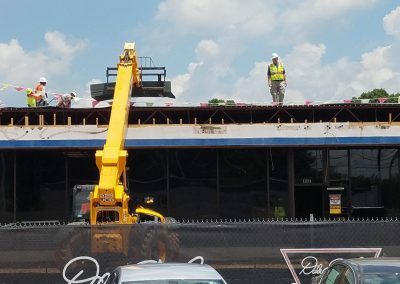 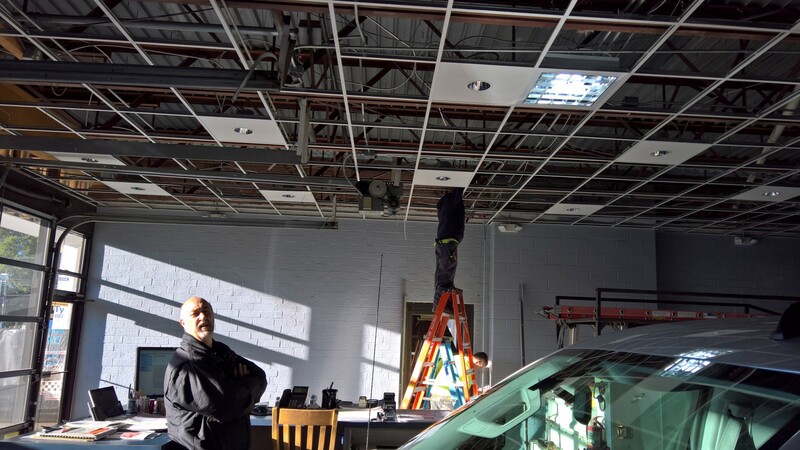 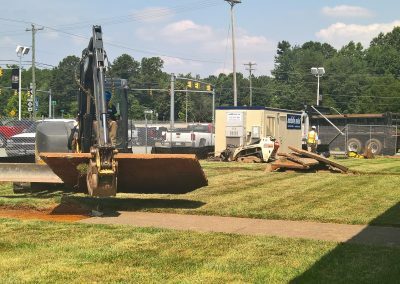 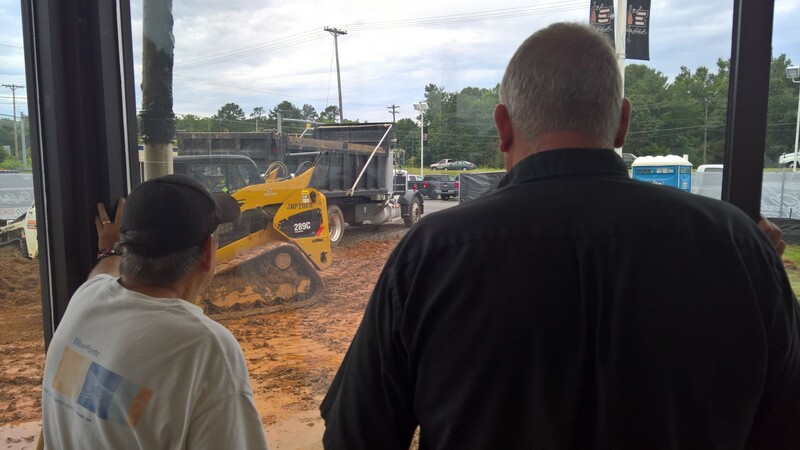 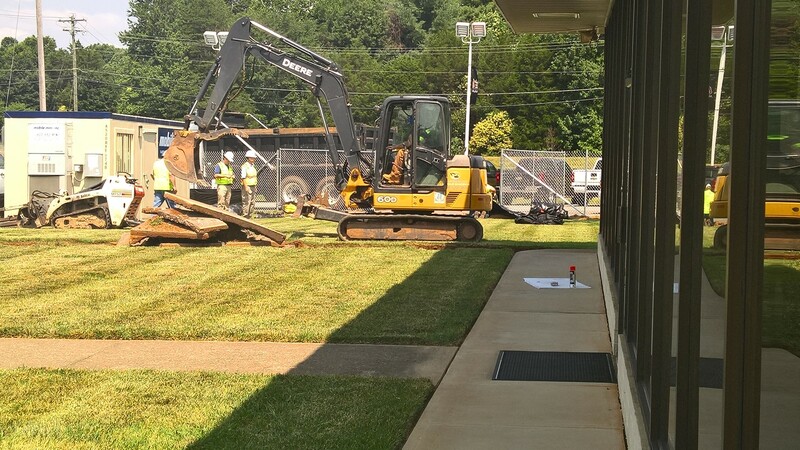 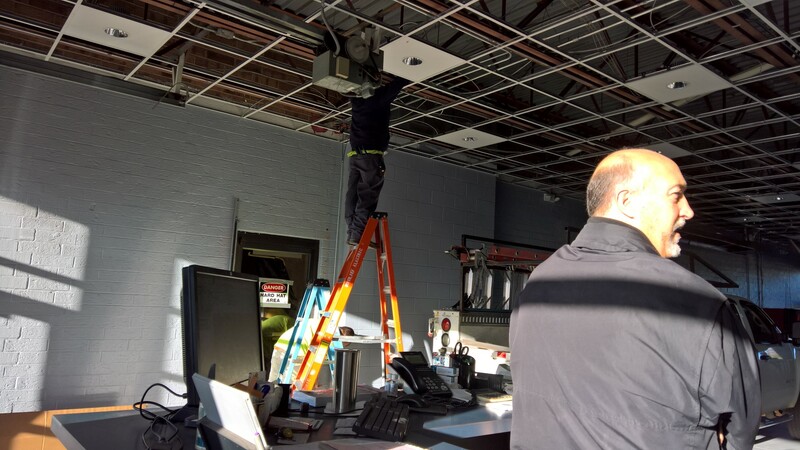 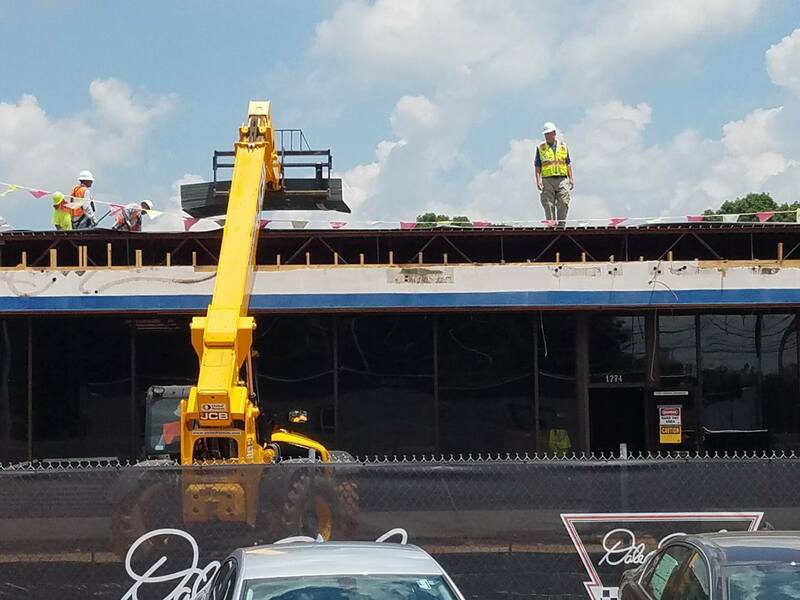 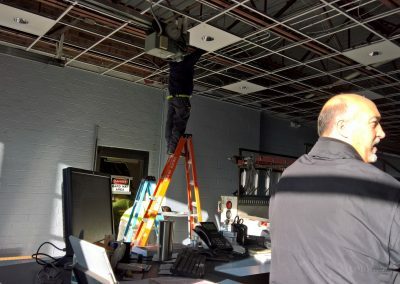 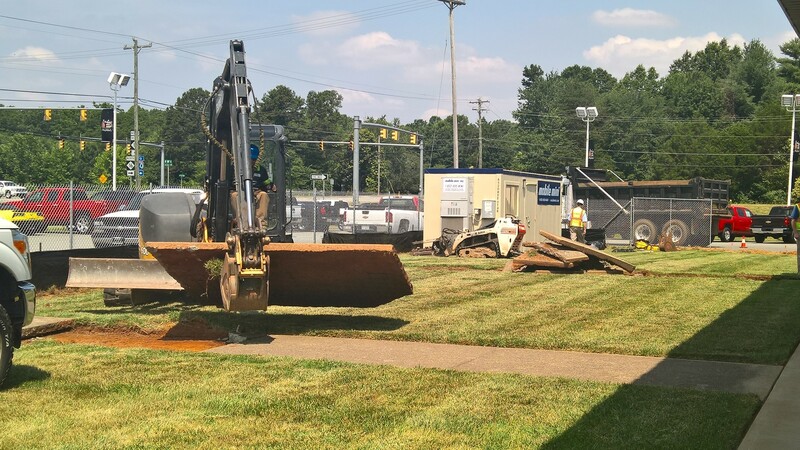 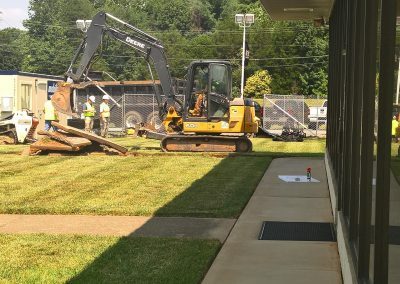 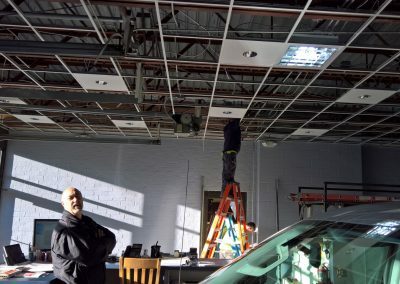 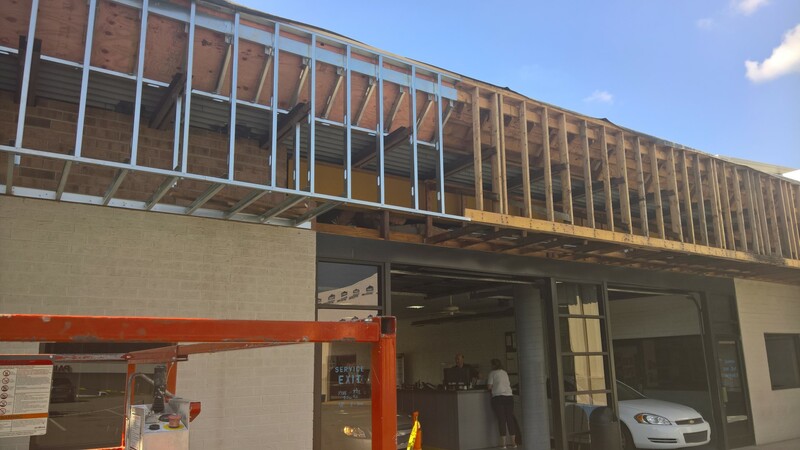 Long overdue construction has finally began on our building which has faithfully served us for decades! 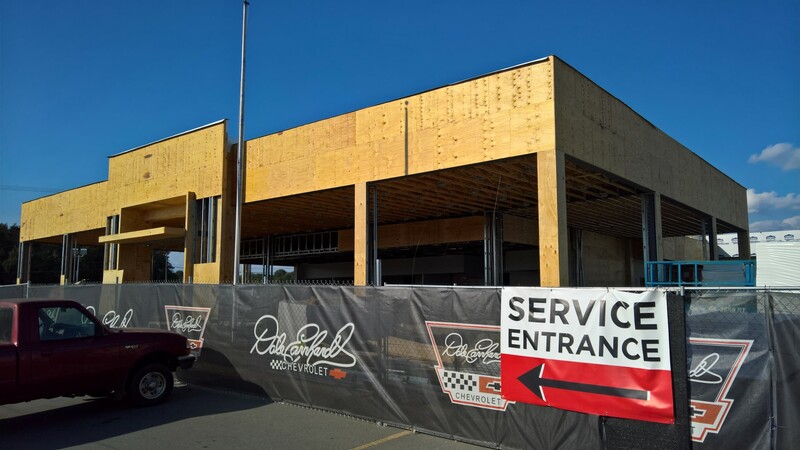 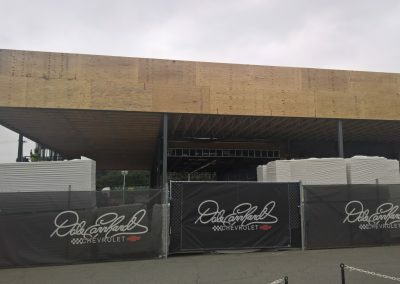 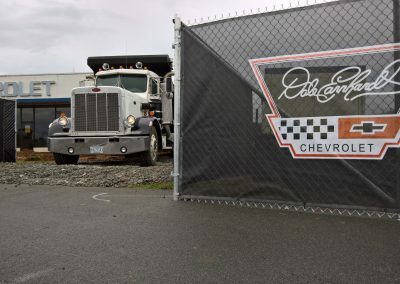 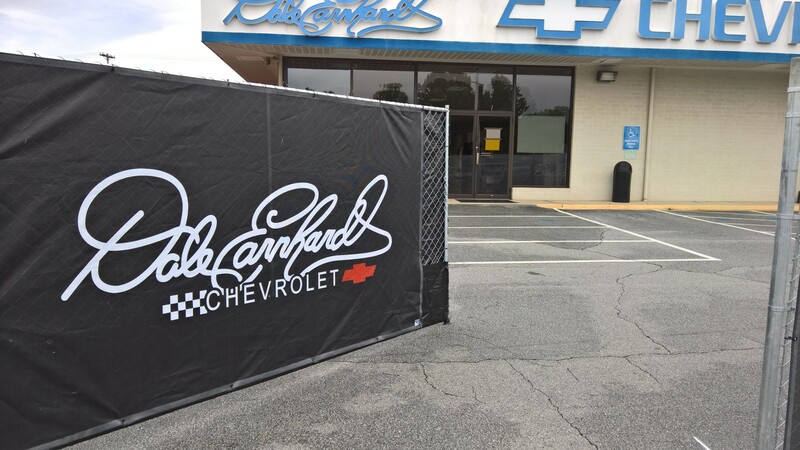 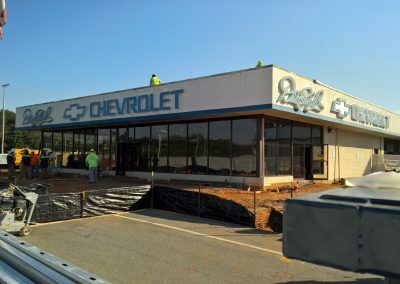 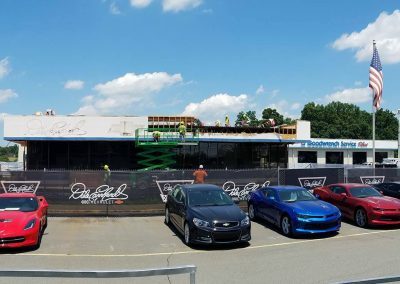 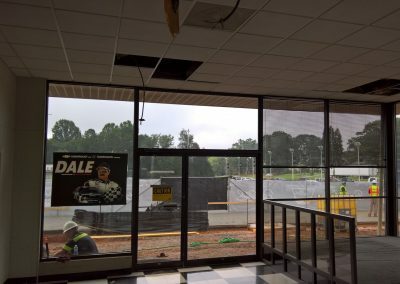 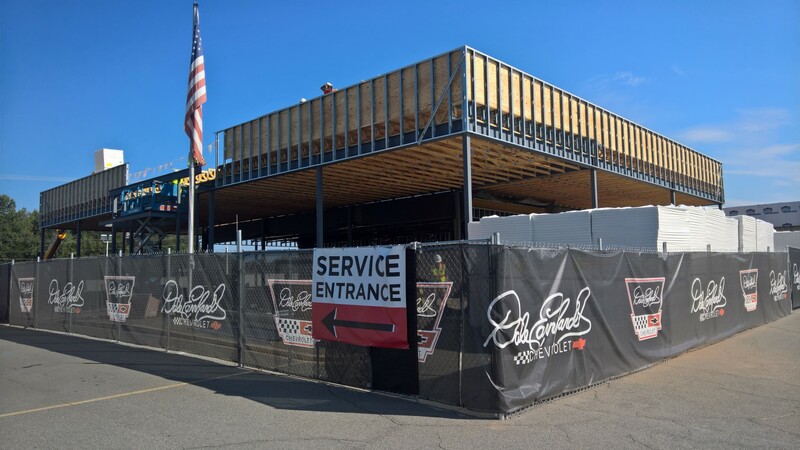 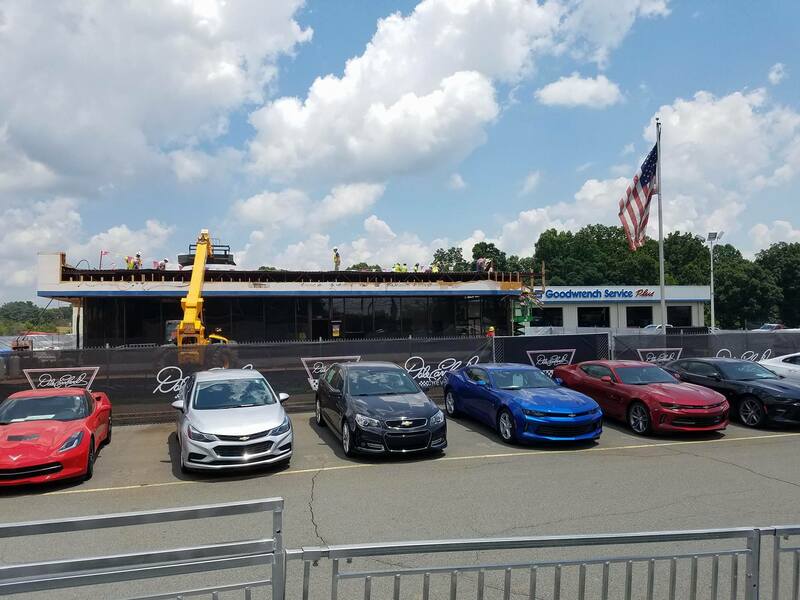 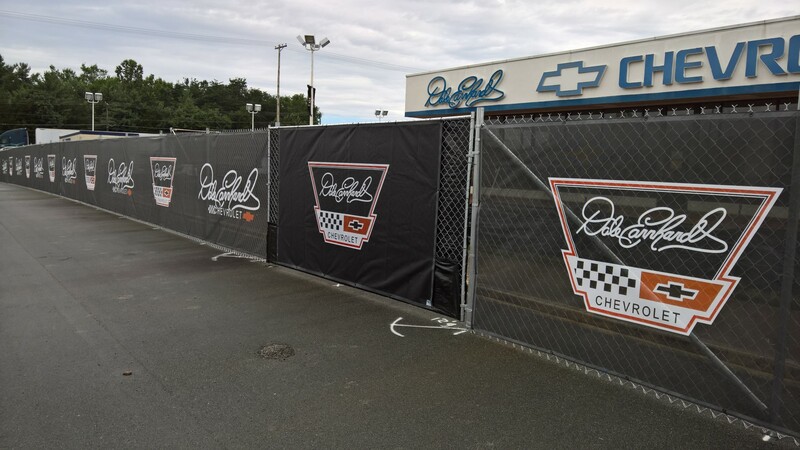 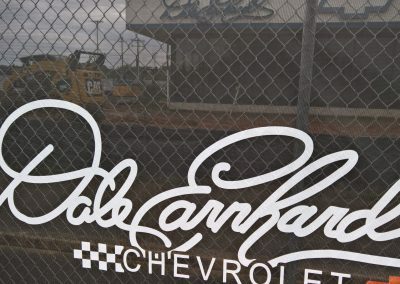 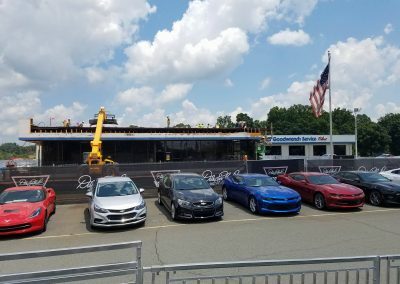 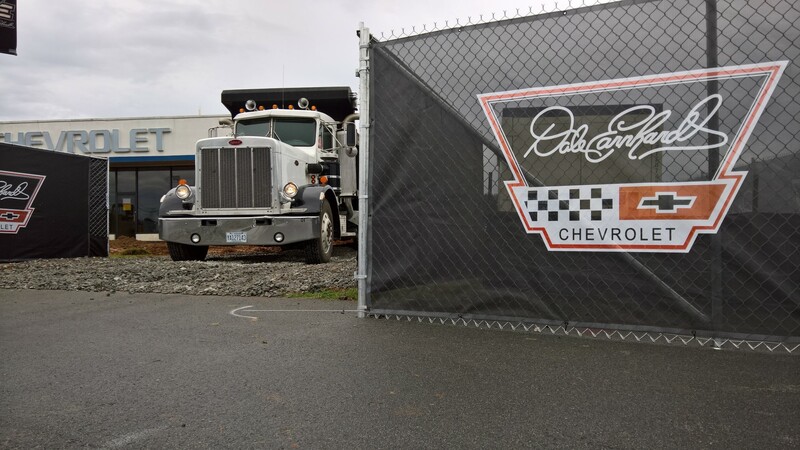 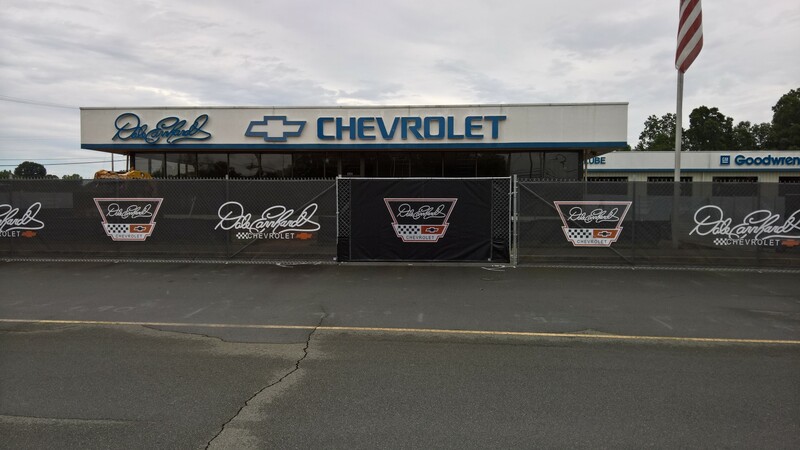 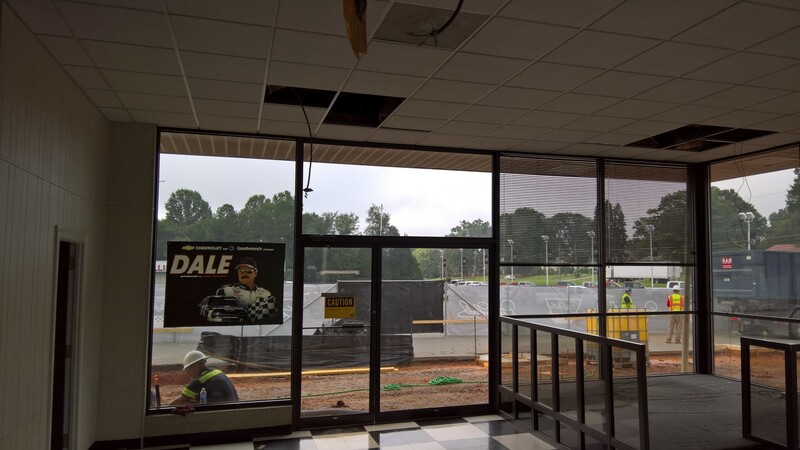 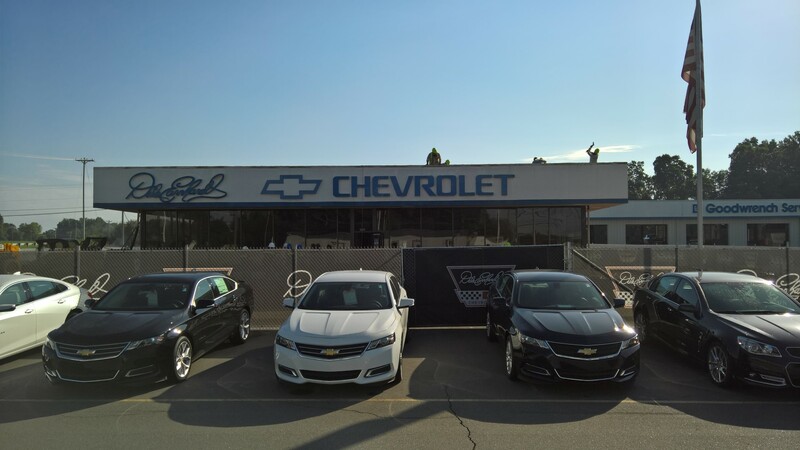 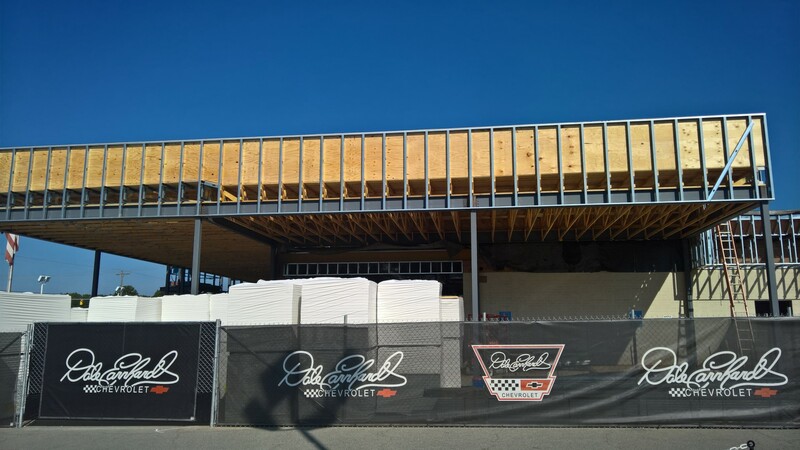 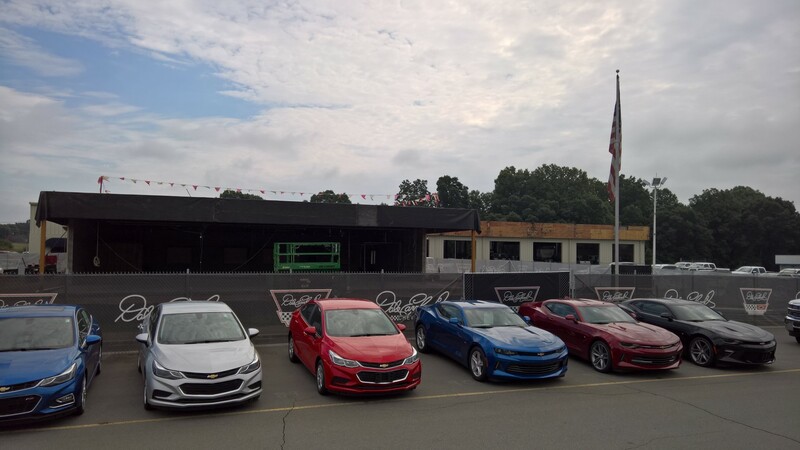 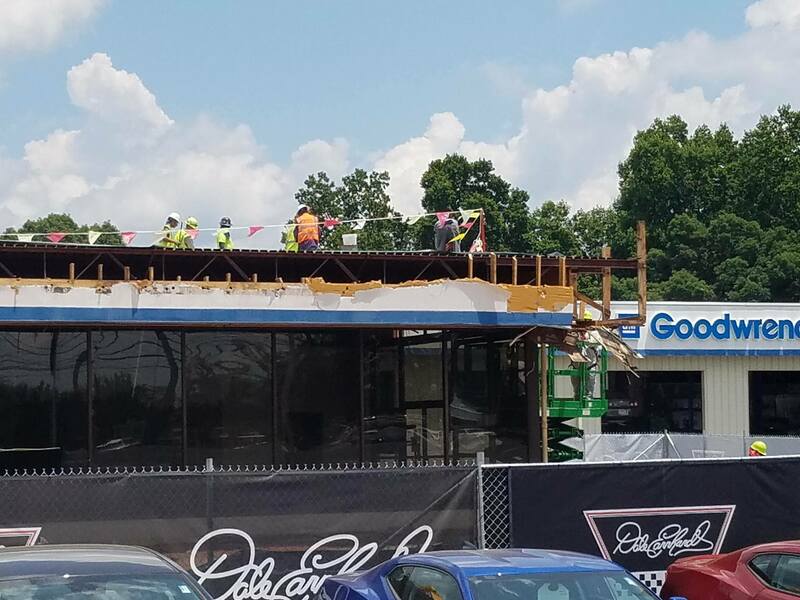 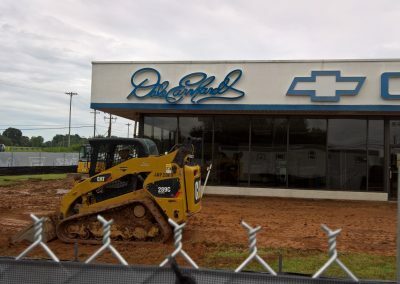 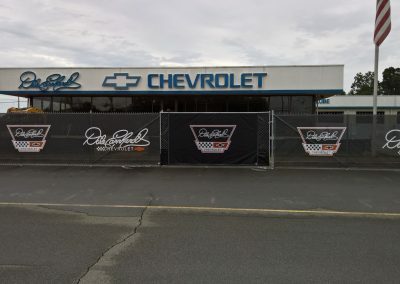 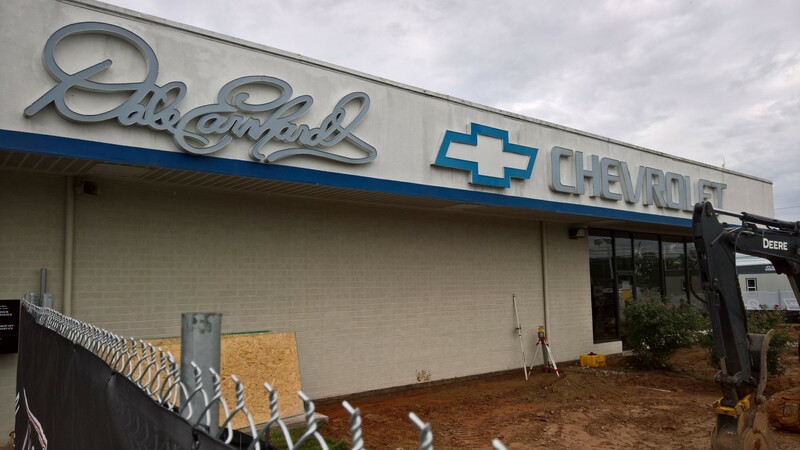 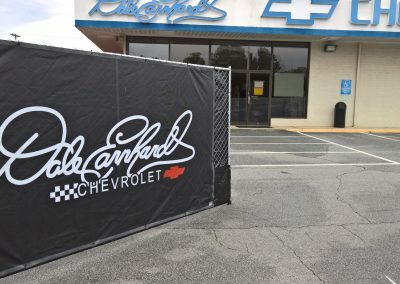 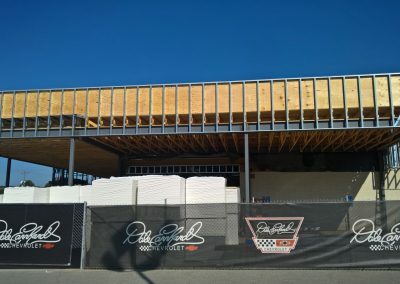 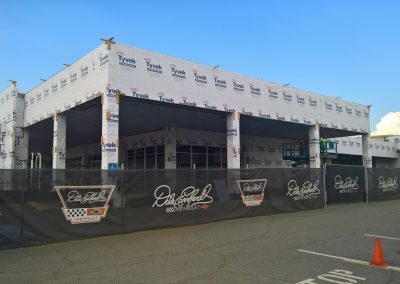 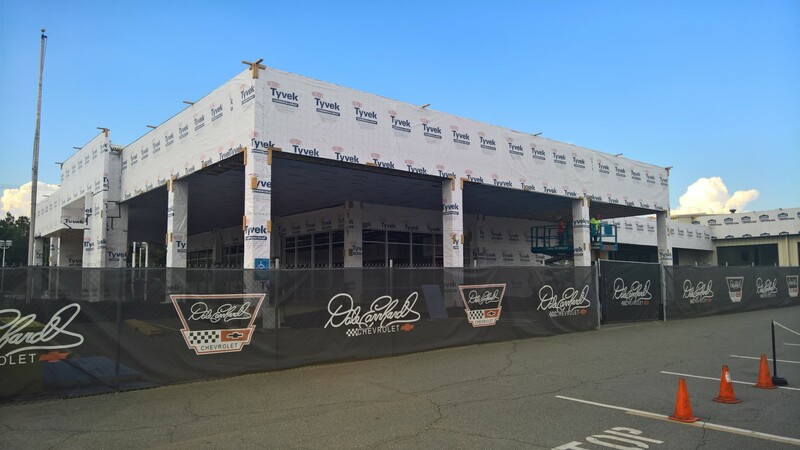 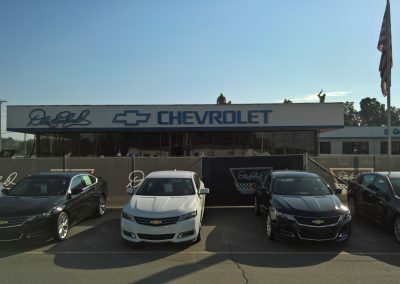 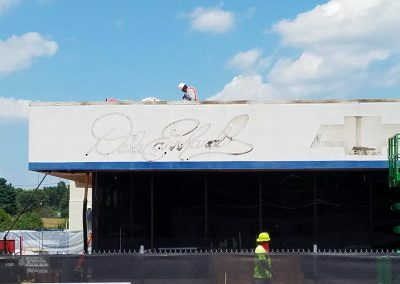 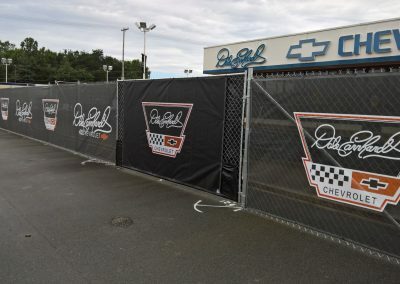 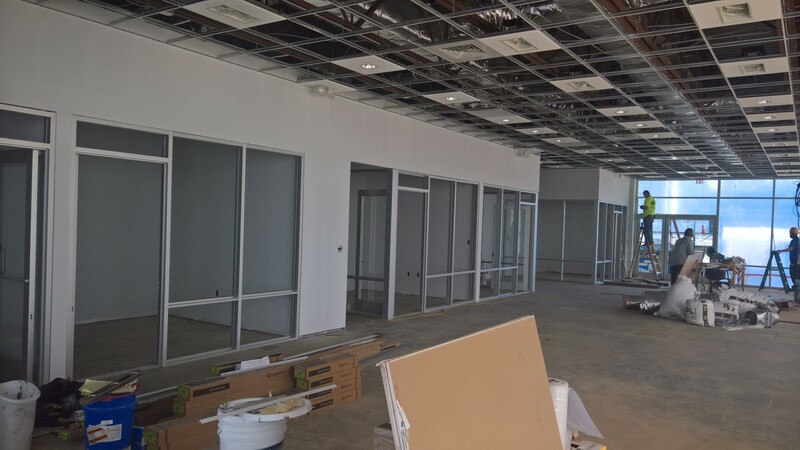 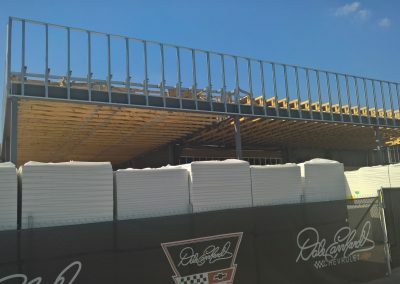 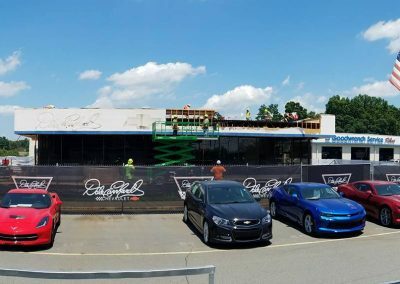 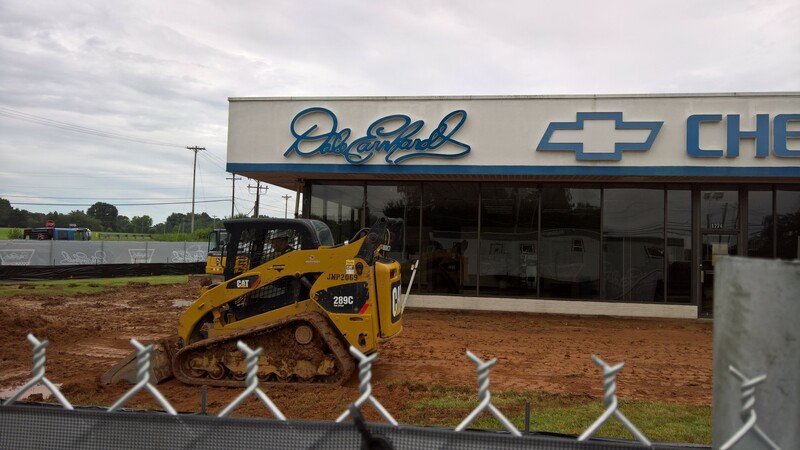 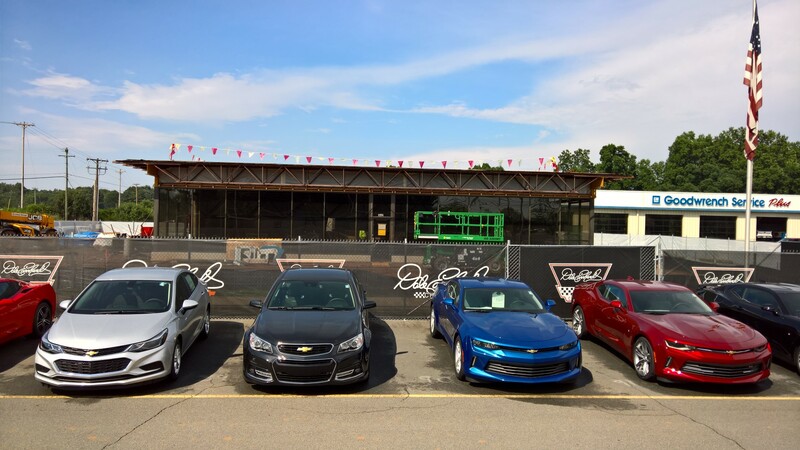 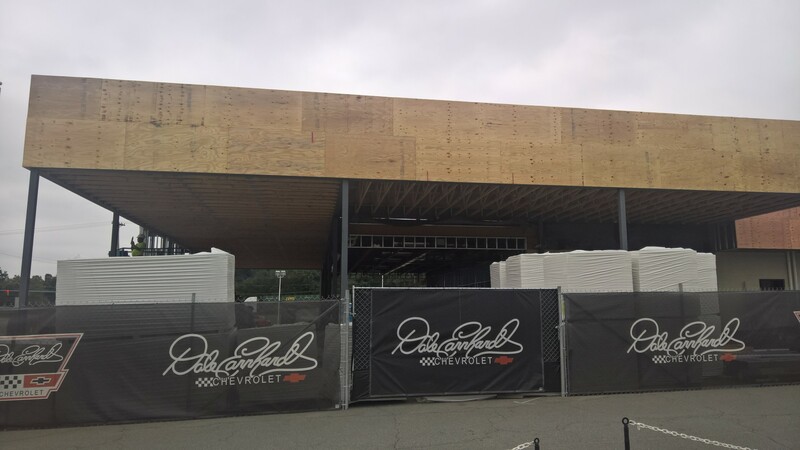 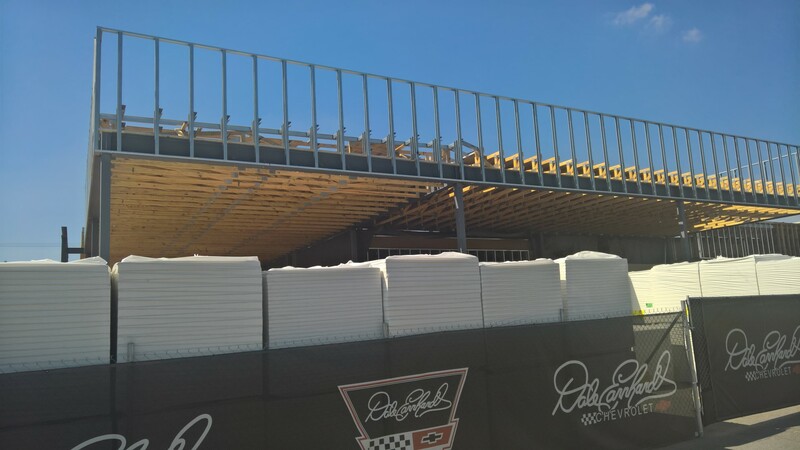 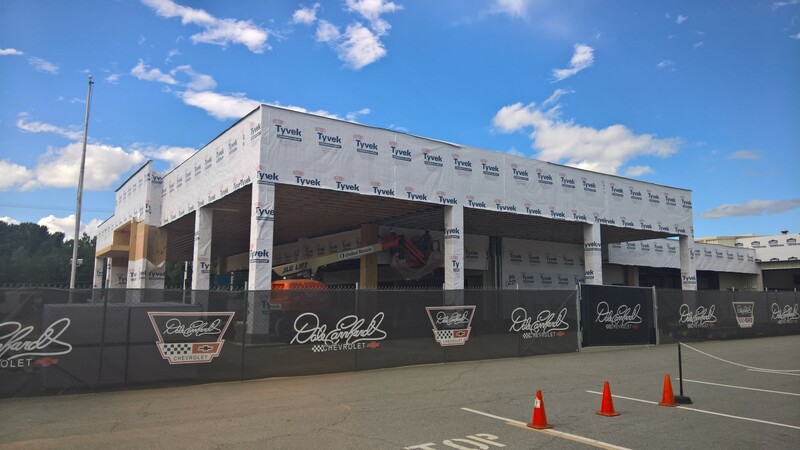 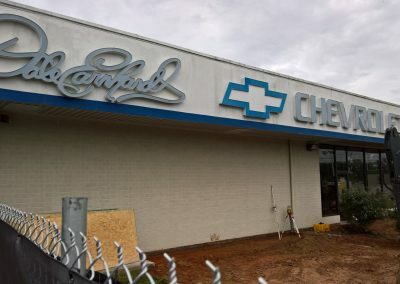 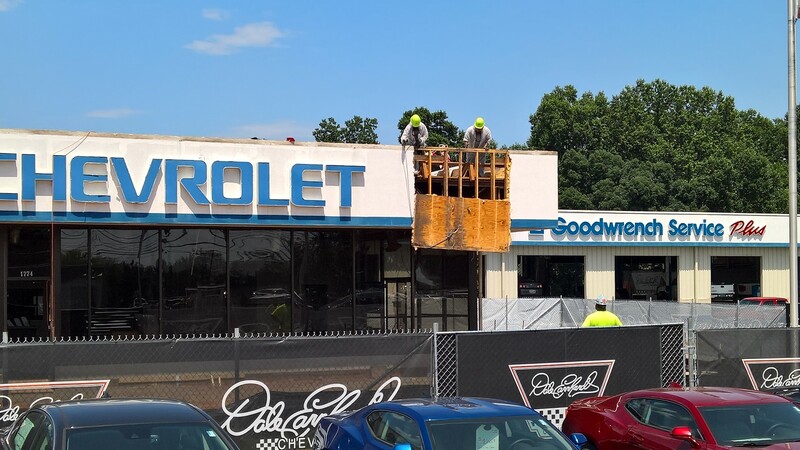 Dale Earnhardt Chevrolet will soon have a brand new look! 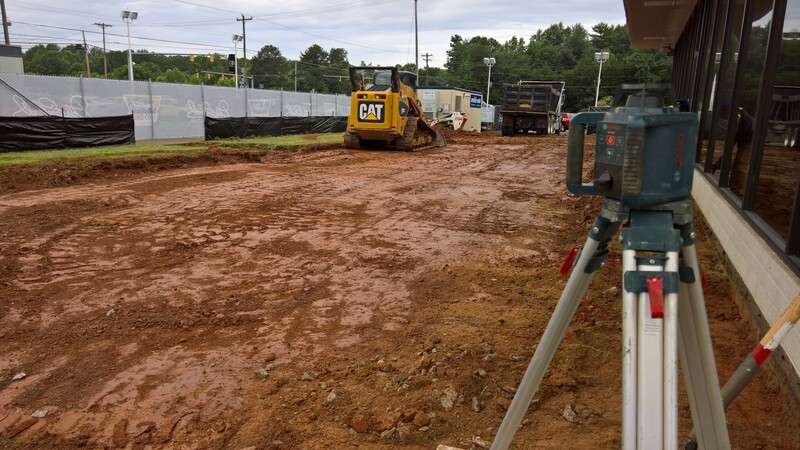 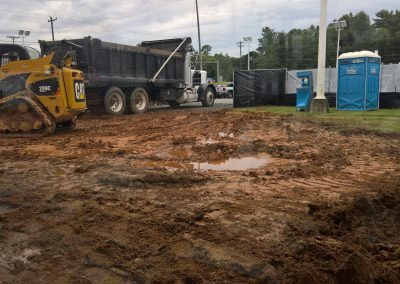 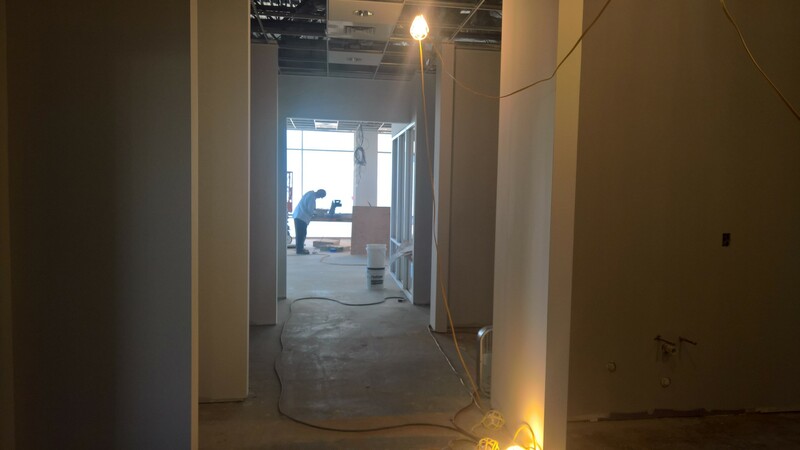 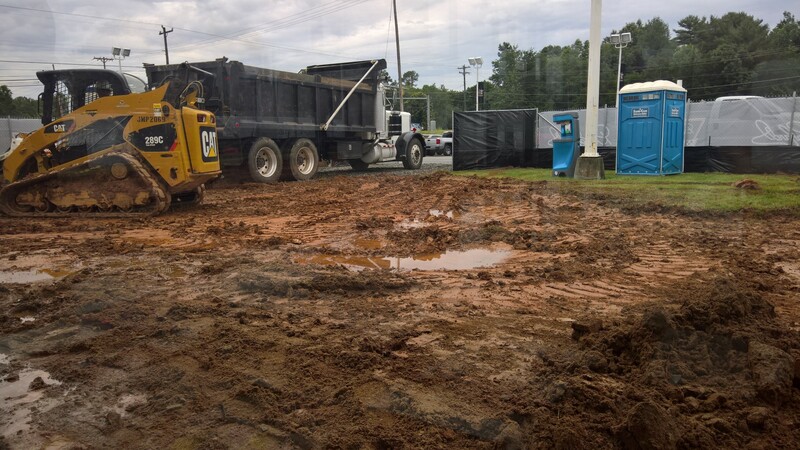 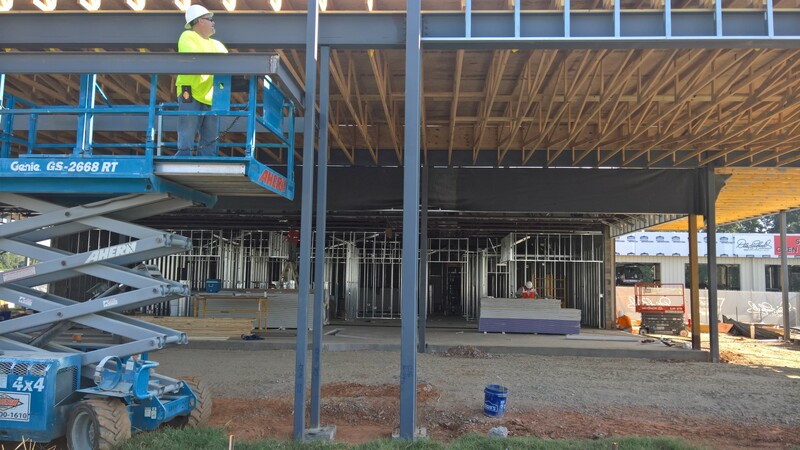 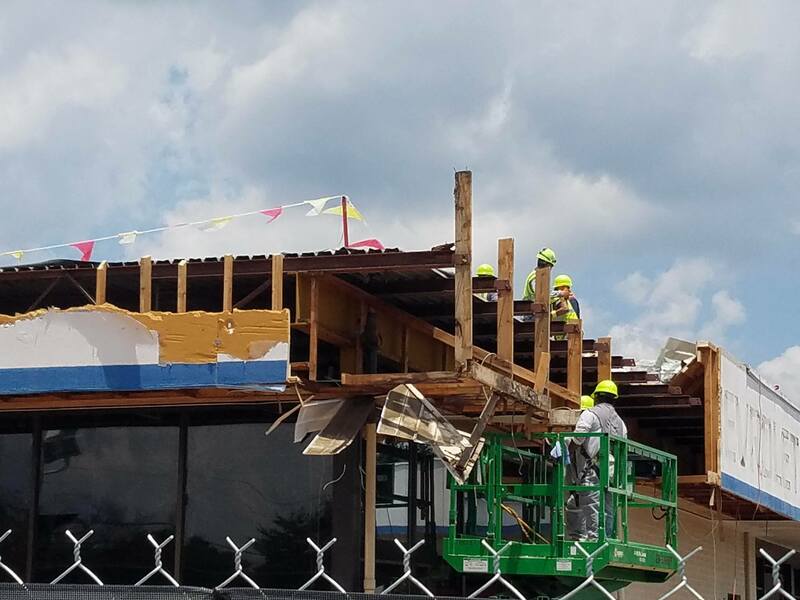 Keep checking back here to see updates to the construction. 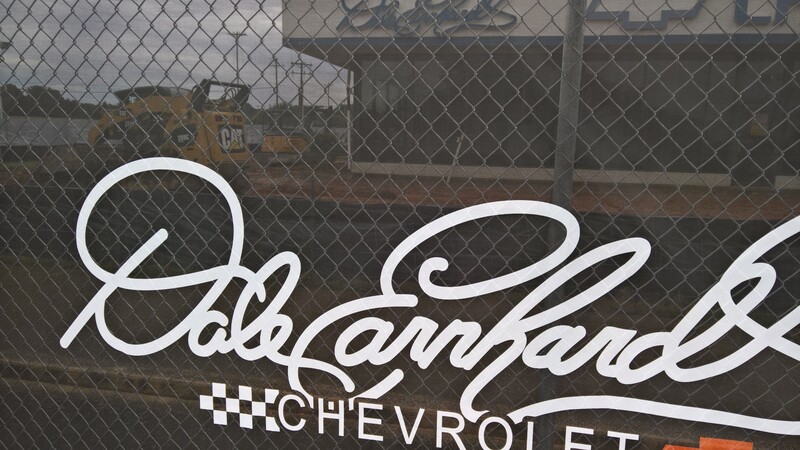 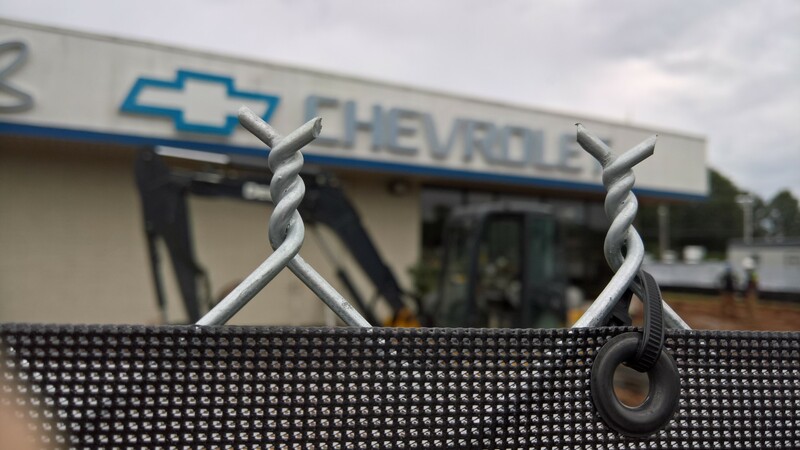 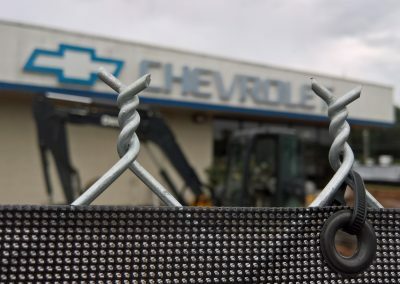 The fence has been put up and work has started on the grass directly outside our showroom. 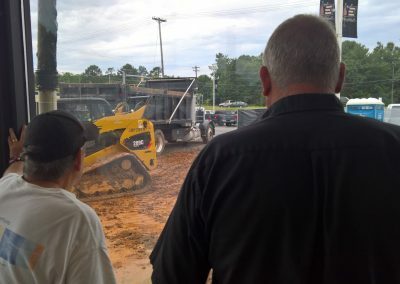 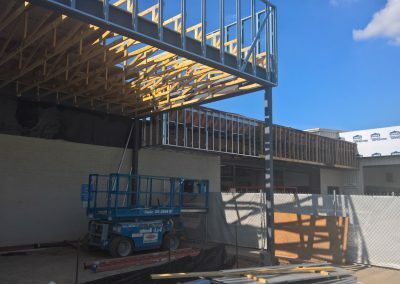 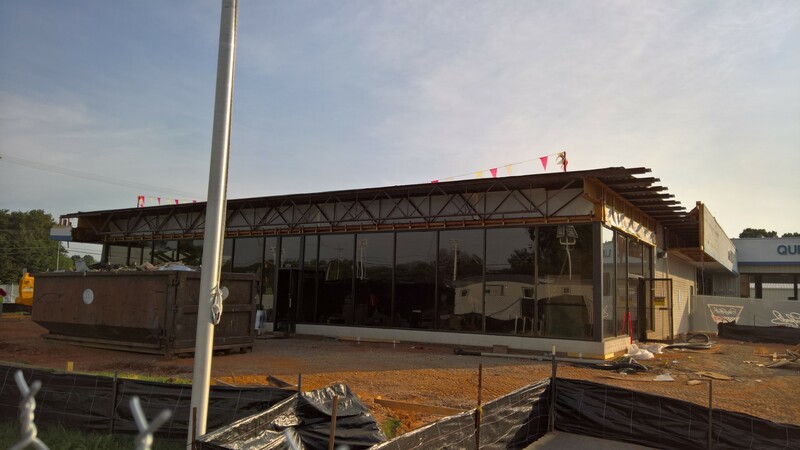 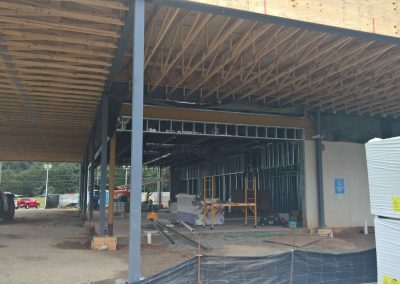 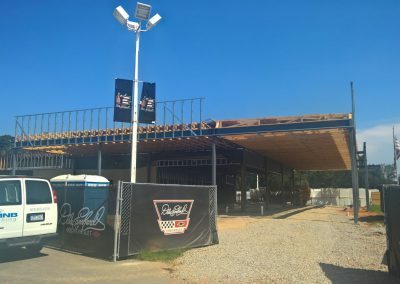 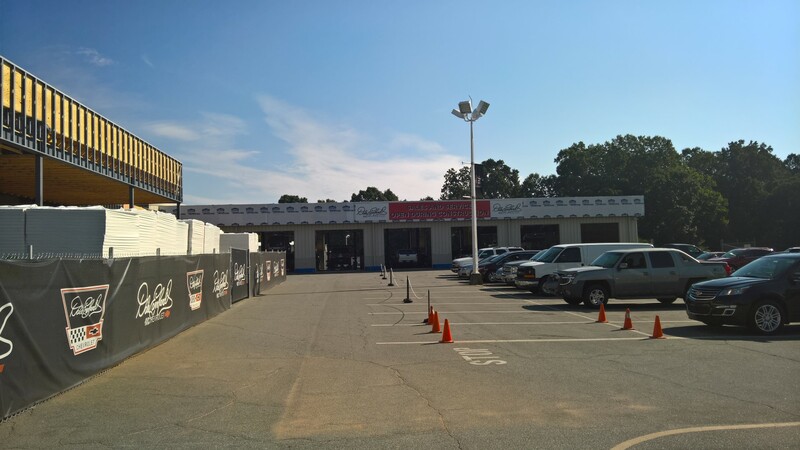 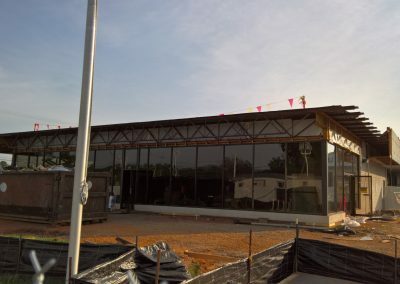 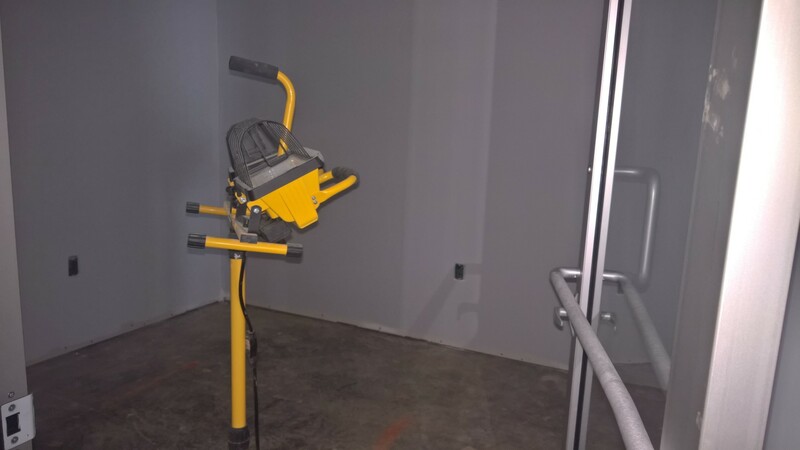 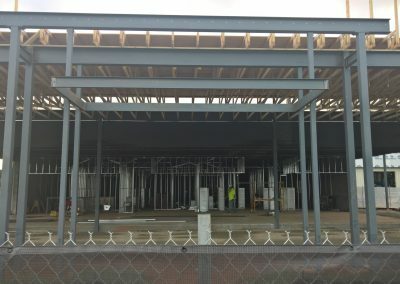 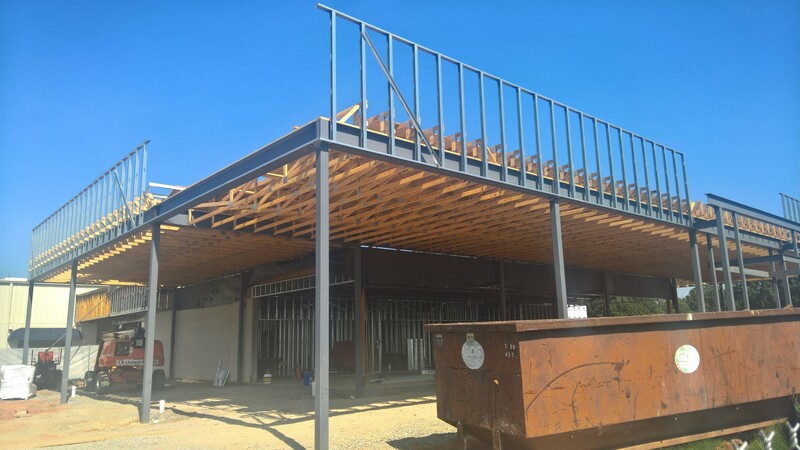 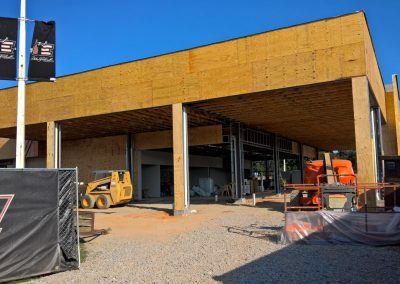 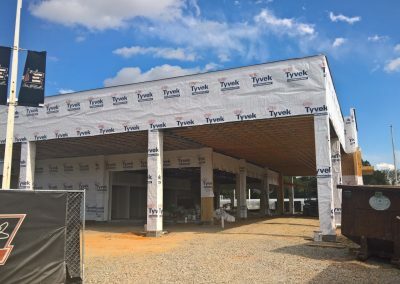 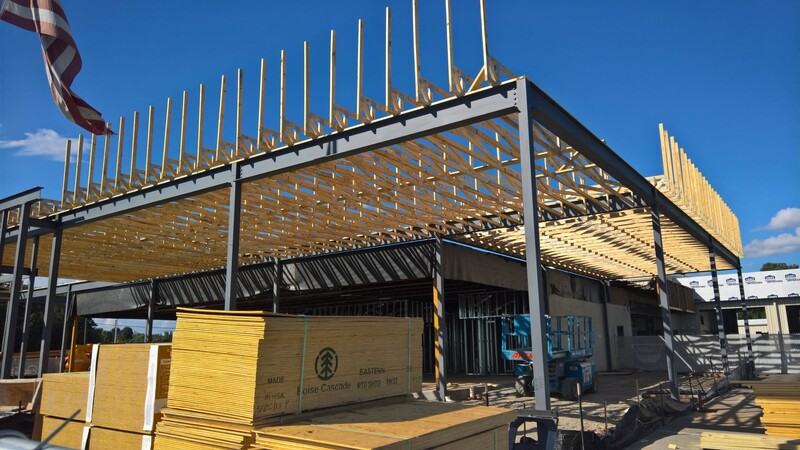 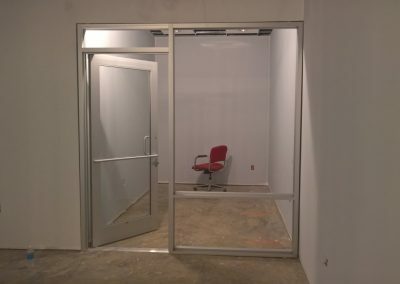 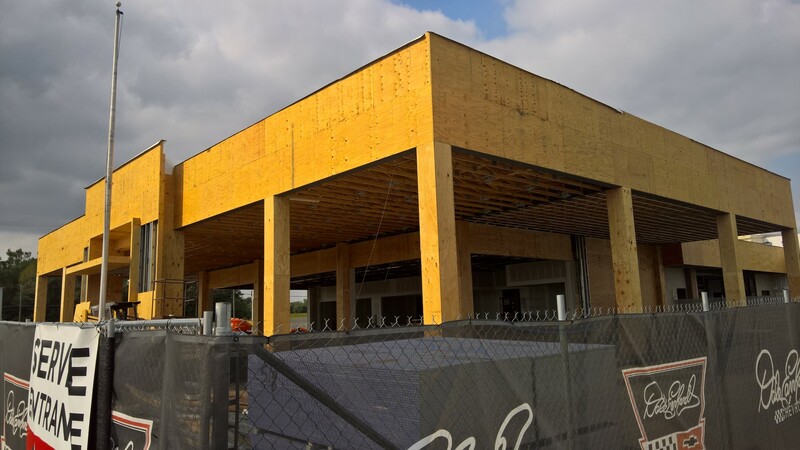 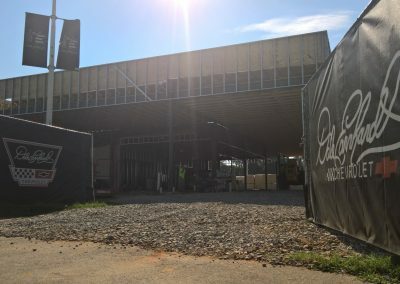 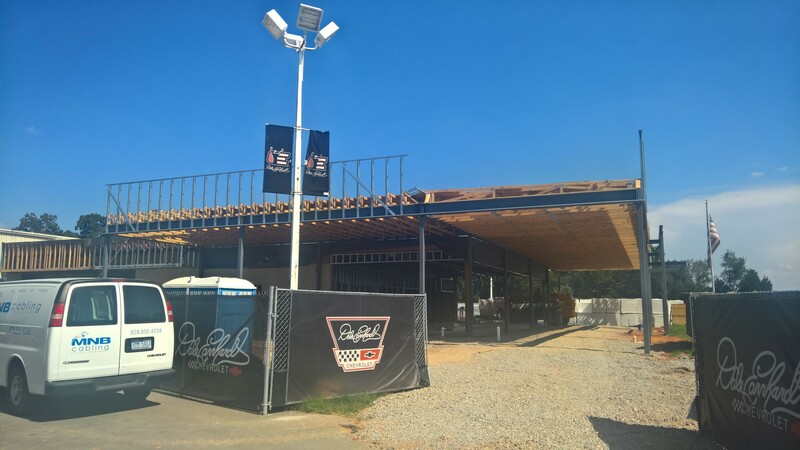 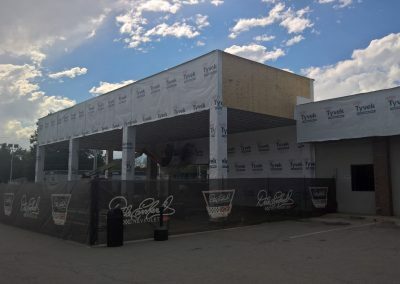 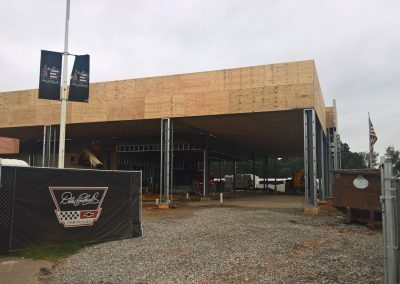 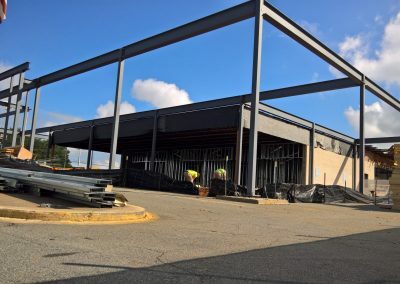 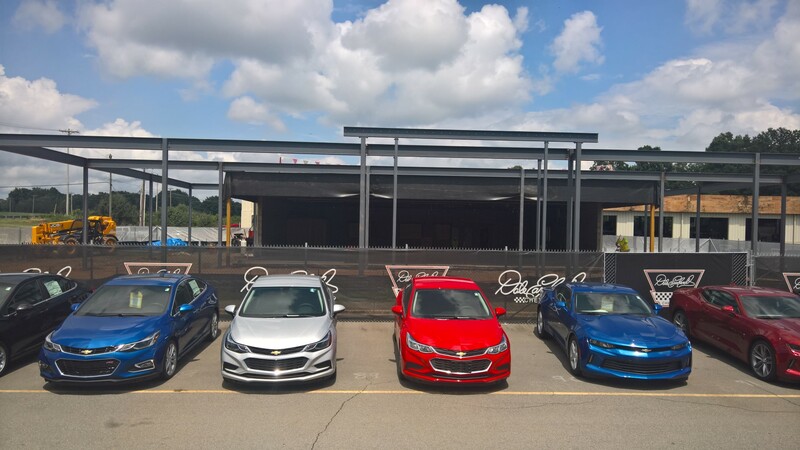 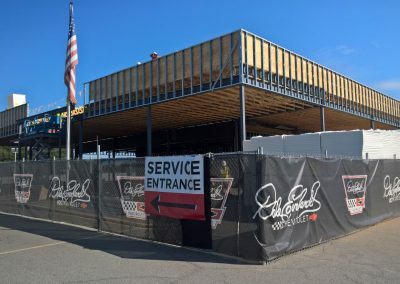 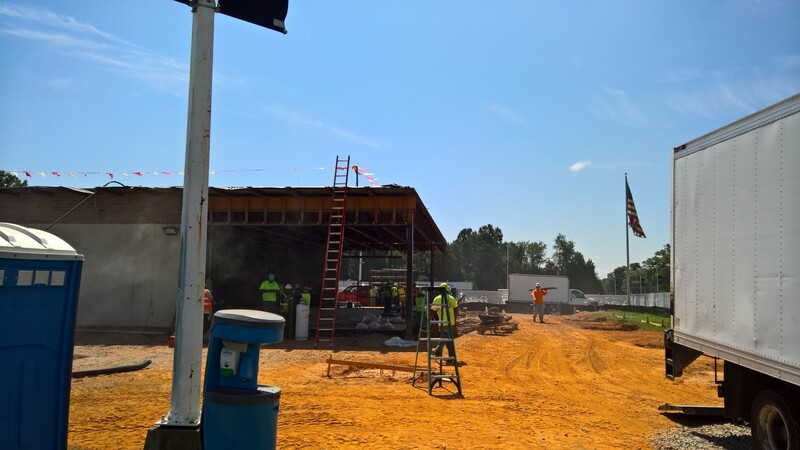 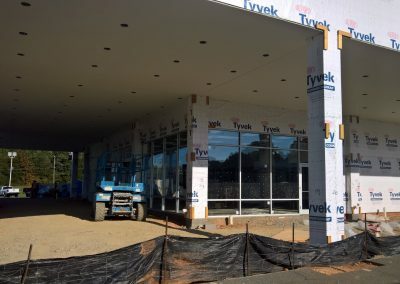 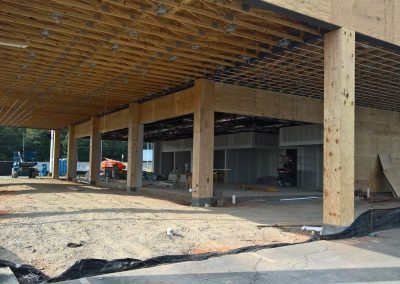 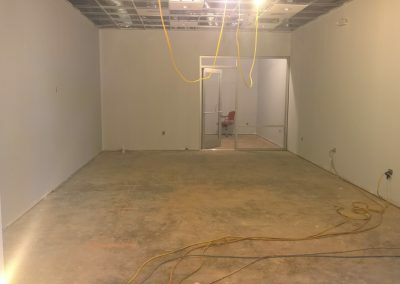 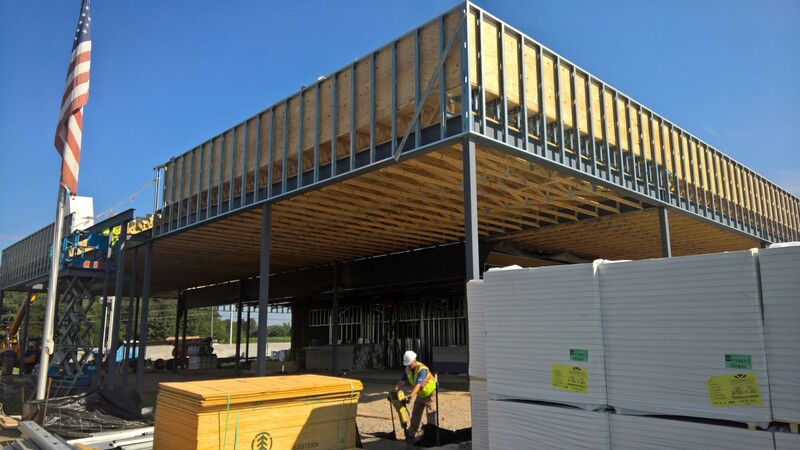 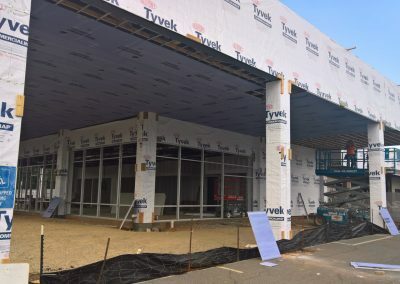 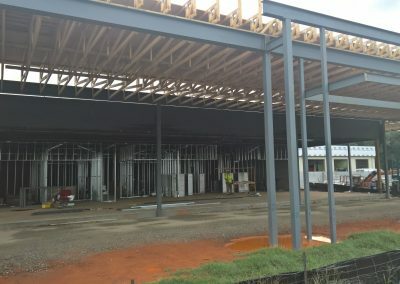 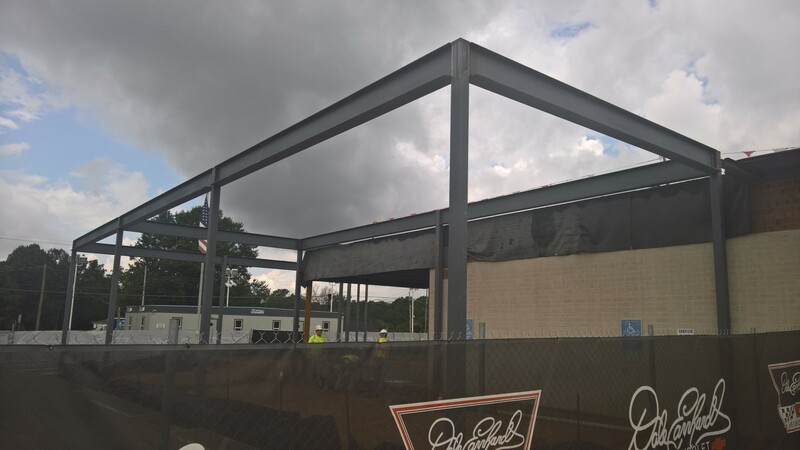 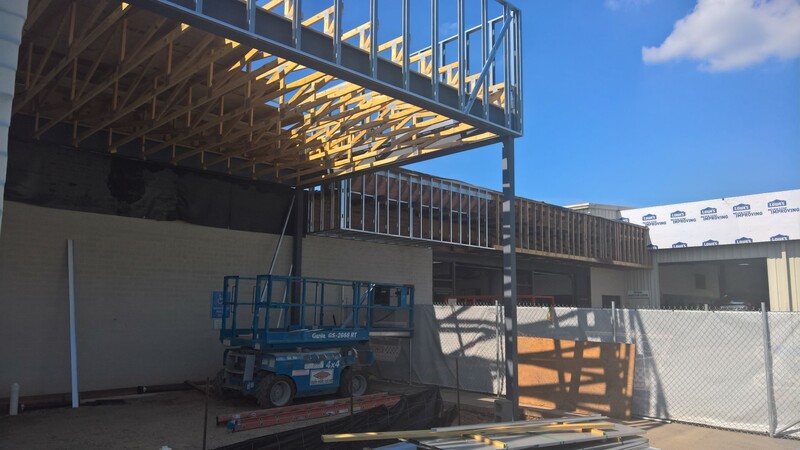 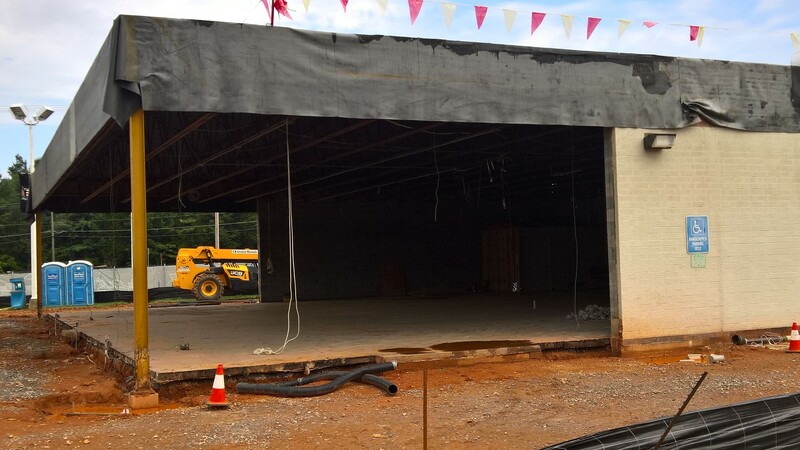 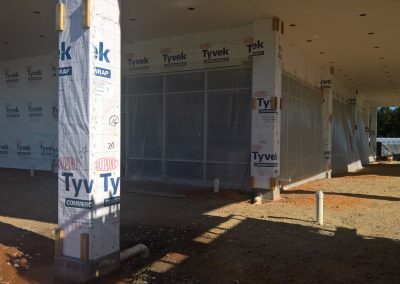 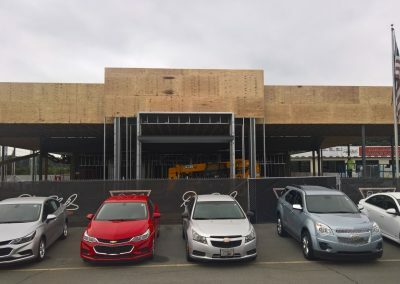 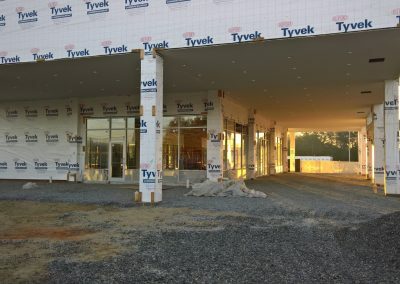 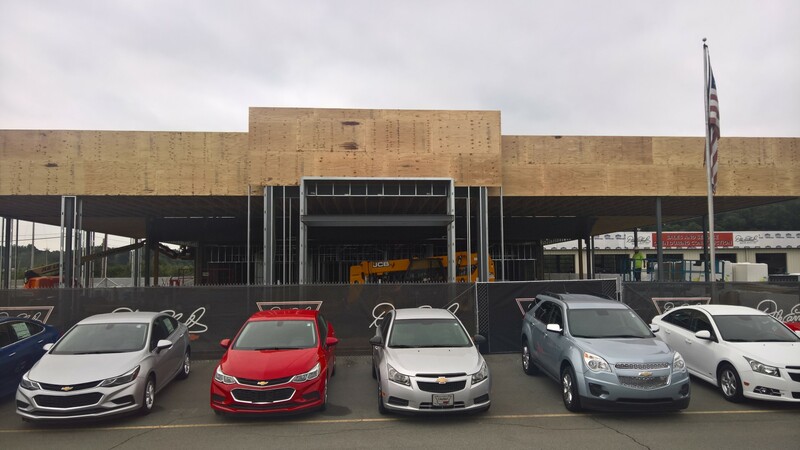 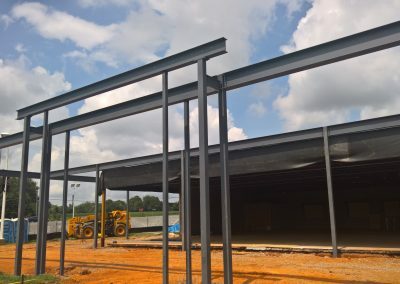 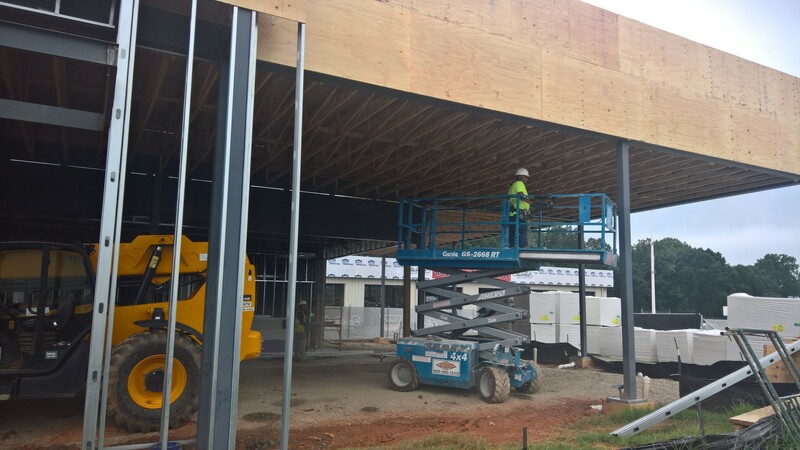 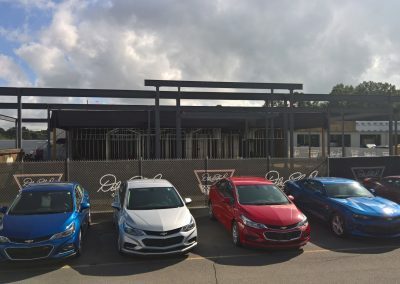 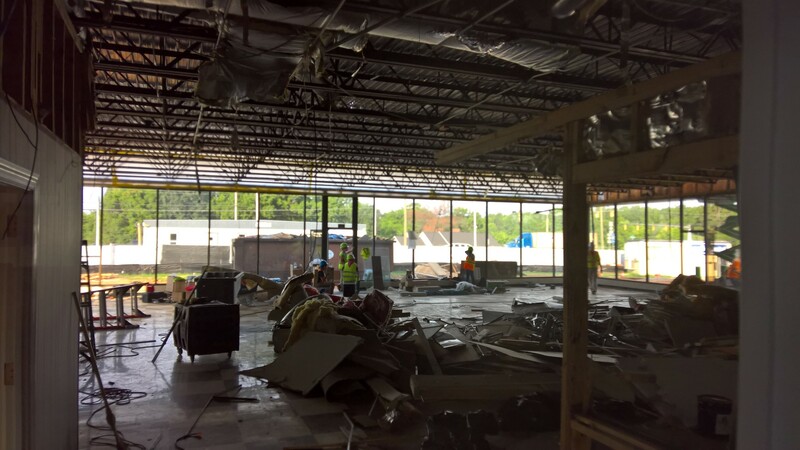 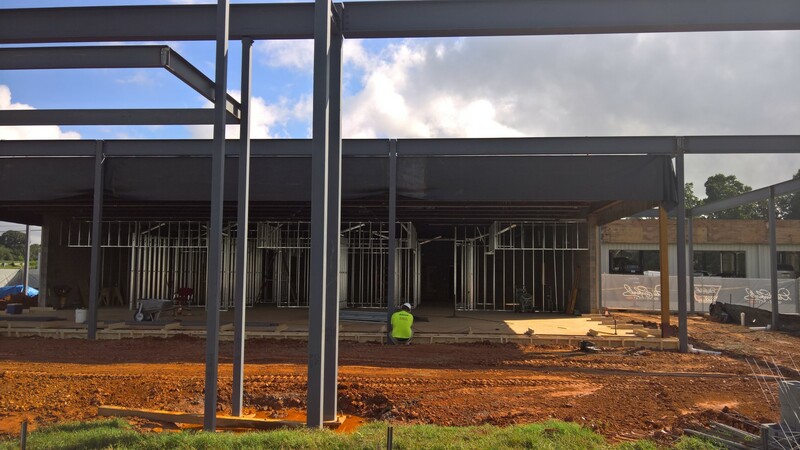 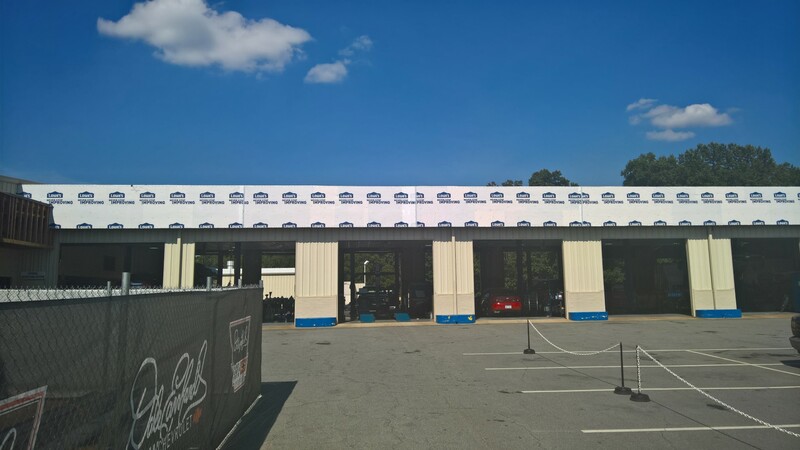 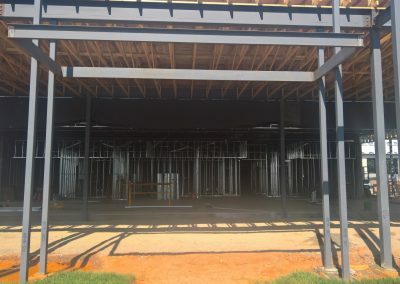 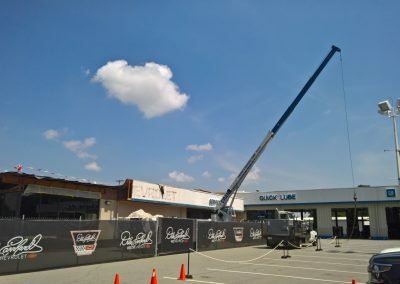 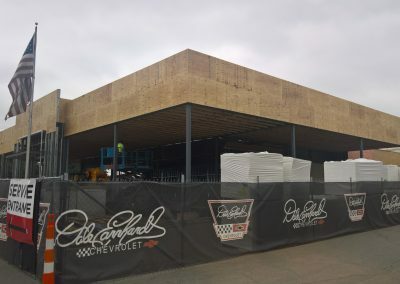 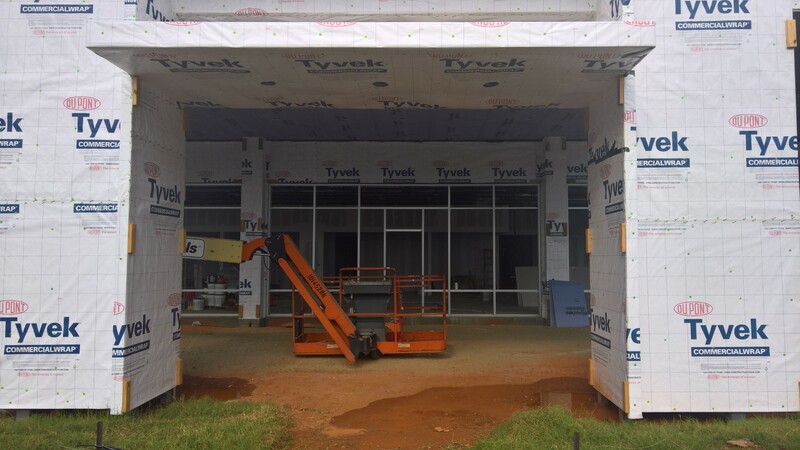 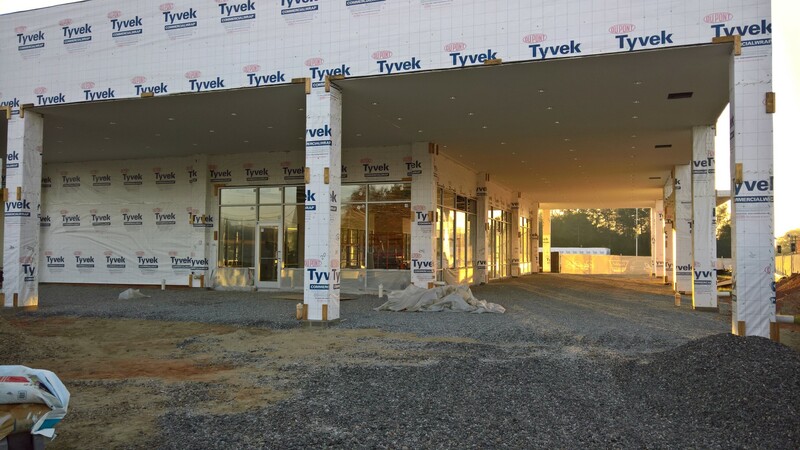 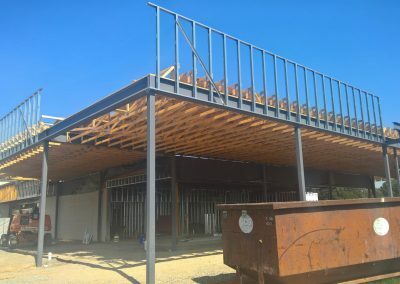 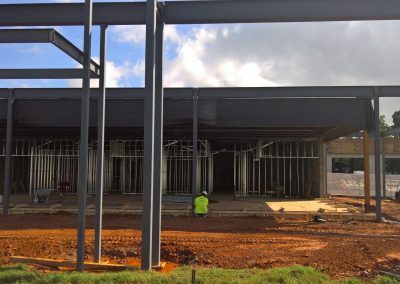 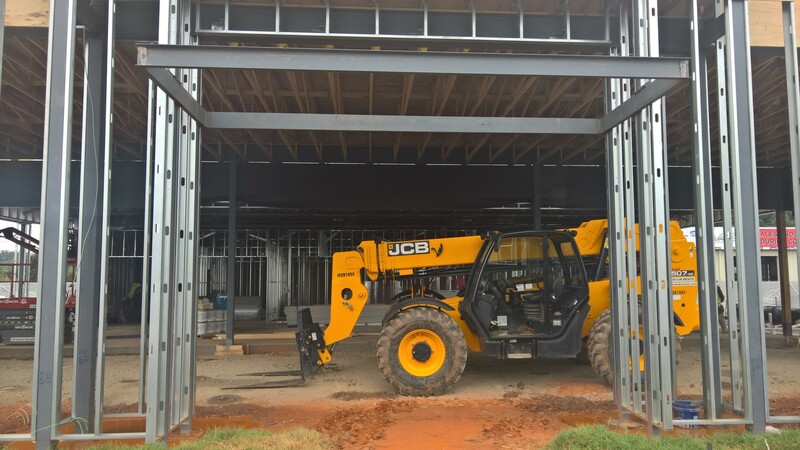 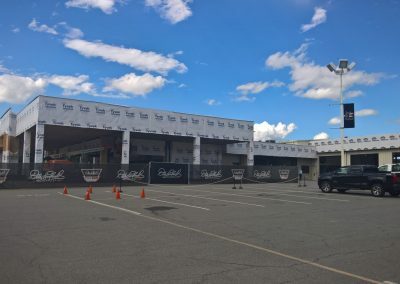 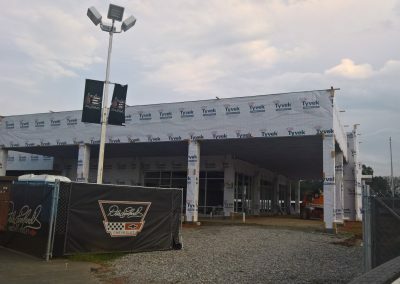 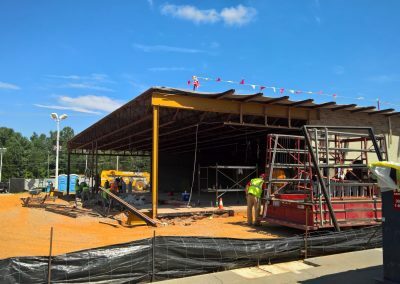 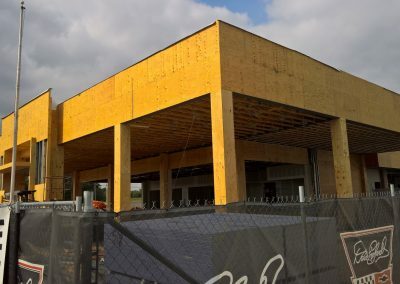 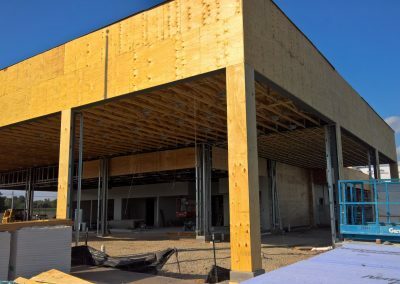 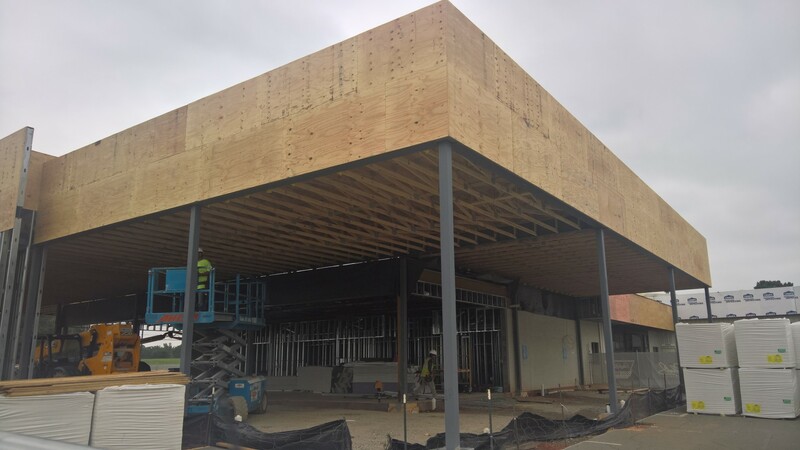 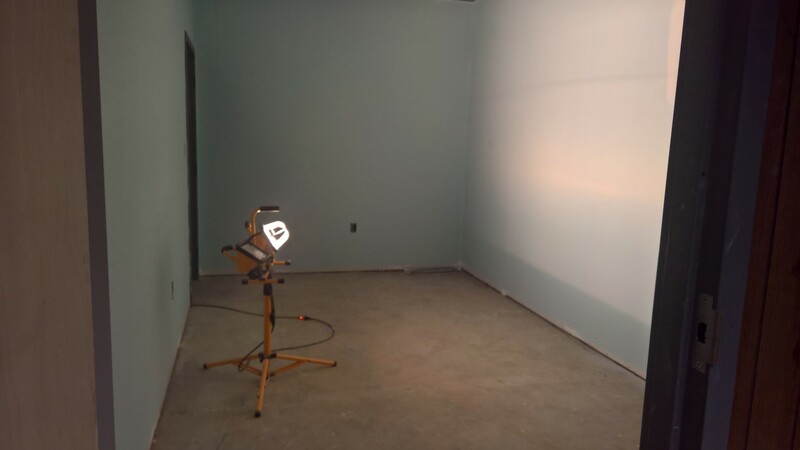 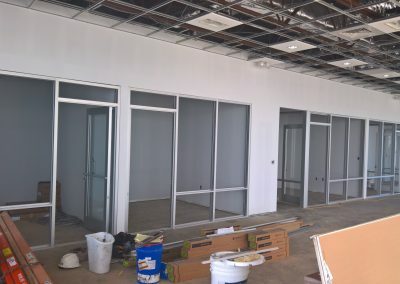 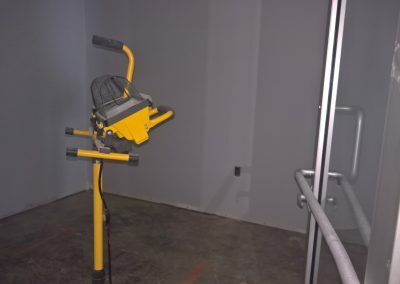 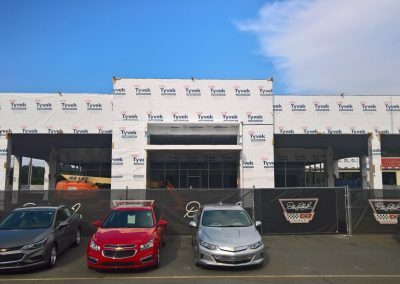 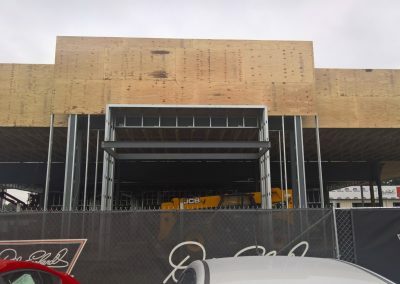 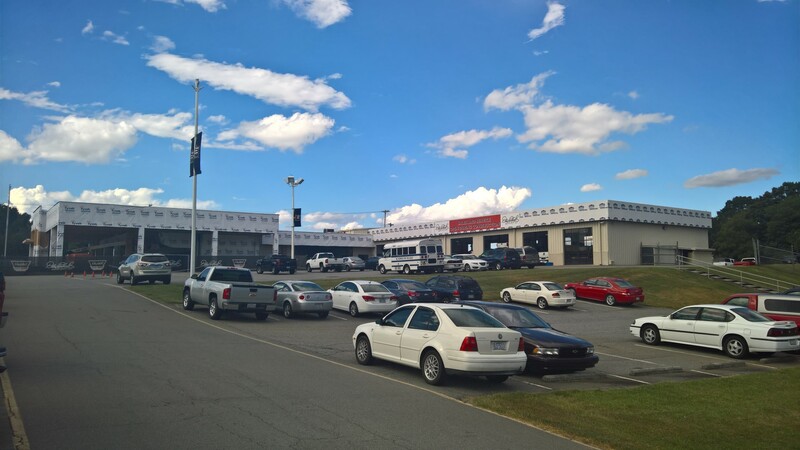 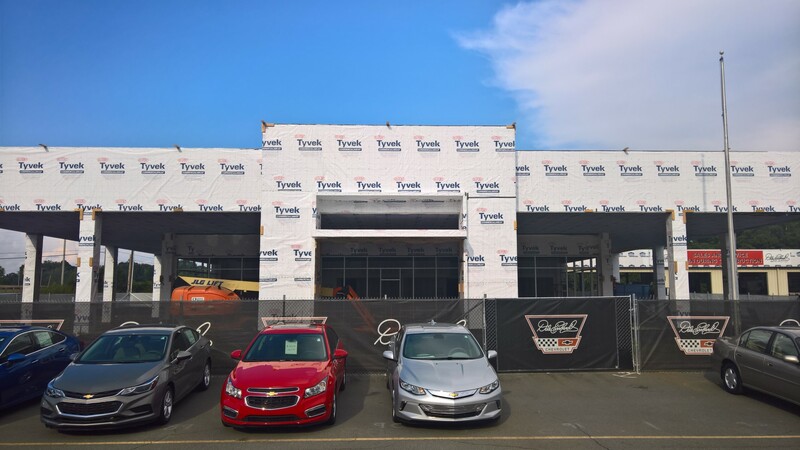 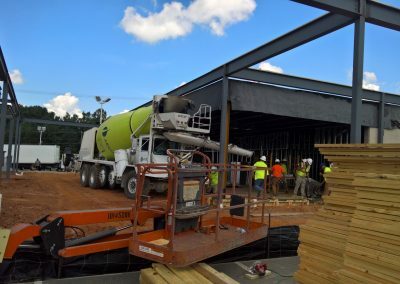 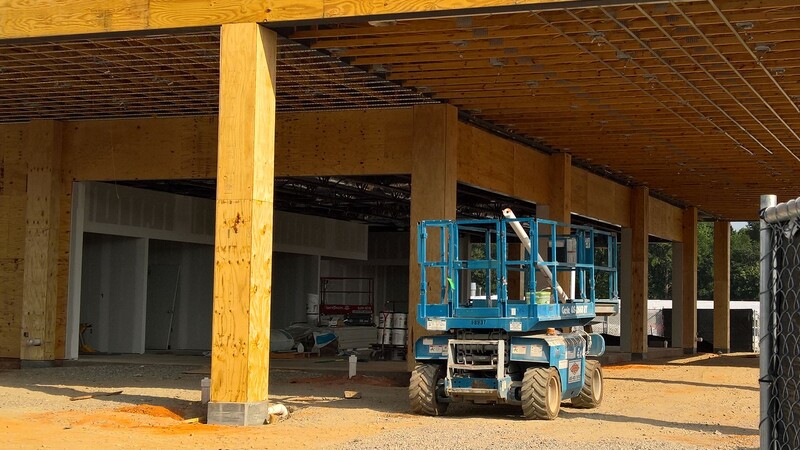 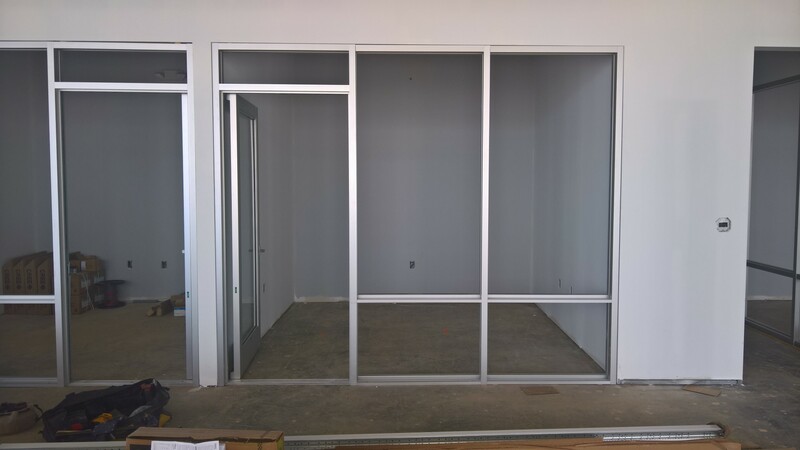 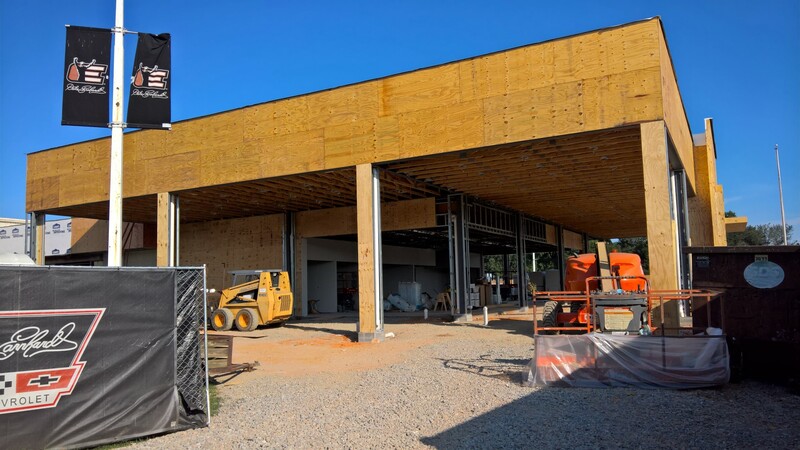 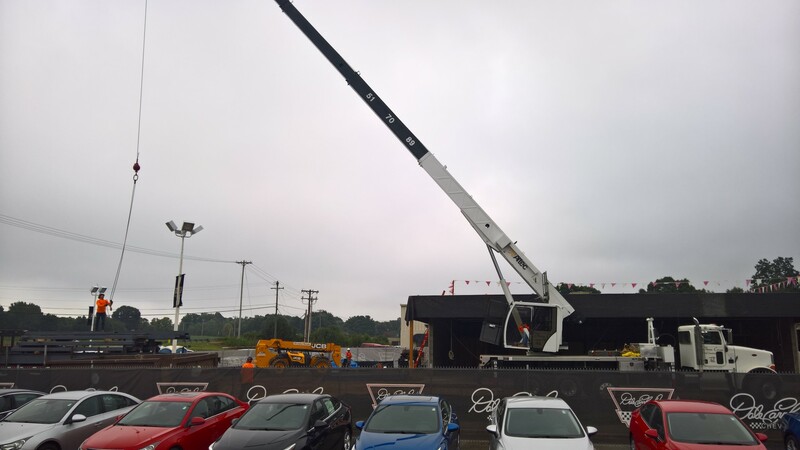 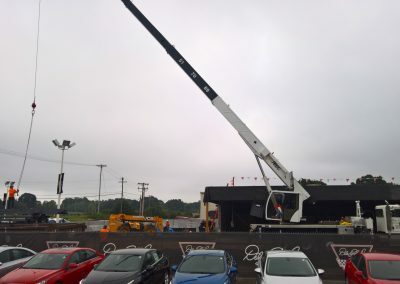 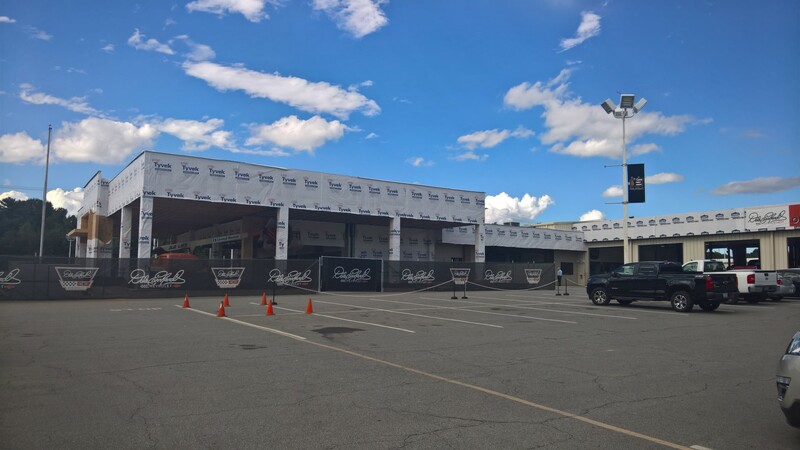 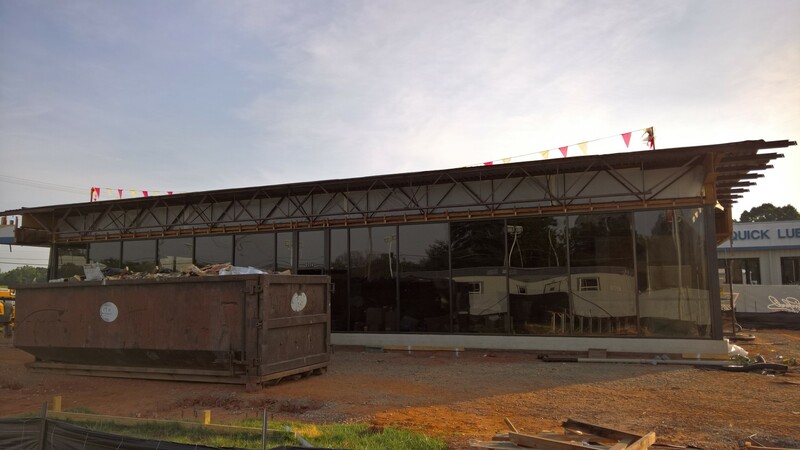 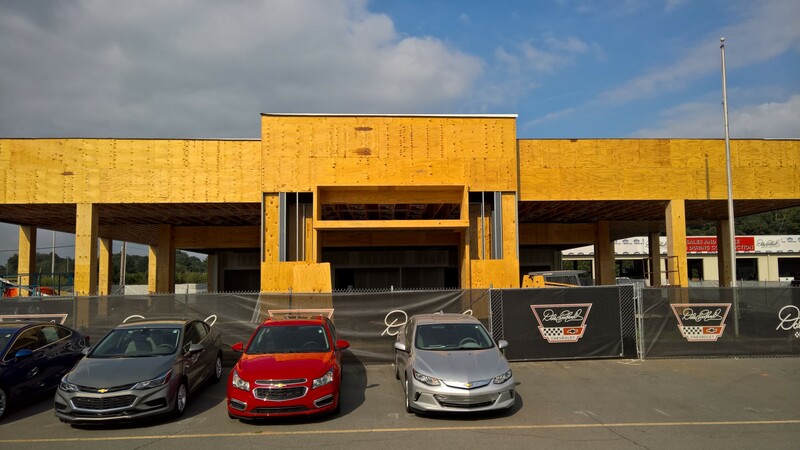 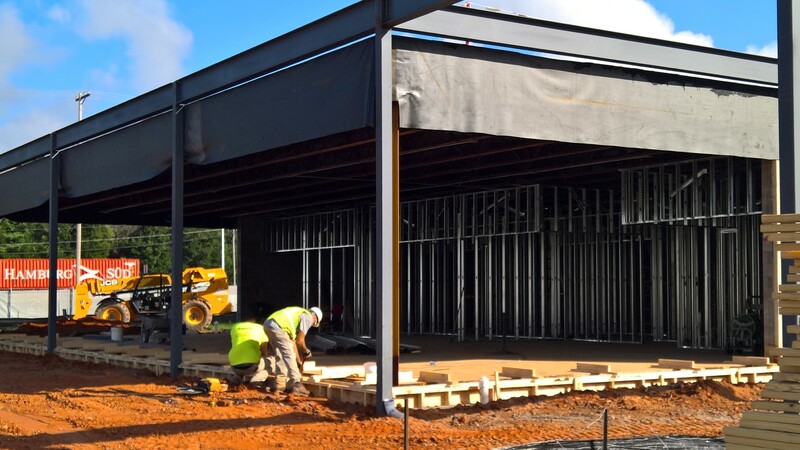 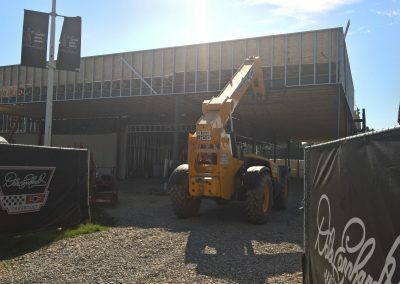 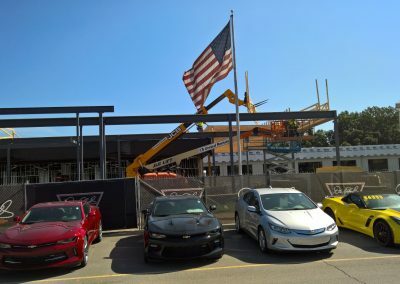 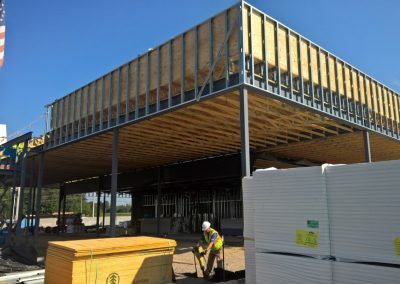 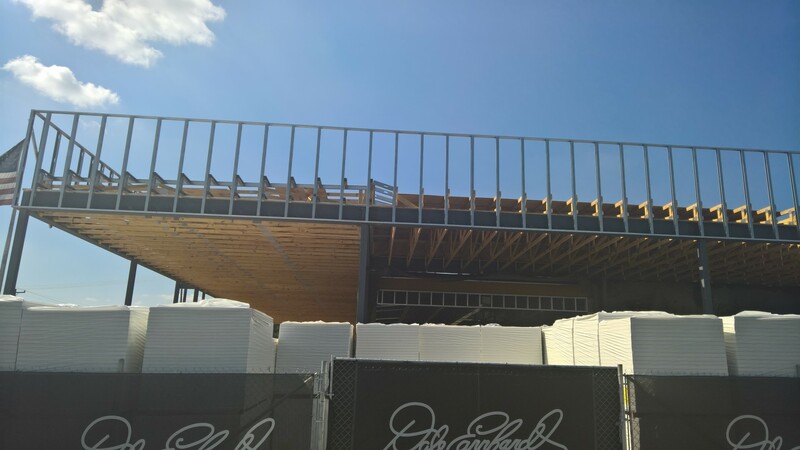 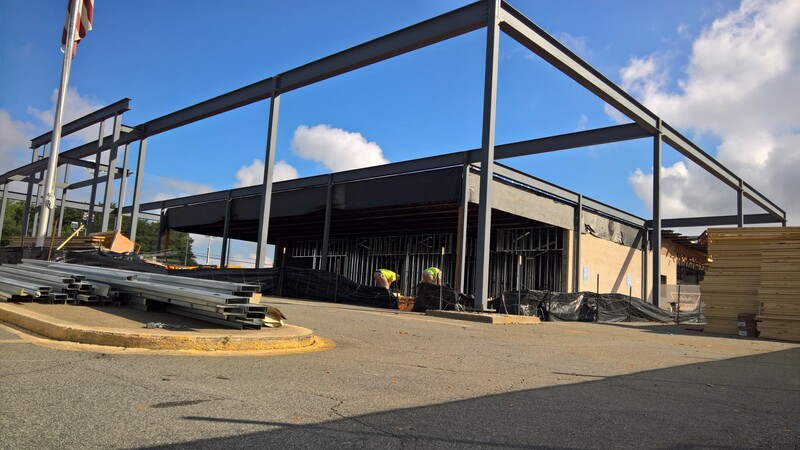 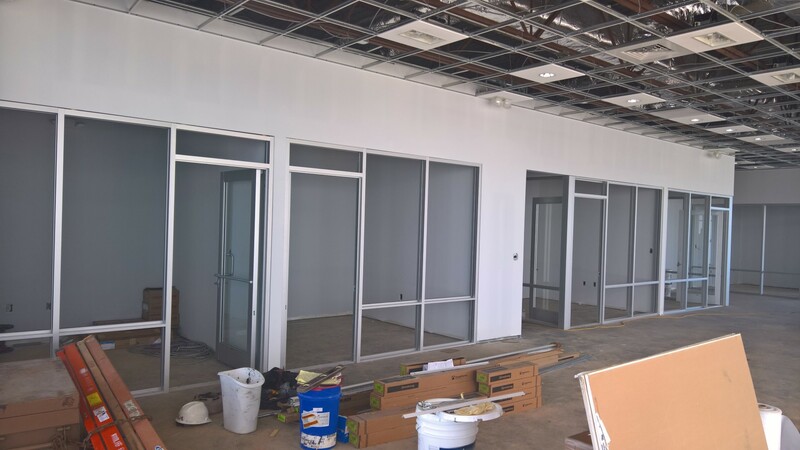 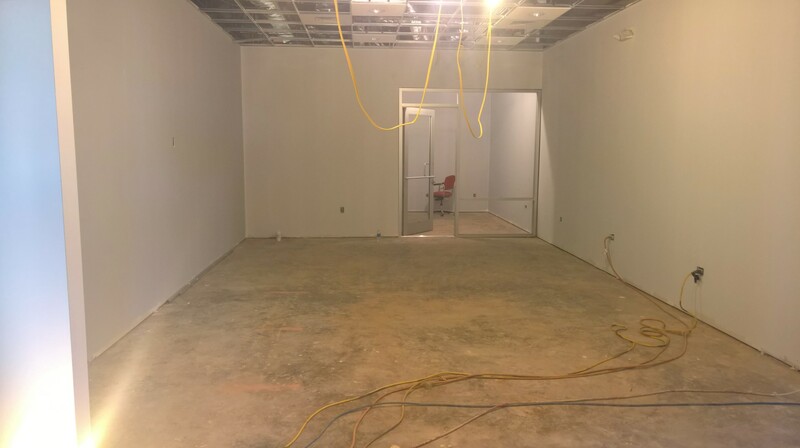 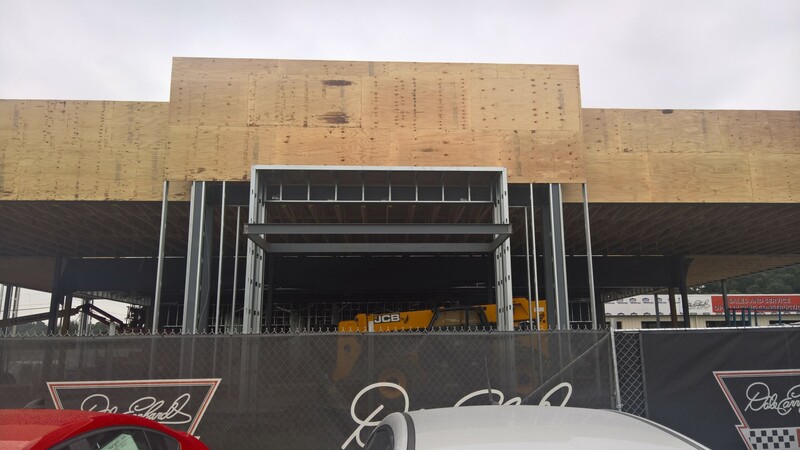 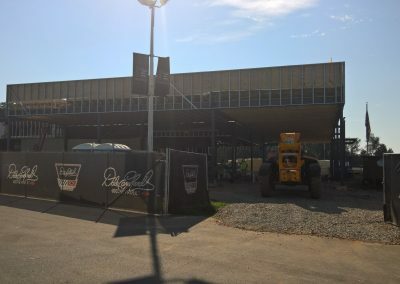 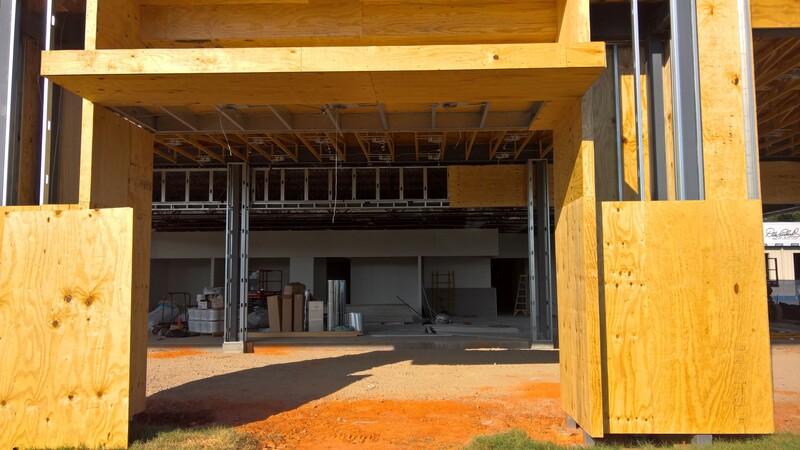 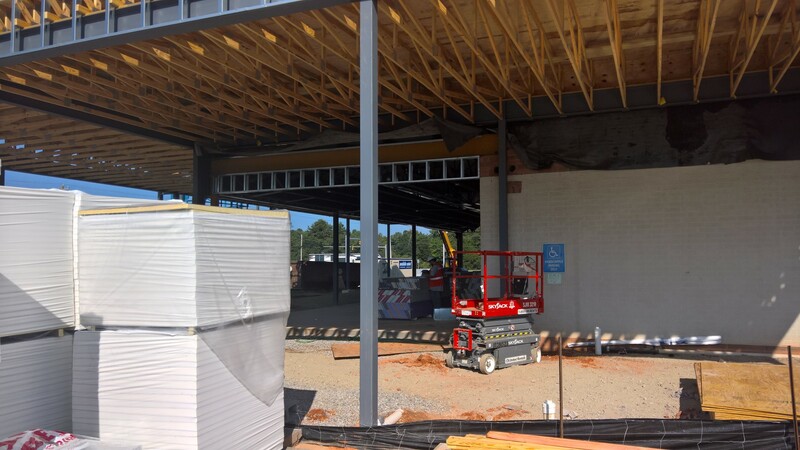 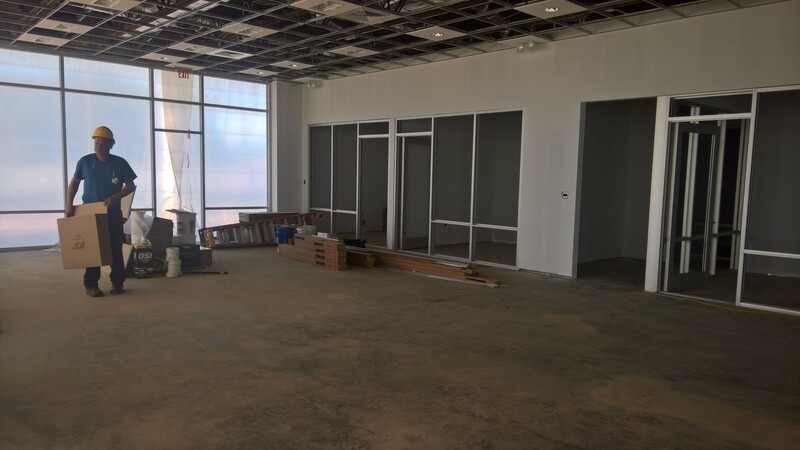 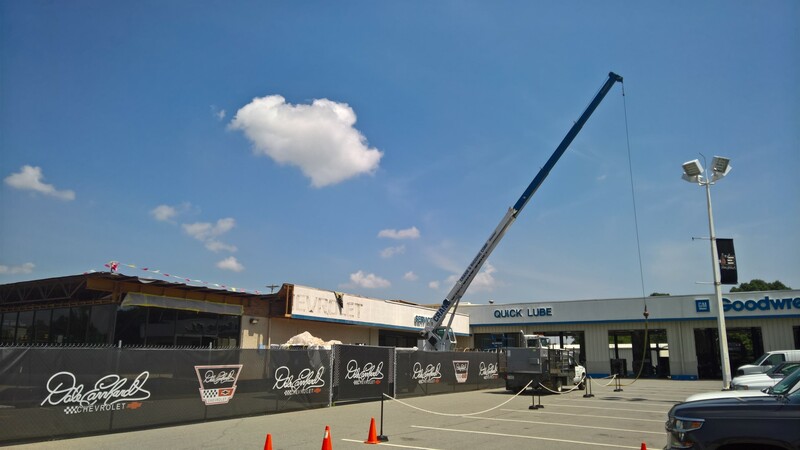 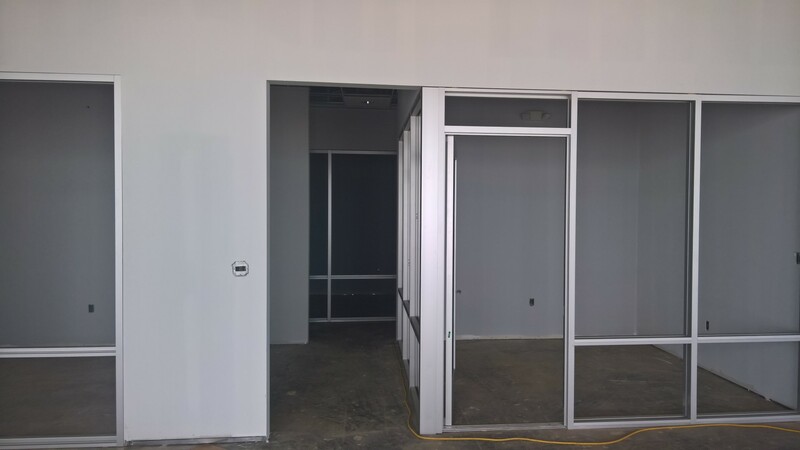 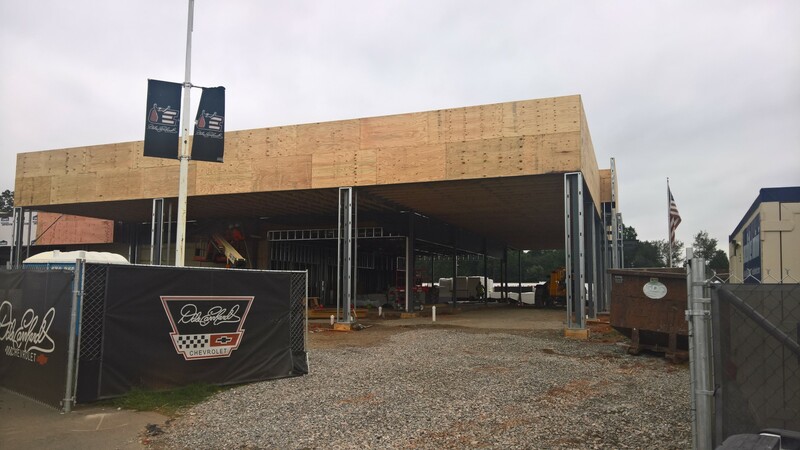 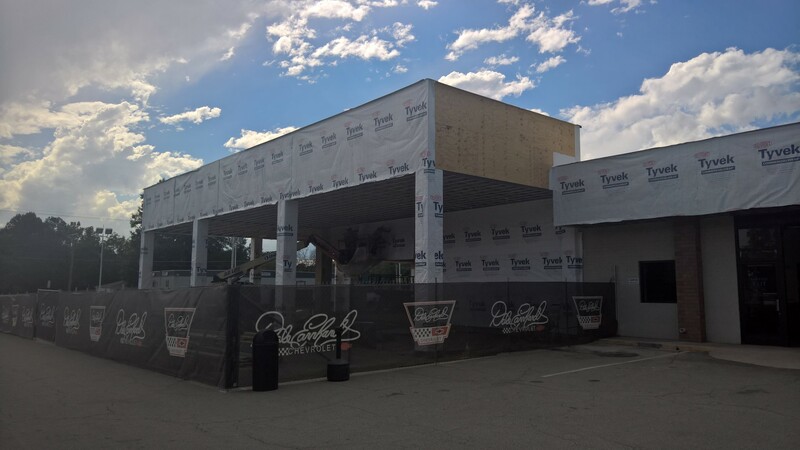 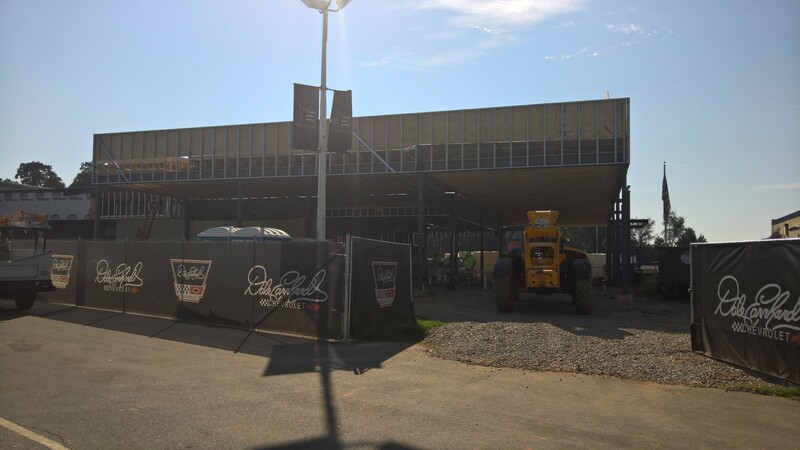 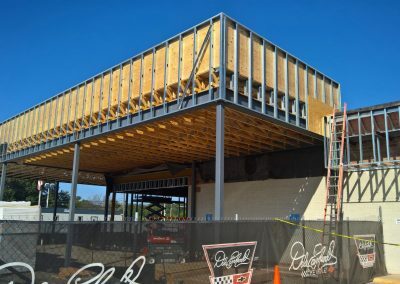 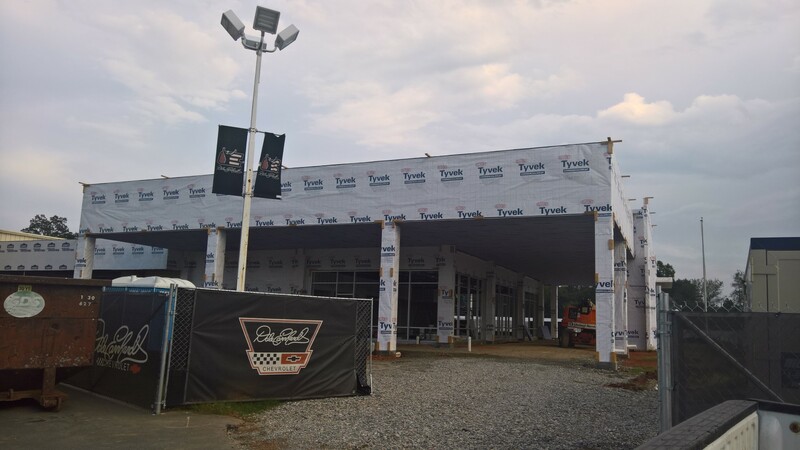 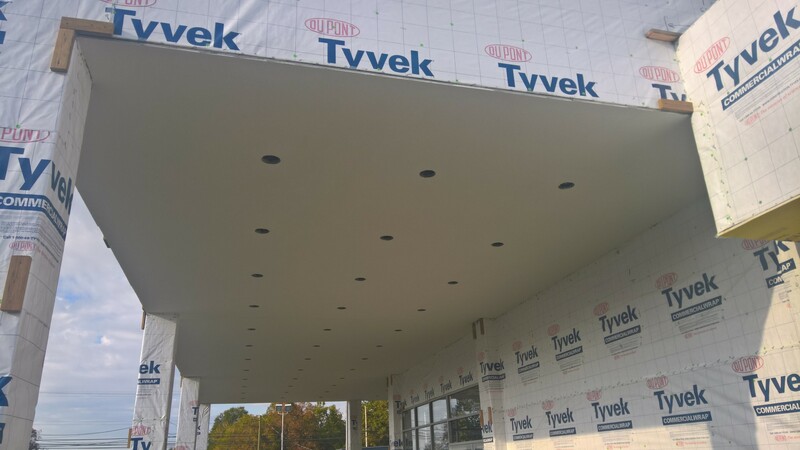 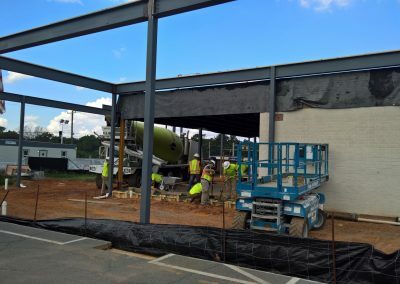 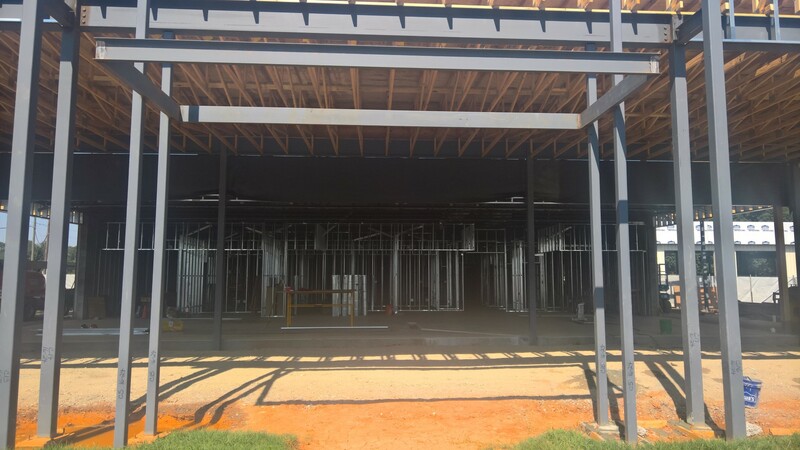 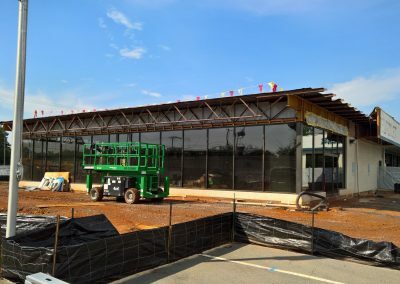 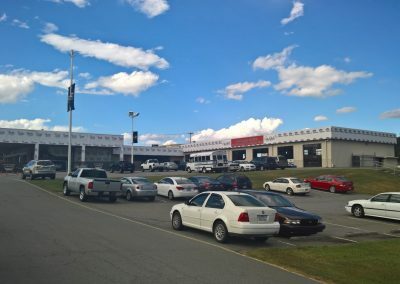 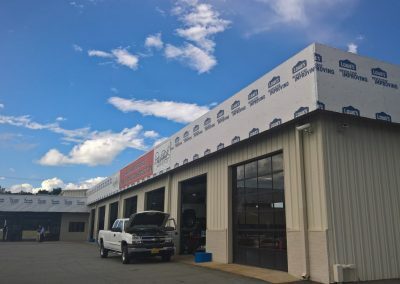 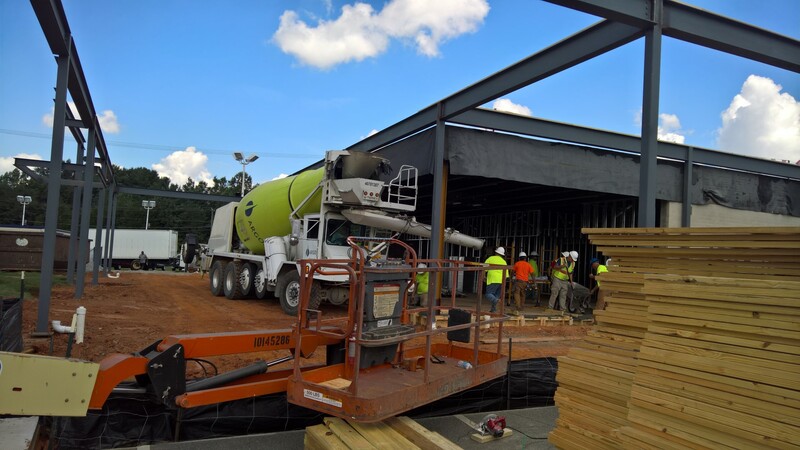 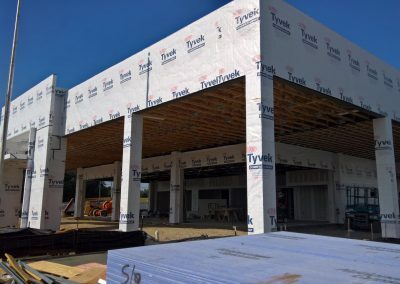 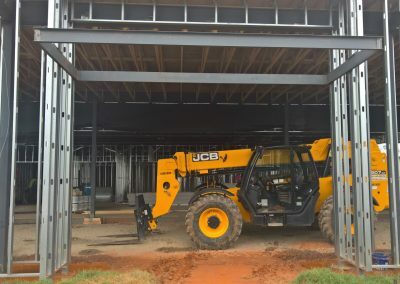 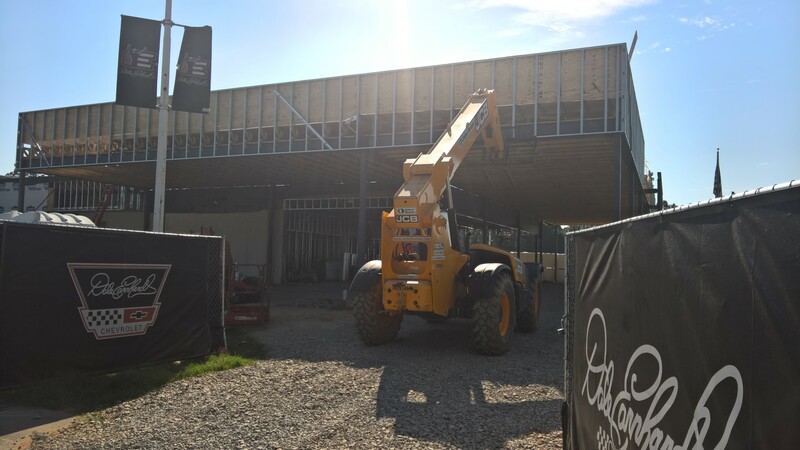 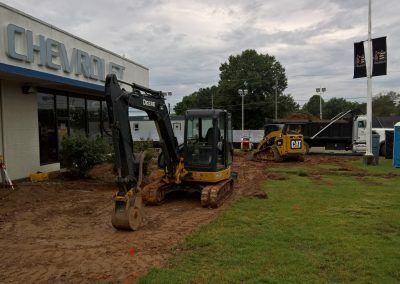 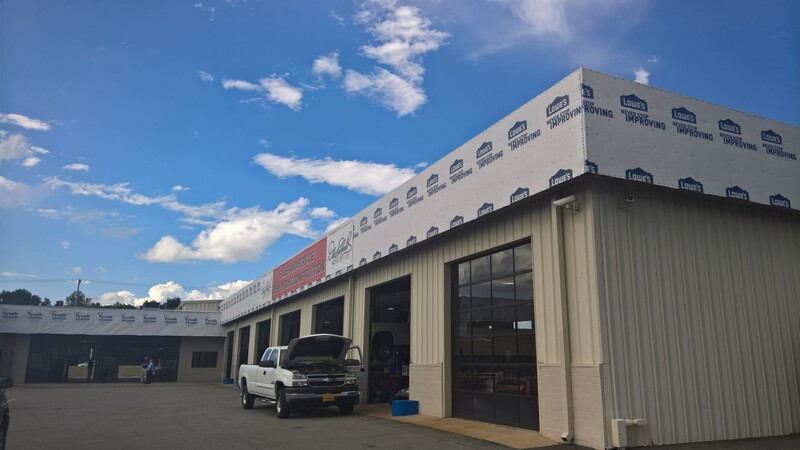 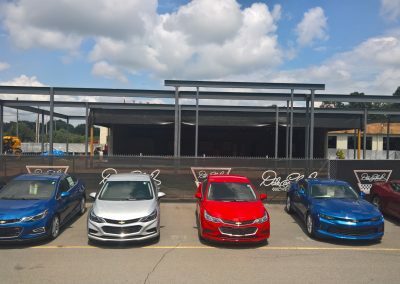 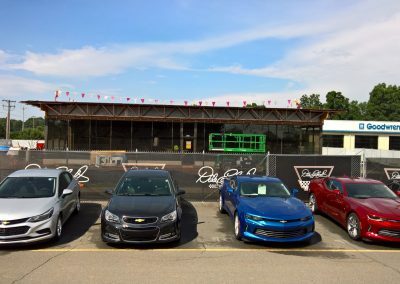 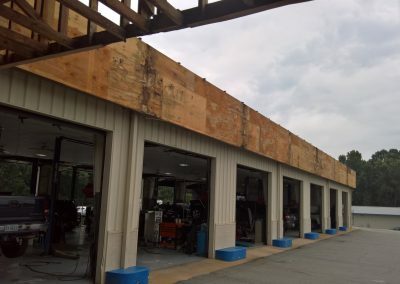 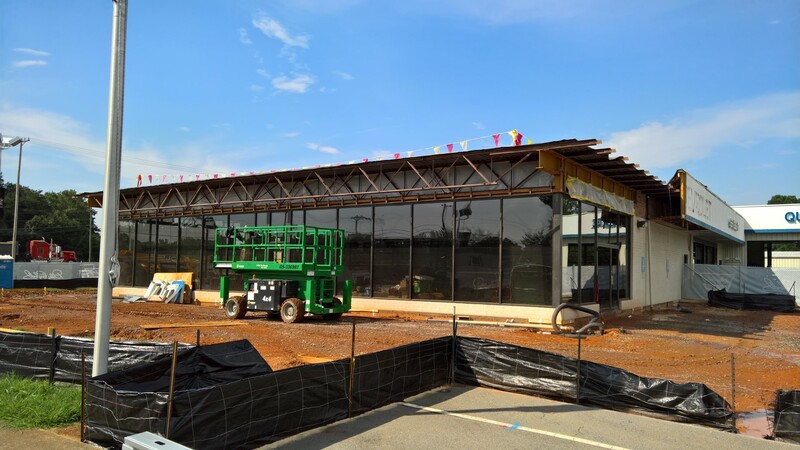 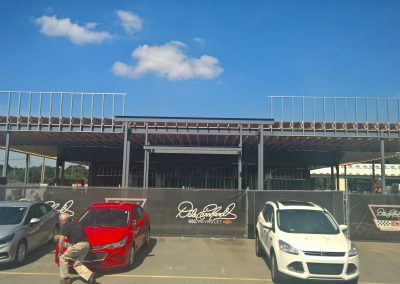 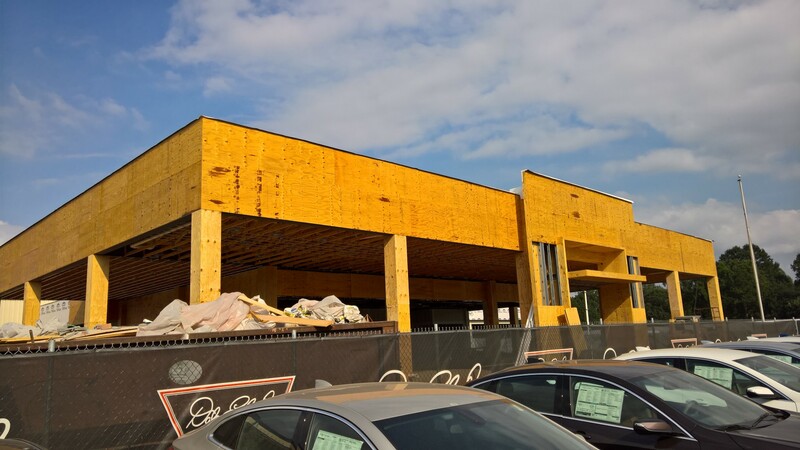 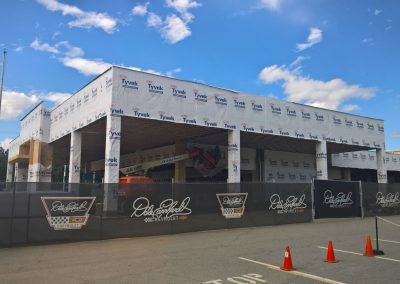 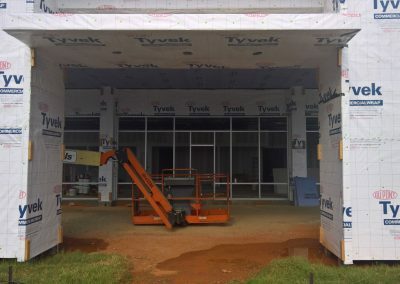 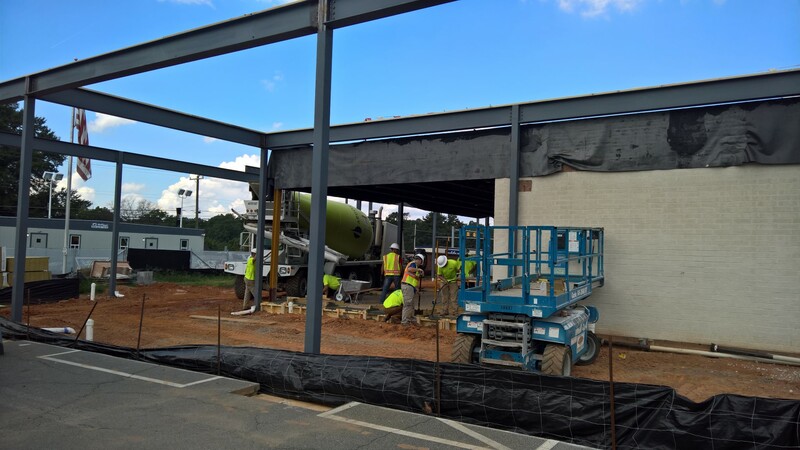 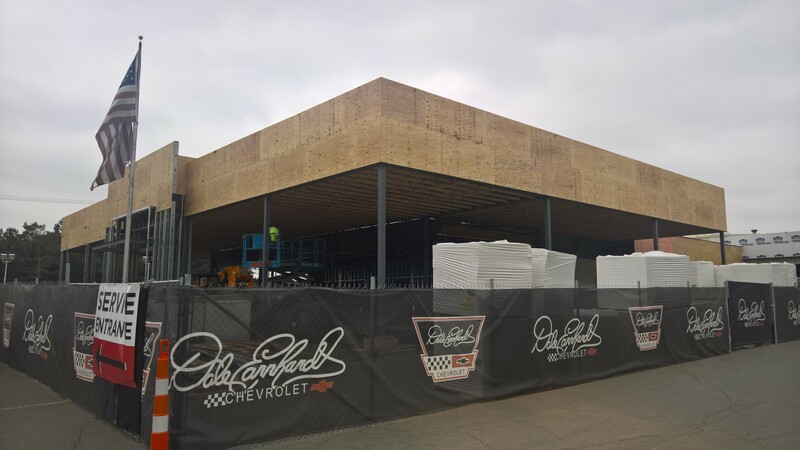 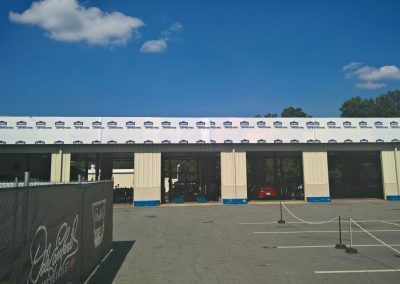 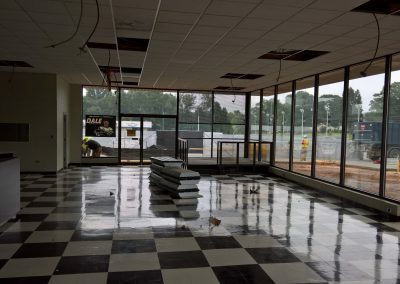 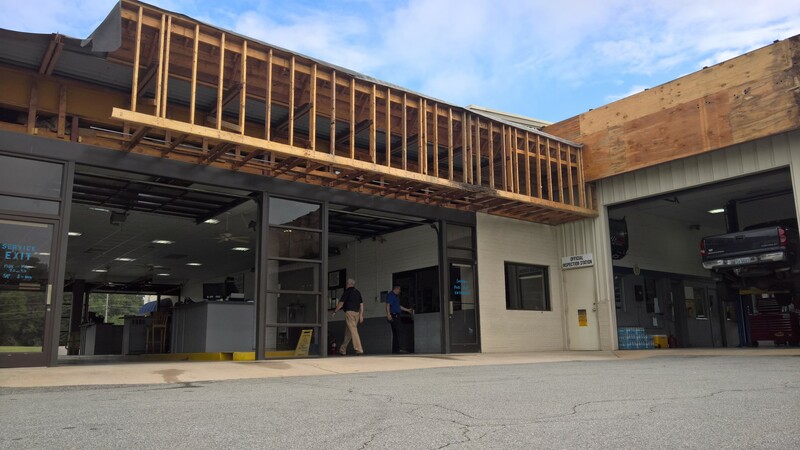 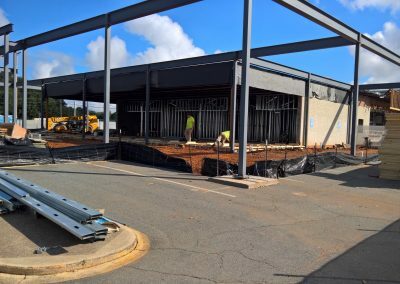 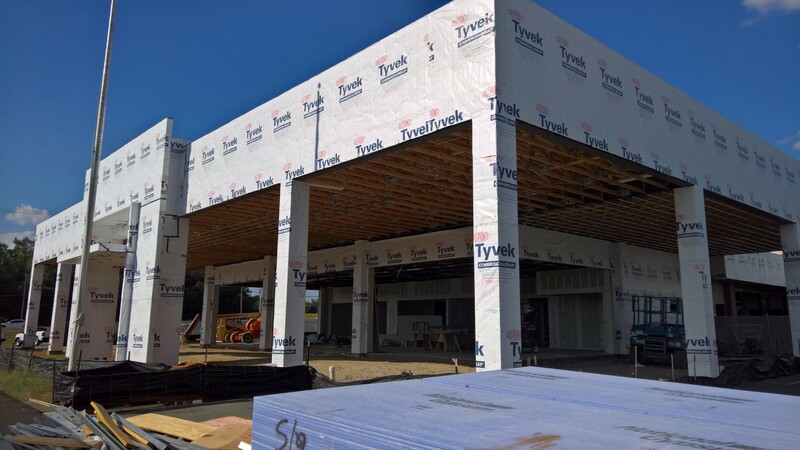 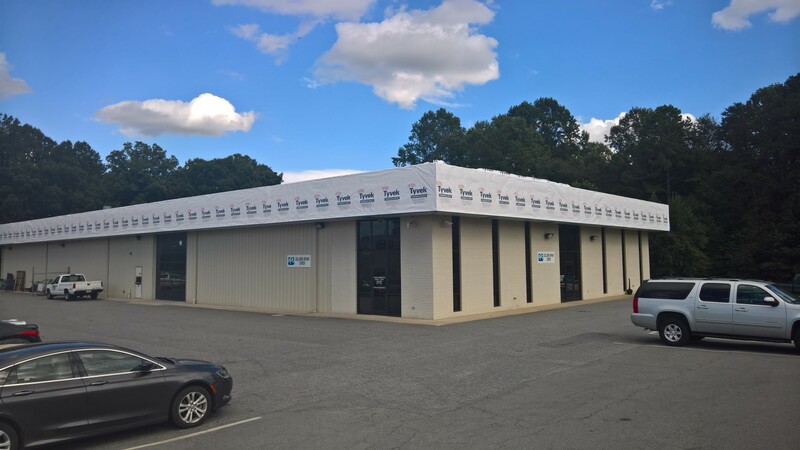 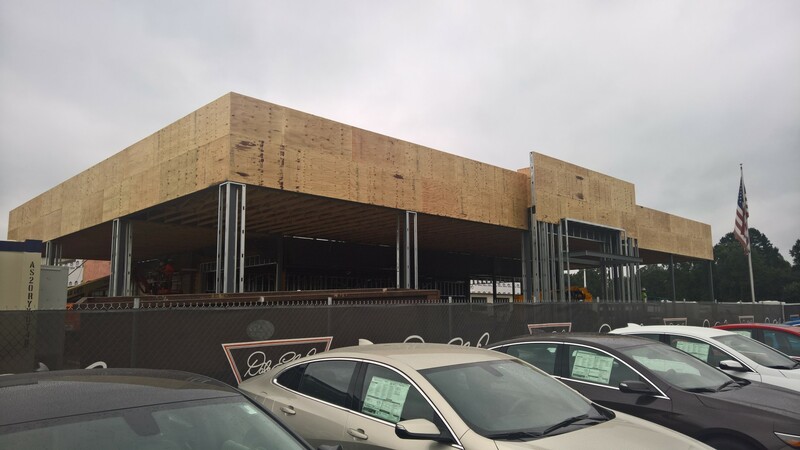 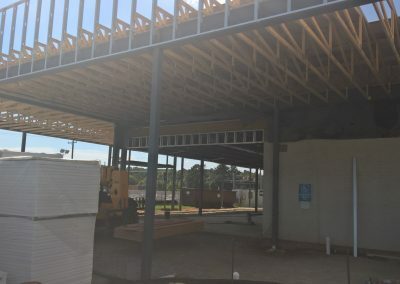 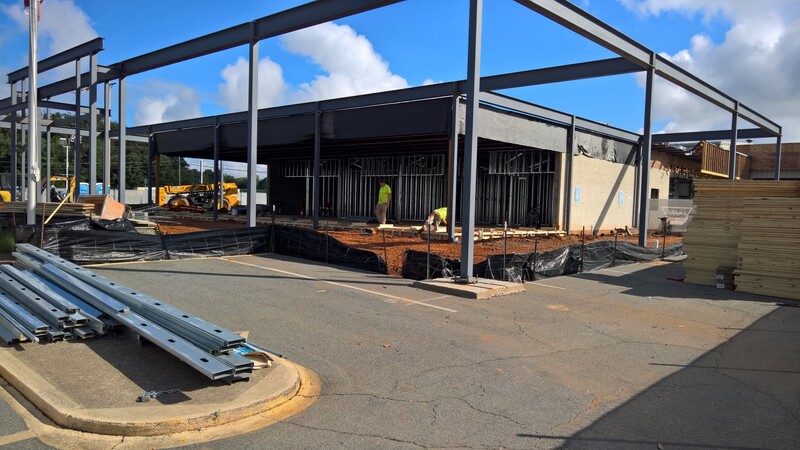 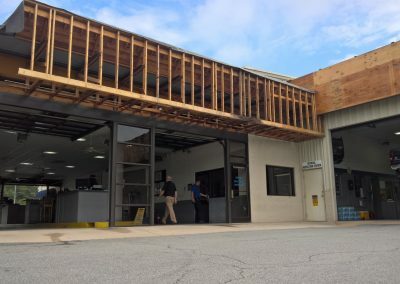 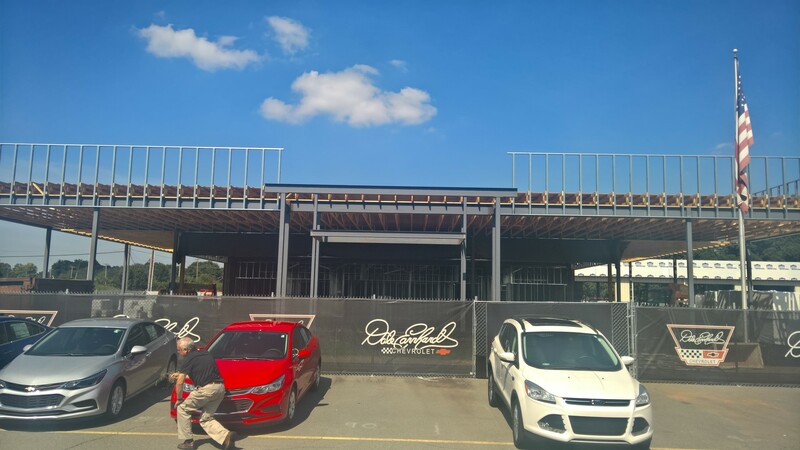 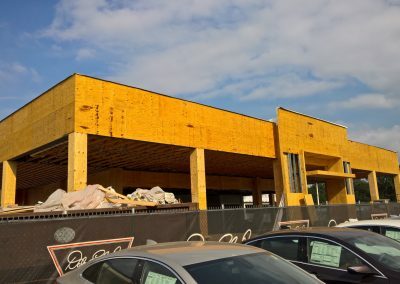 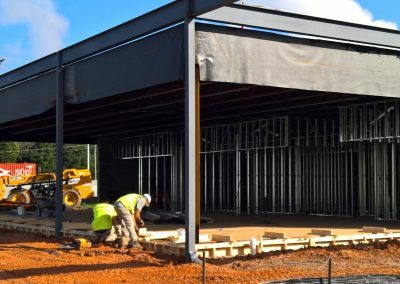 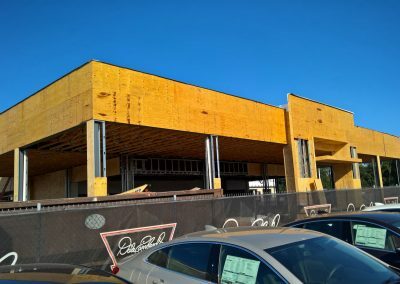 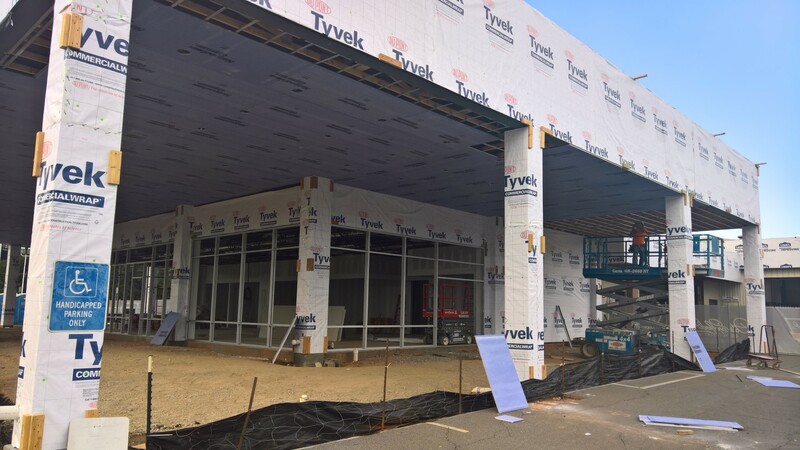 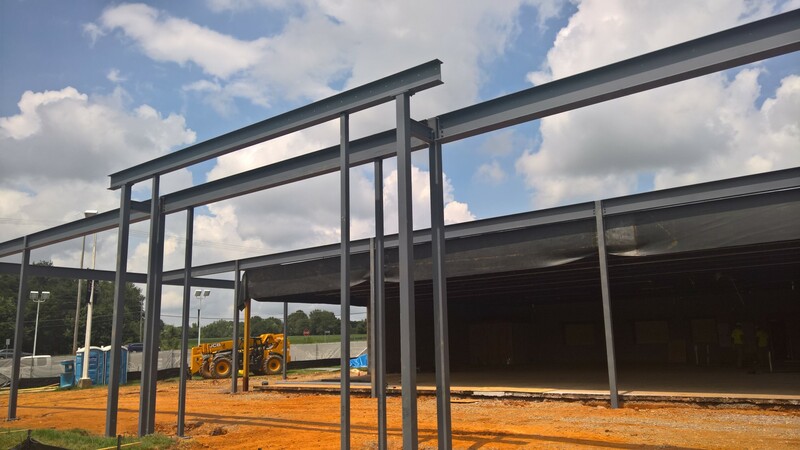 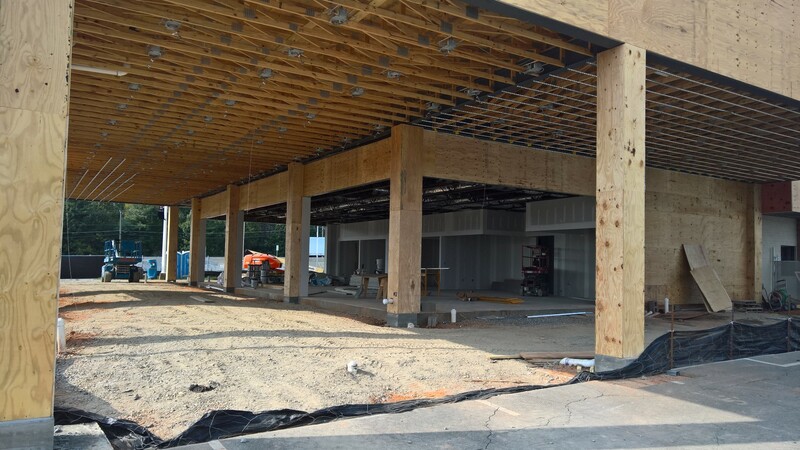 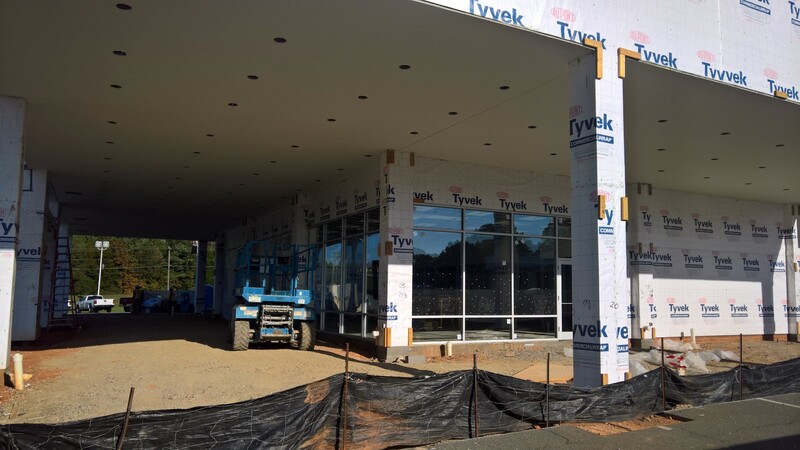 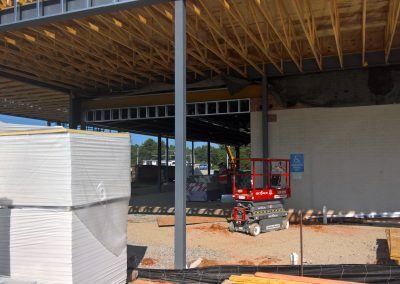 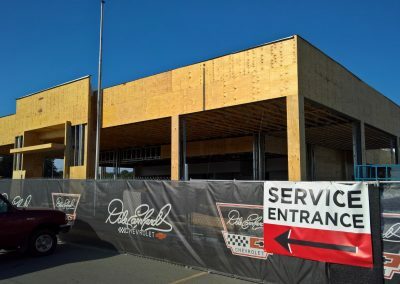 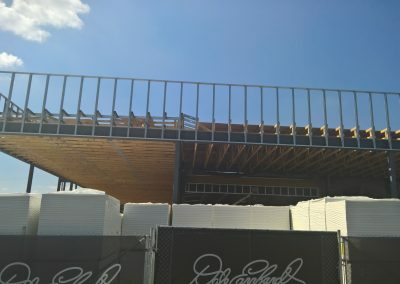 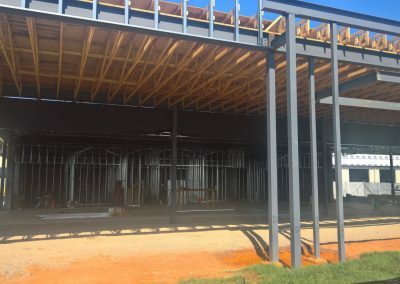 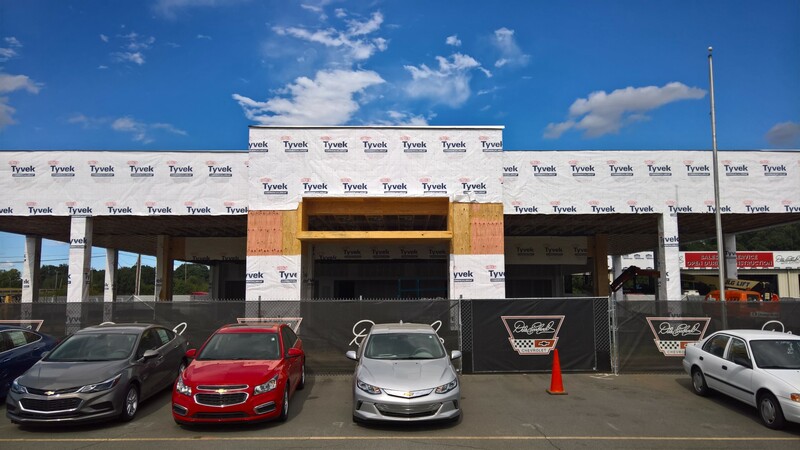 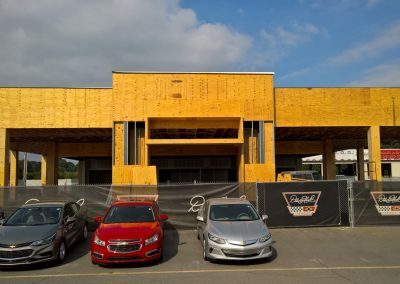 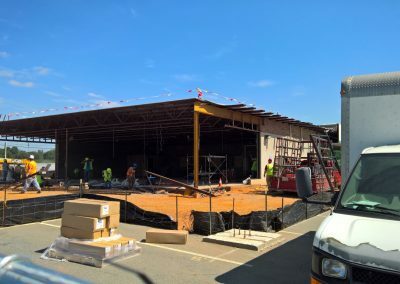 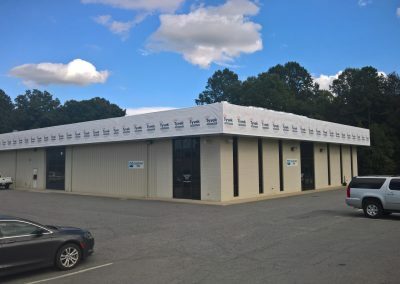 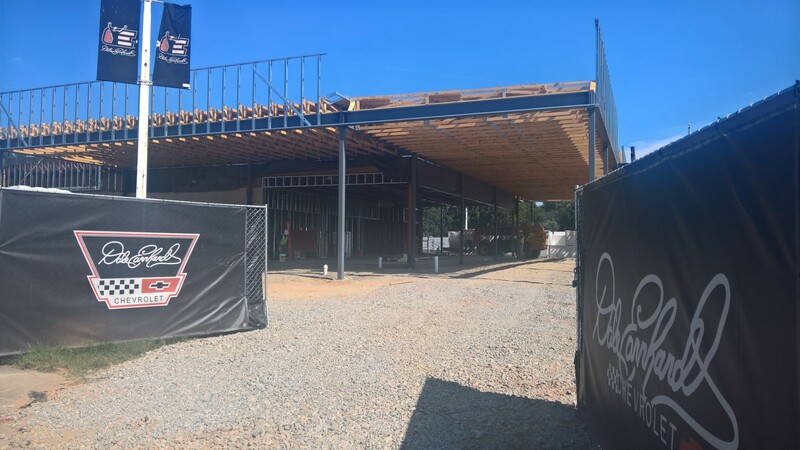 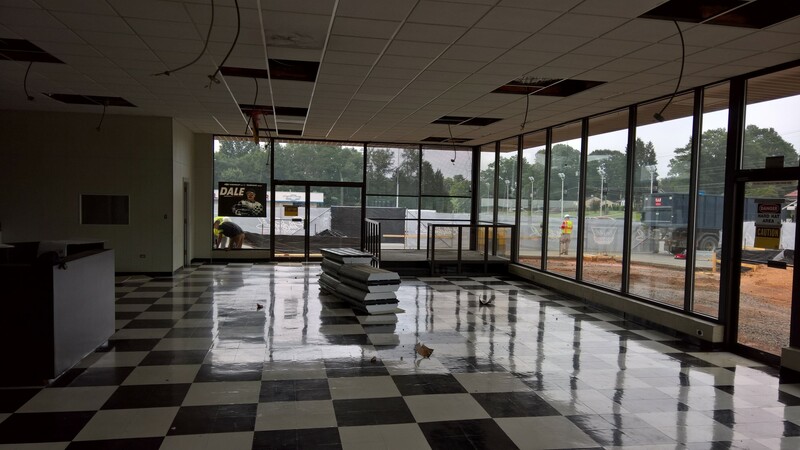 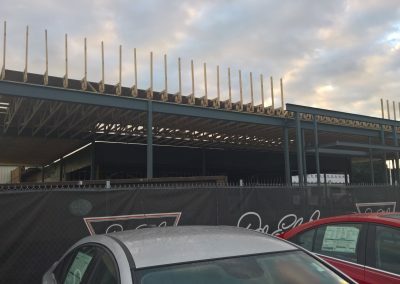 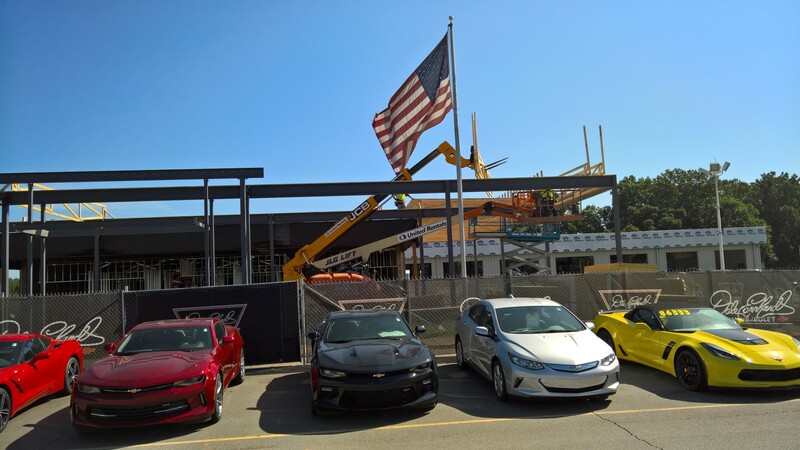 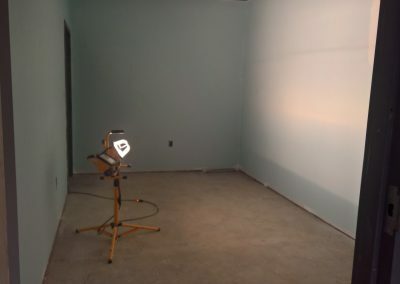 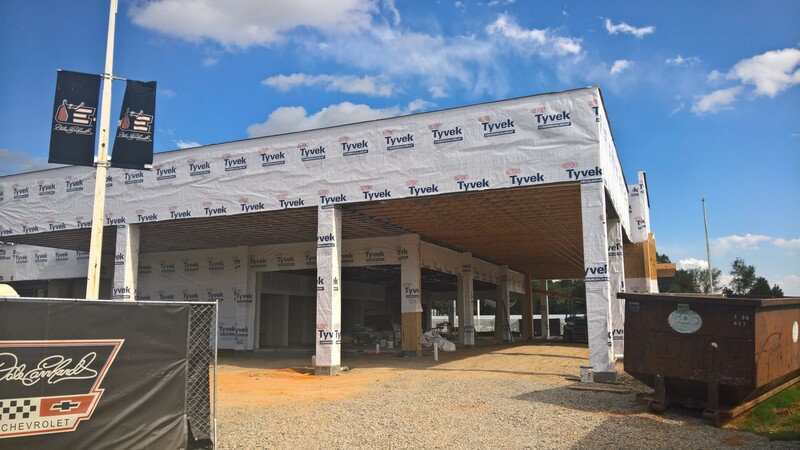 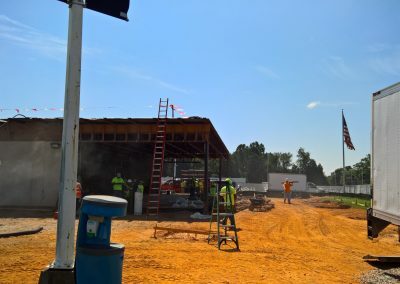 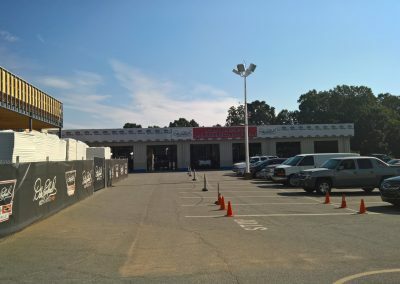 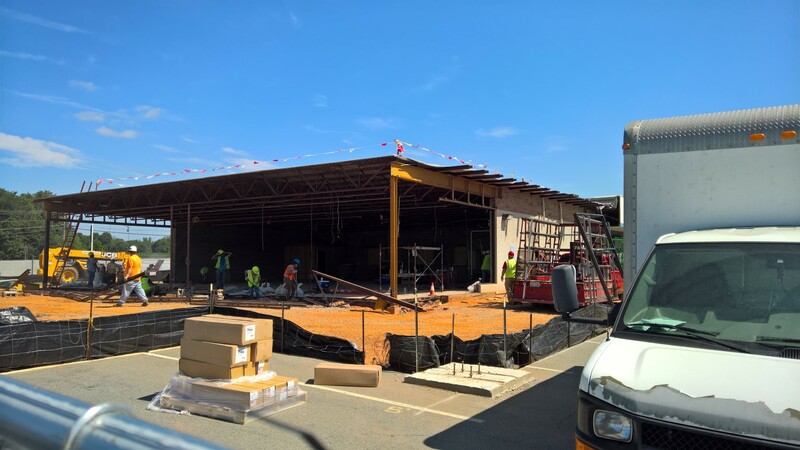 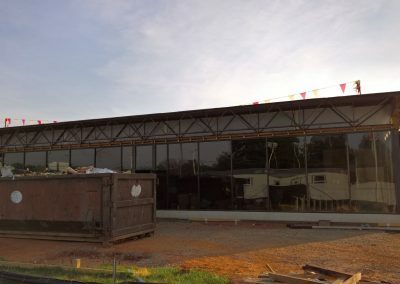 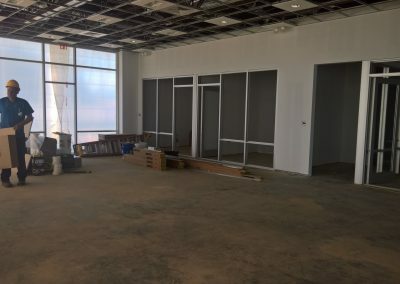 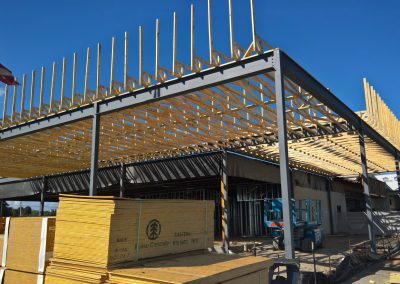 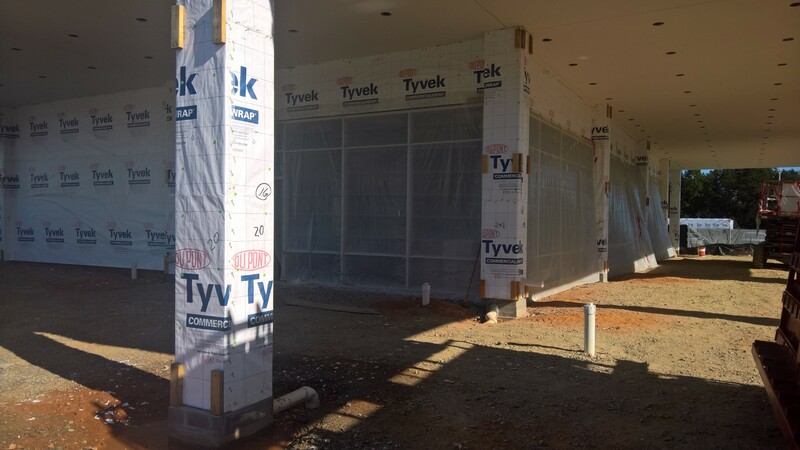 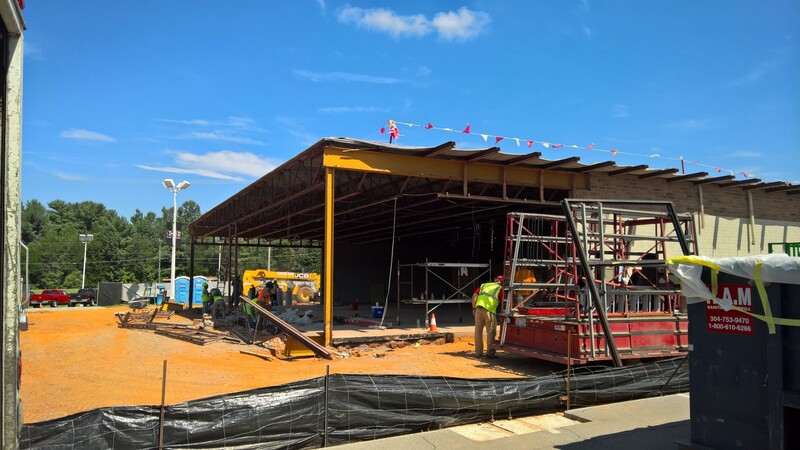 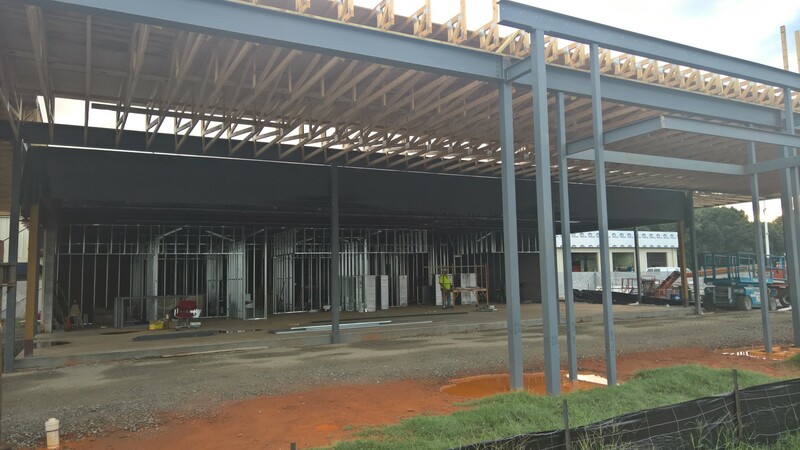 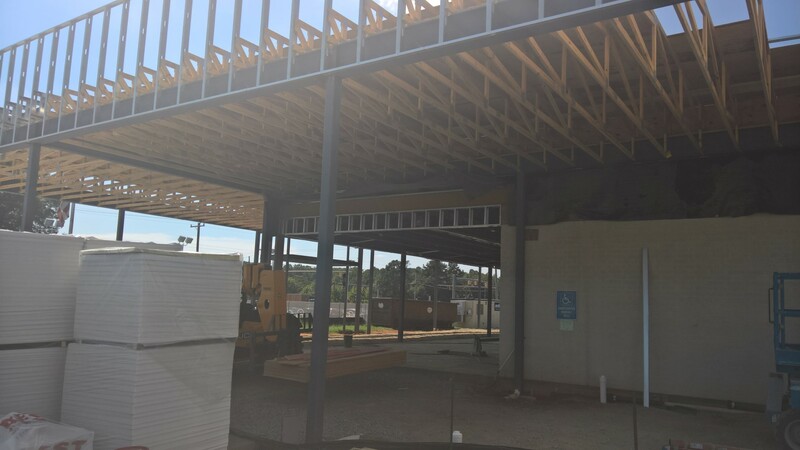 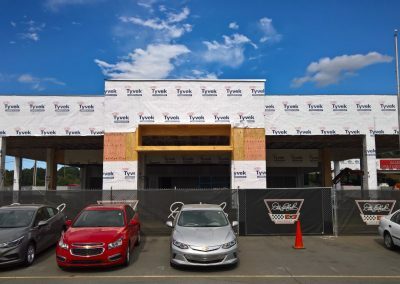 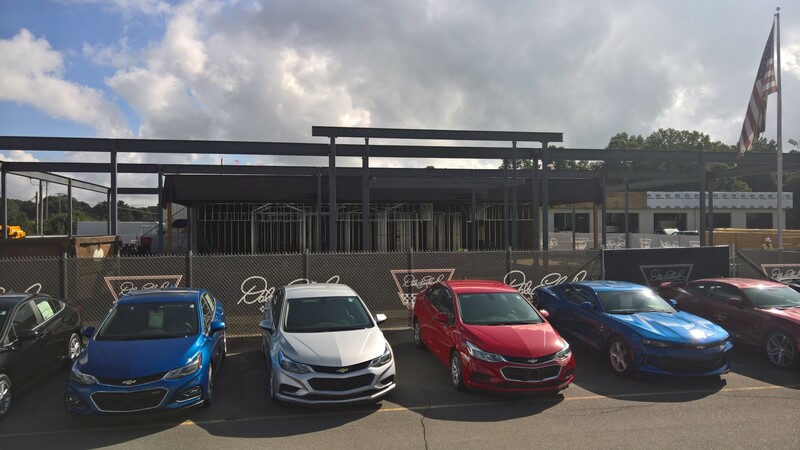 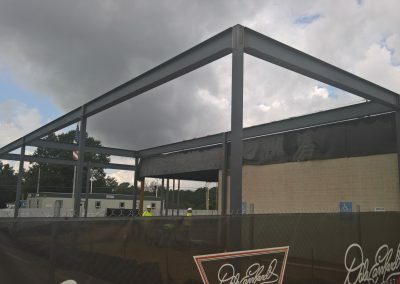 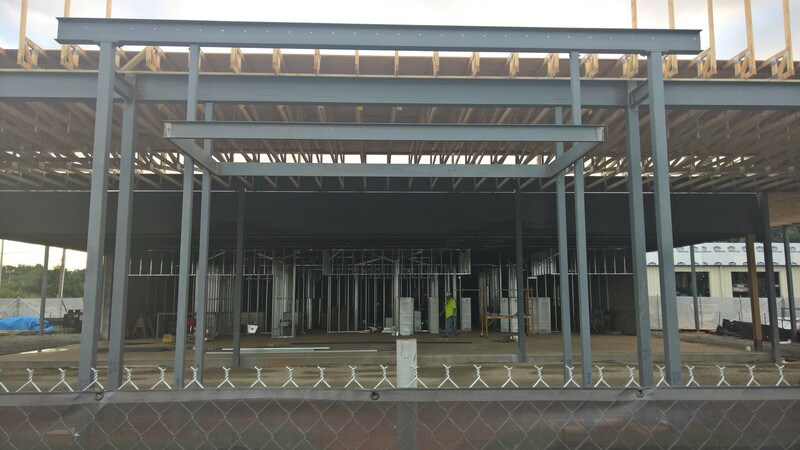 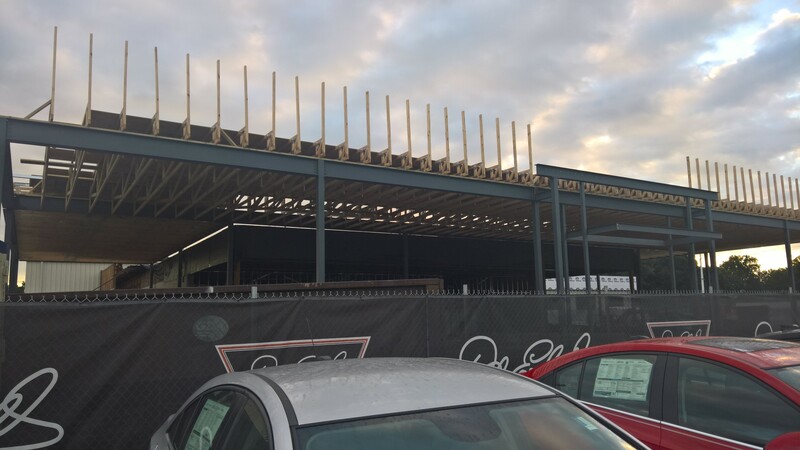 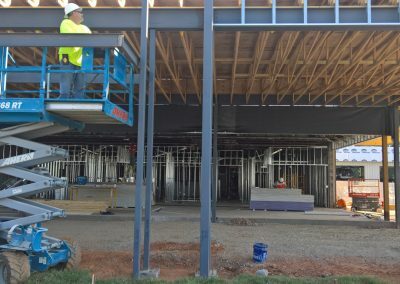 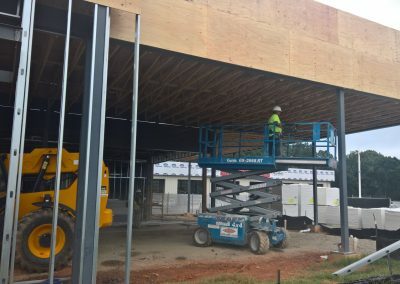 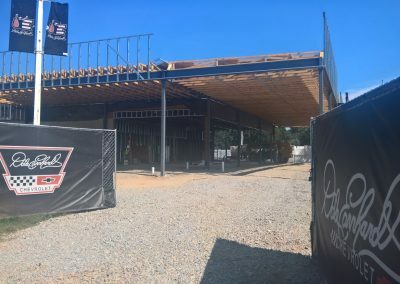 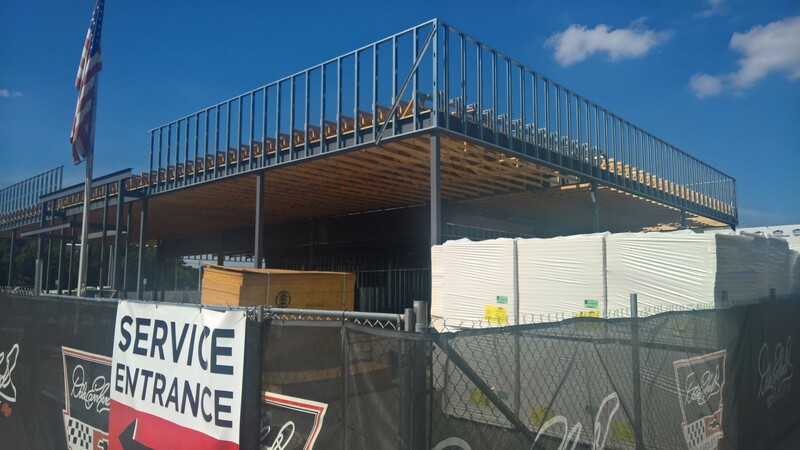 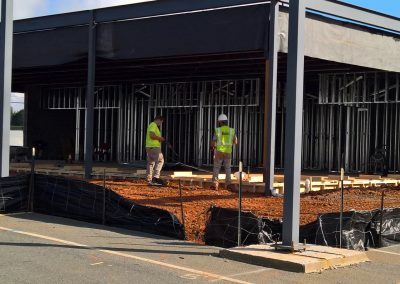 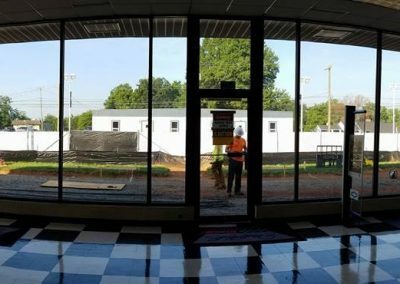 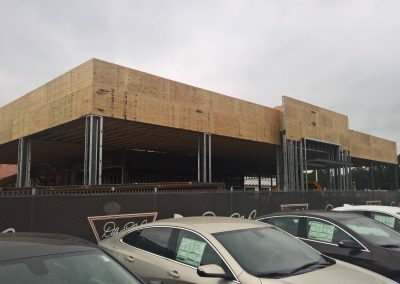 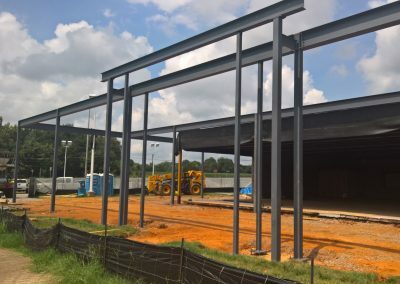 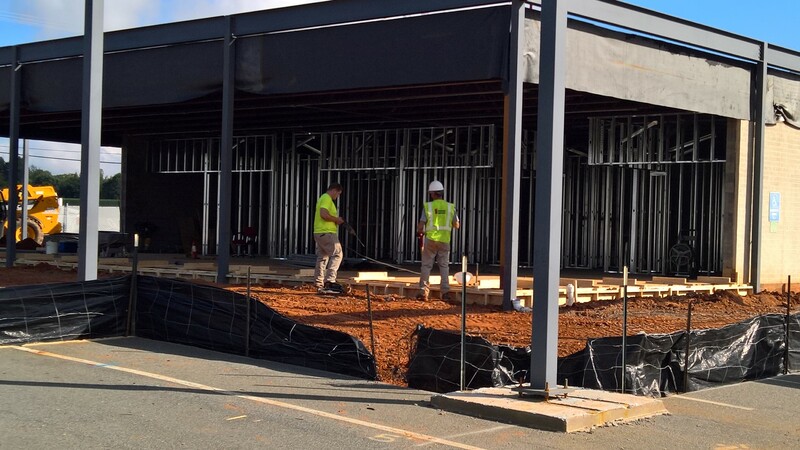 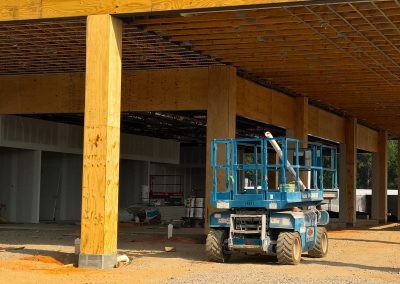 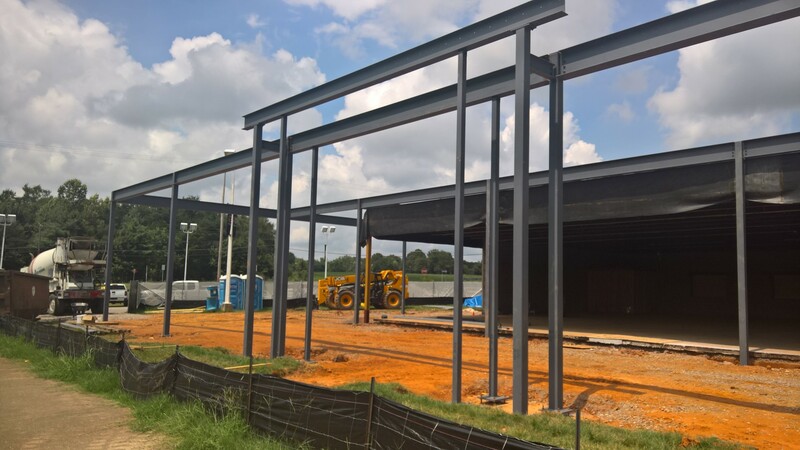 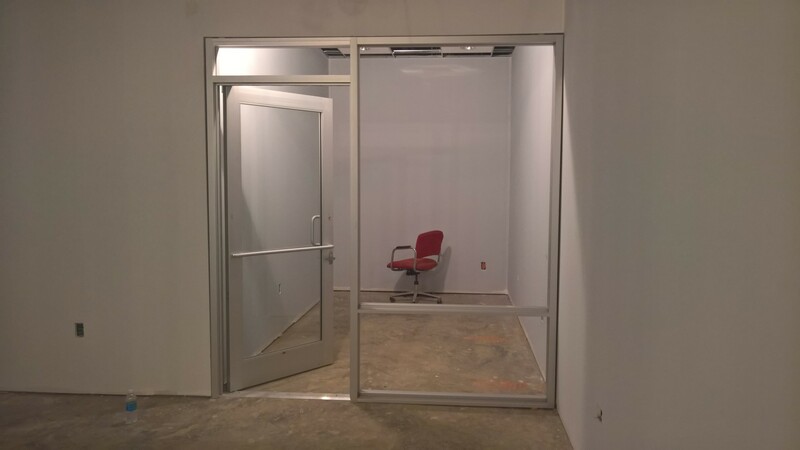 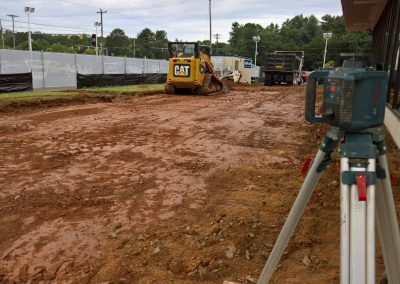 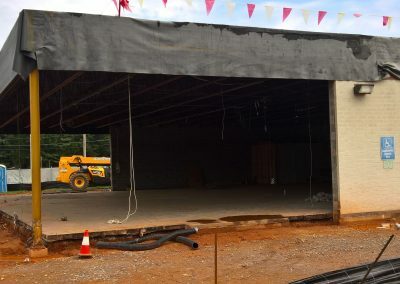 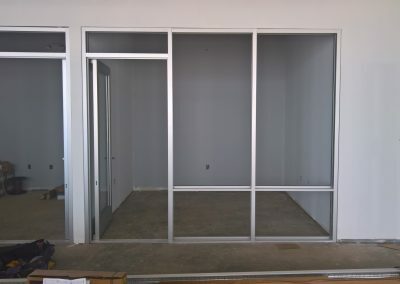 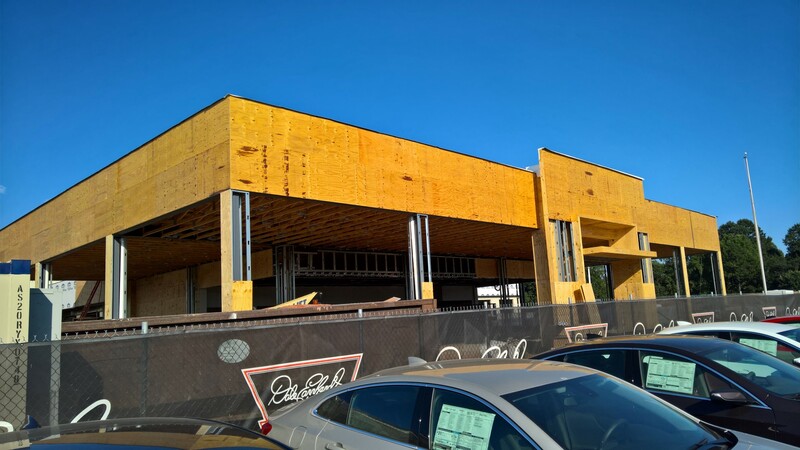 The finished building will extend out further than the current one with room for vehicles around the outside of the showroom. 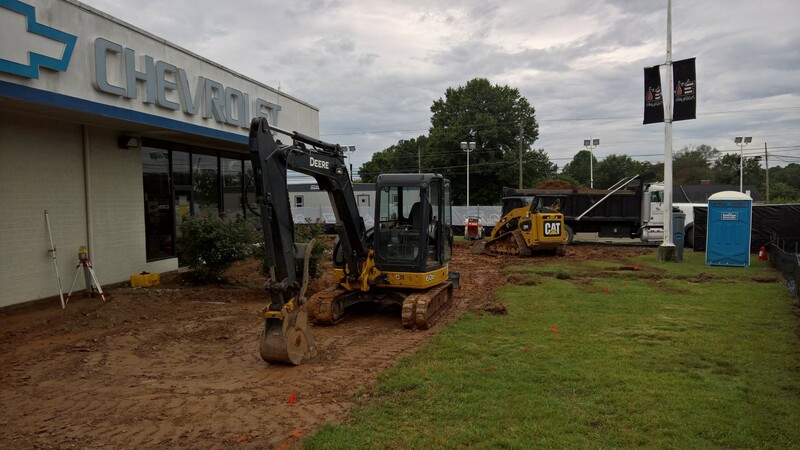 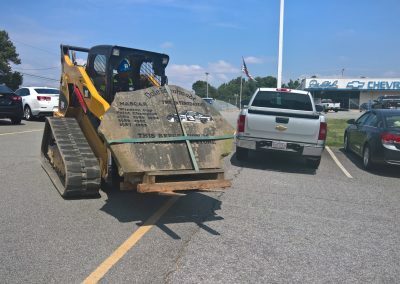 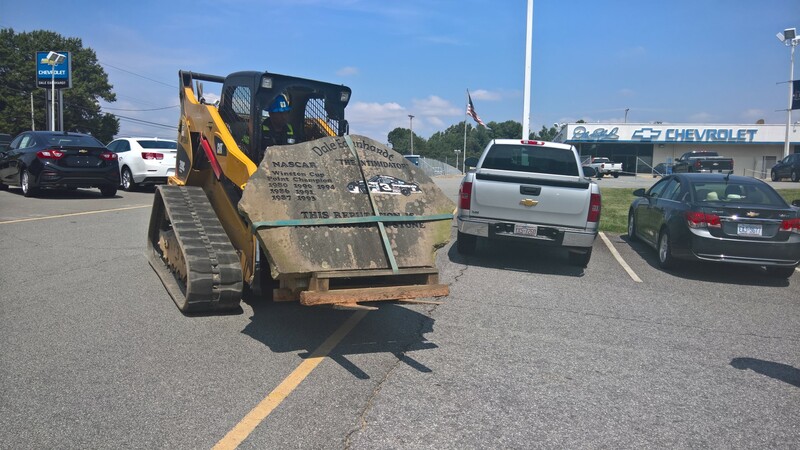 We also had to move the rock which has sat beside the dealership for years. 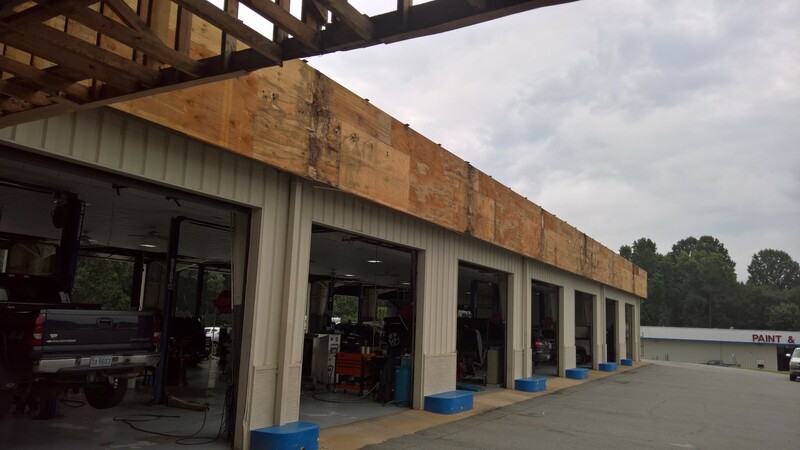 Its new home is resting between our upper service shop and our lower body shop. 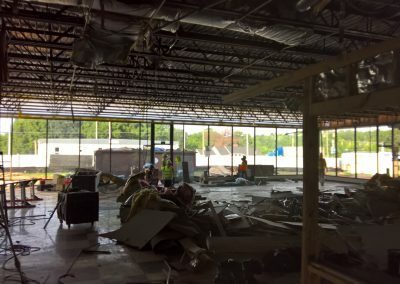 A lot happened the month of July! 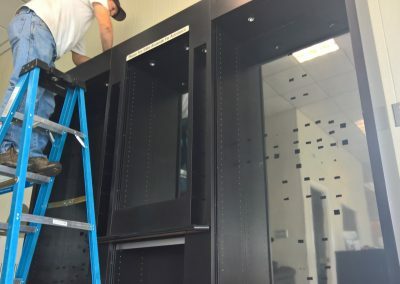 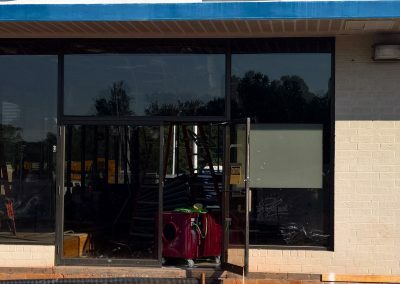 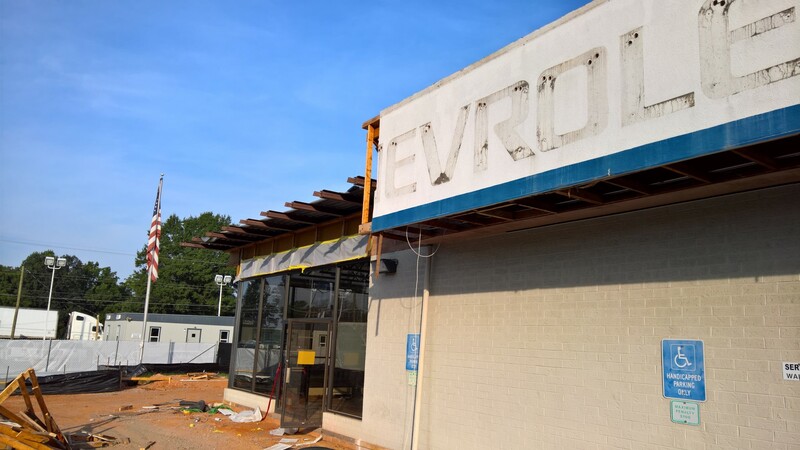 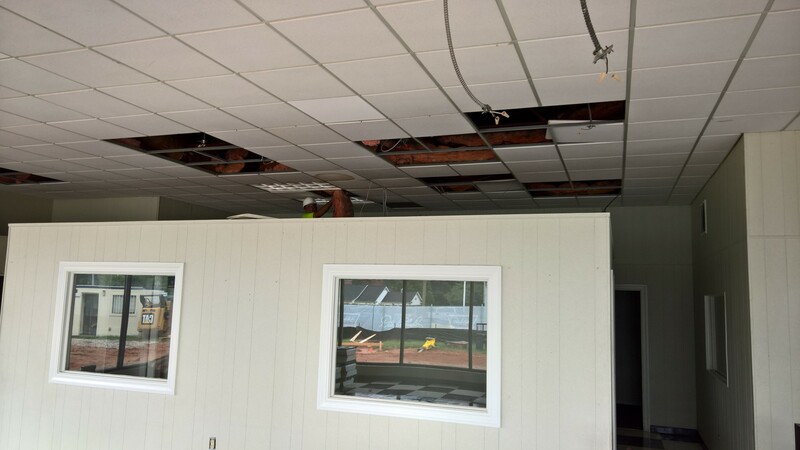 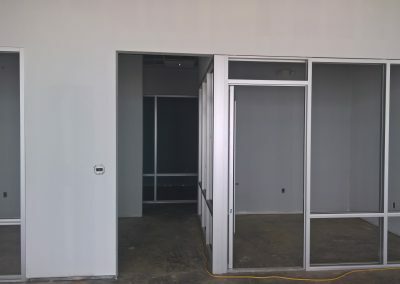 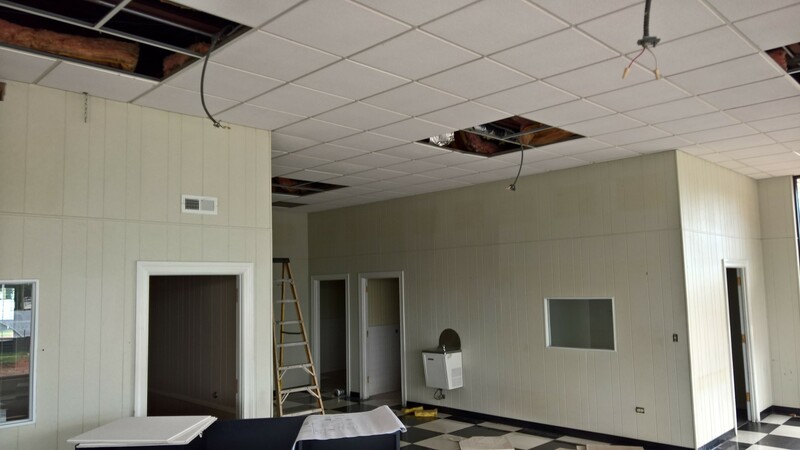 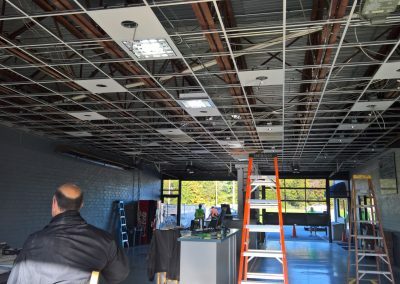 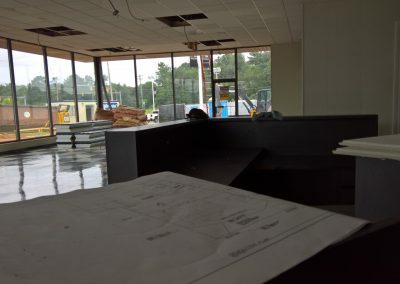 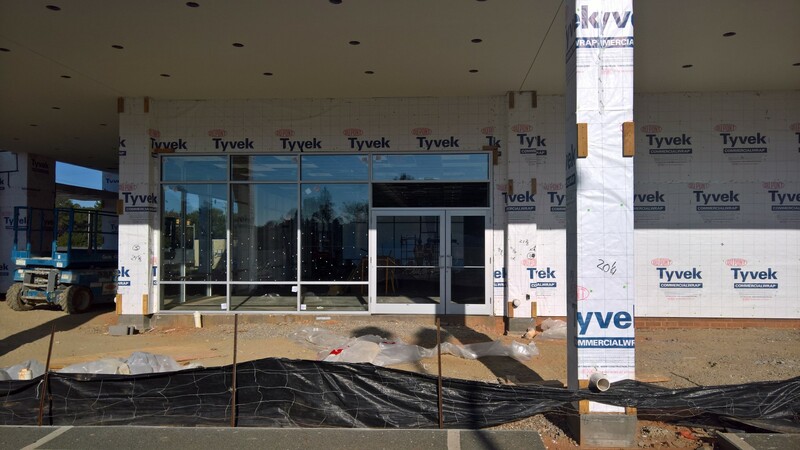 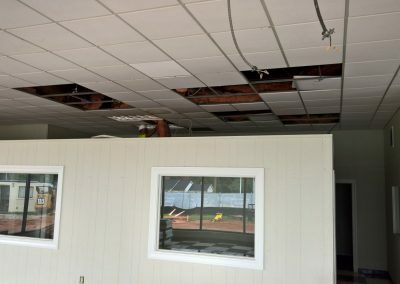 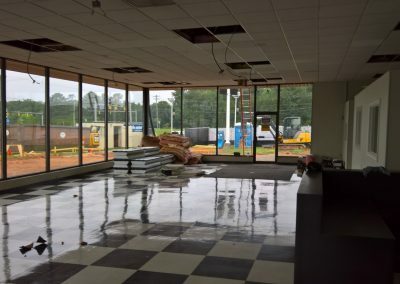 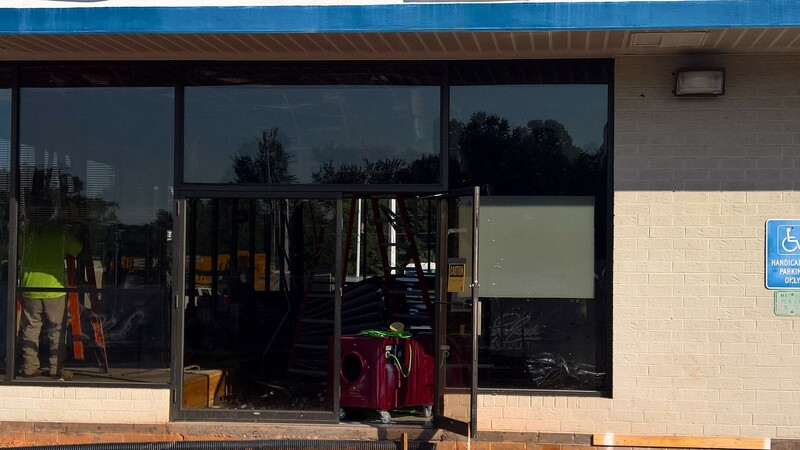 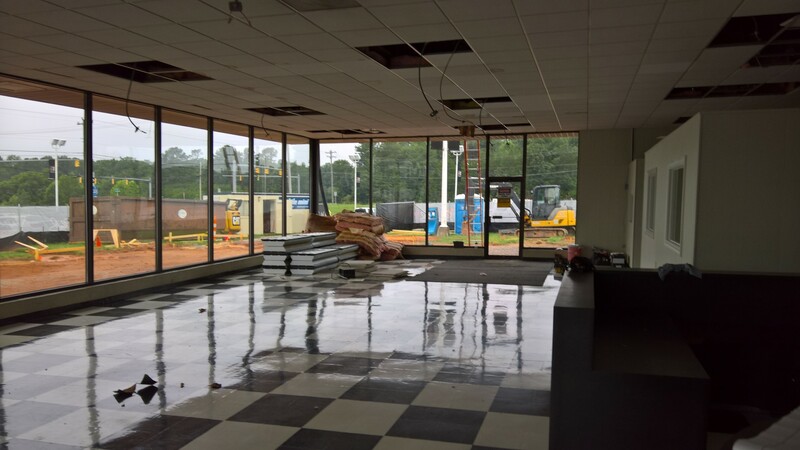 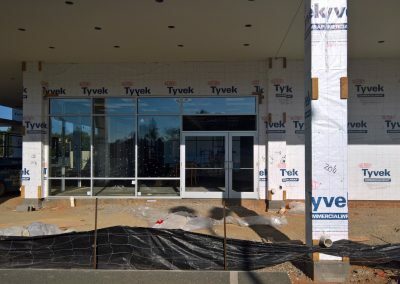 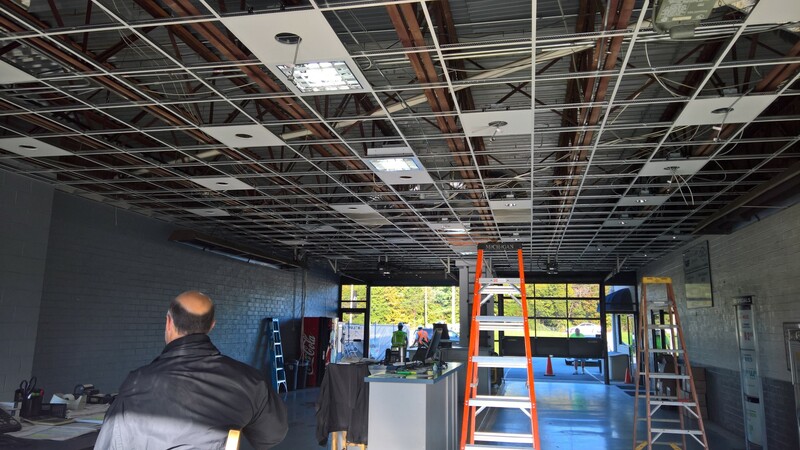 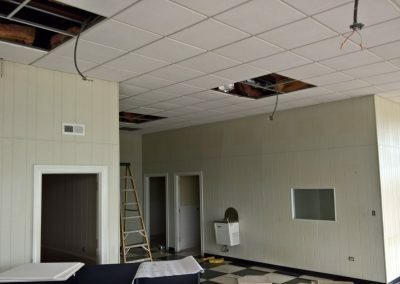 The entire showroom was gutted and the fascia of the showroom was removed as well as the glass. 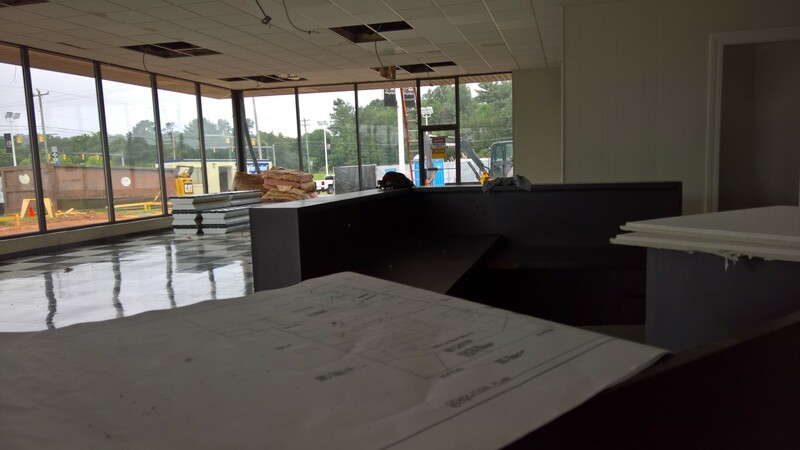 Nothing but a shell remains of the showroom at this point. 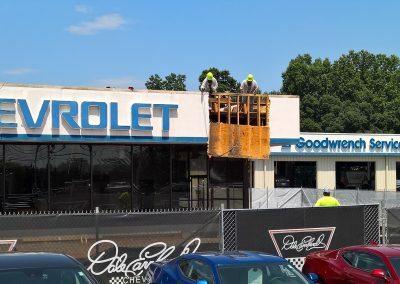 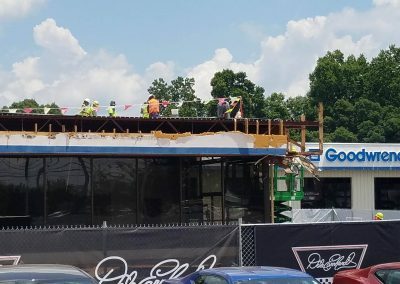 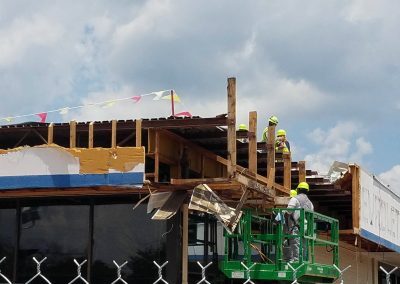 After all the deconstruction was finished these guys really got moving on getting this building back together! 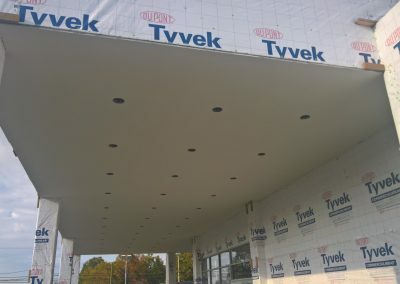 The exterior of the building is finished. 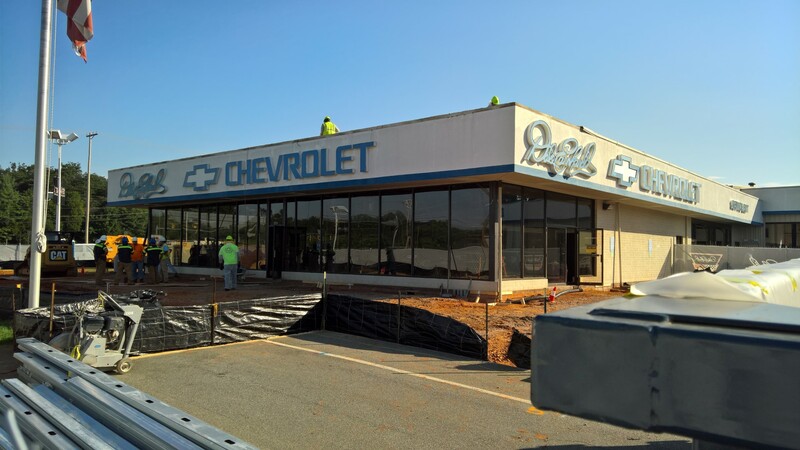 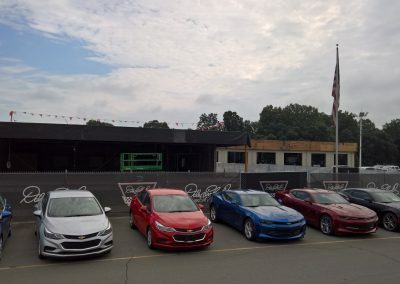 Now it waits on the blue exterior tiles which will come from Chevrolet. 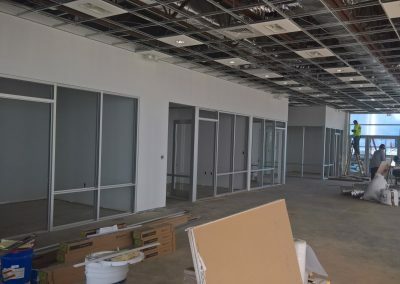 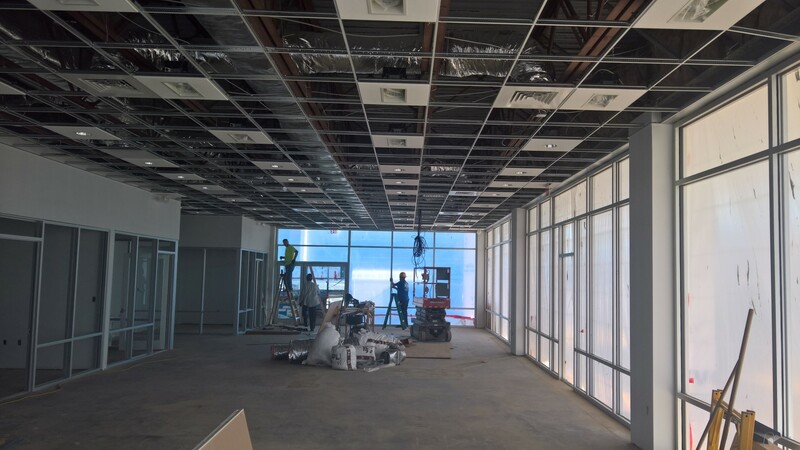 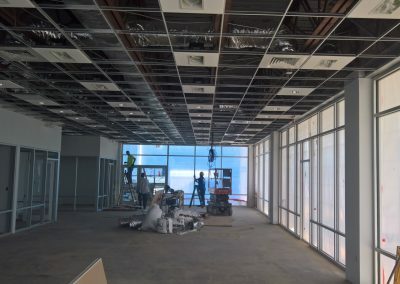 The interior is coming together quite quickly as well! 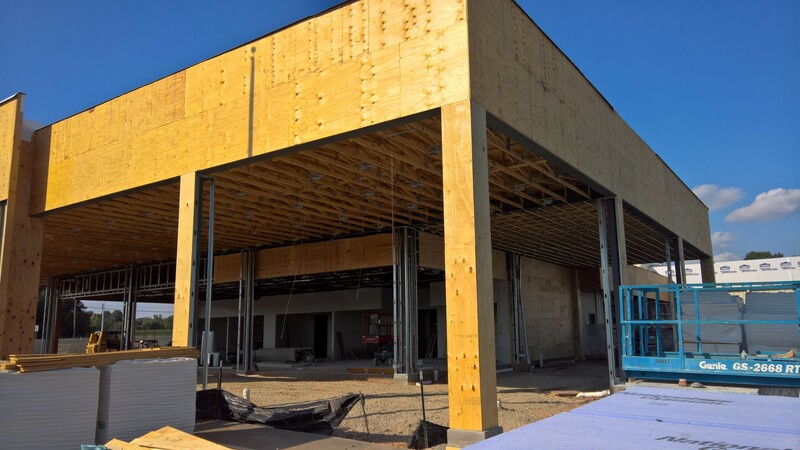 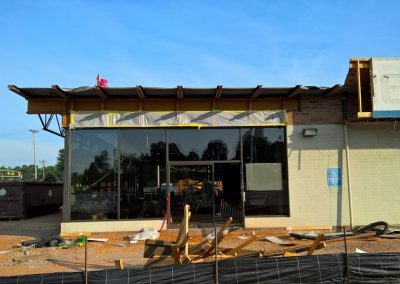 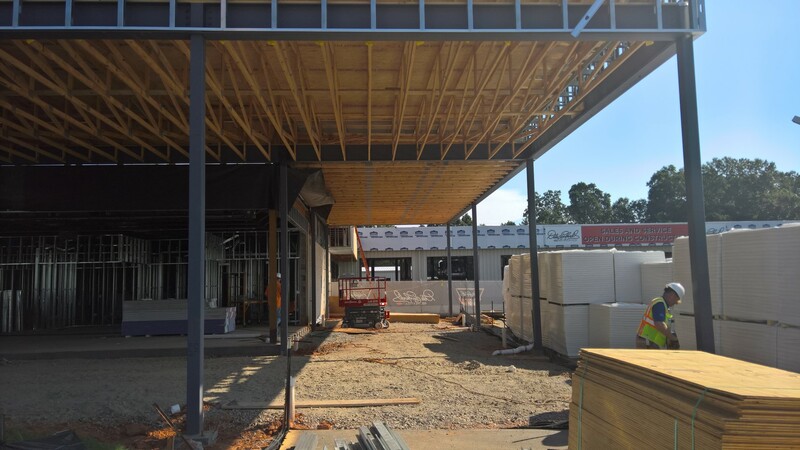 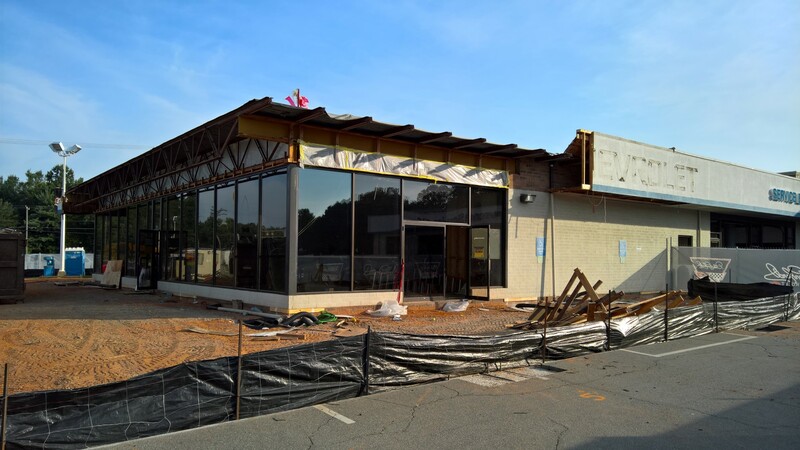 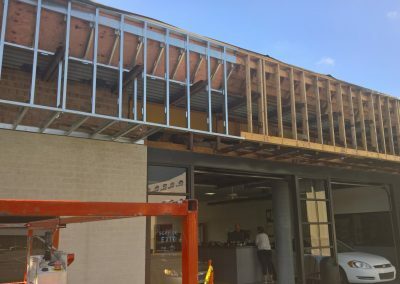 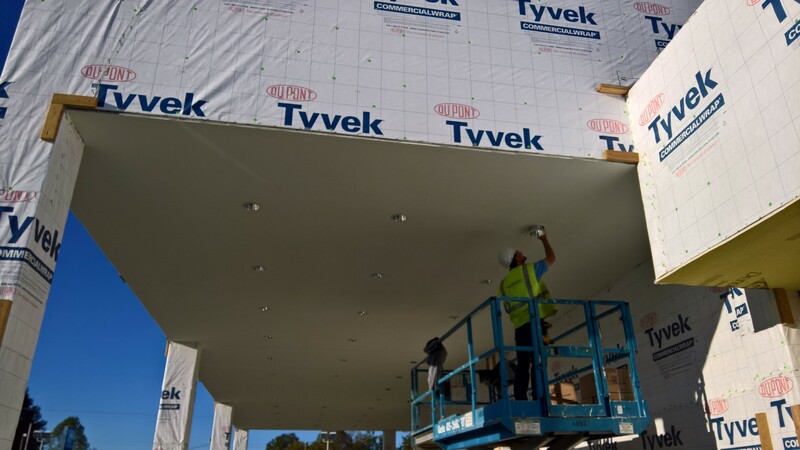 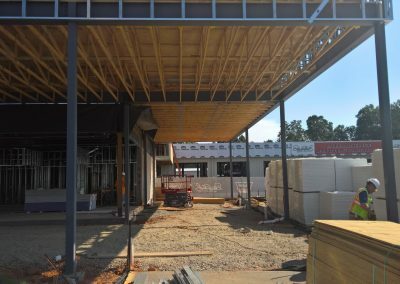 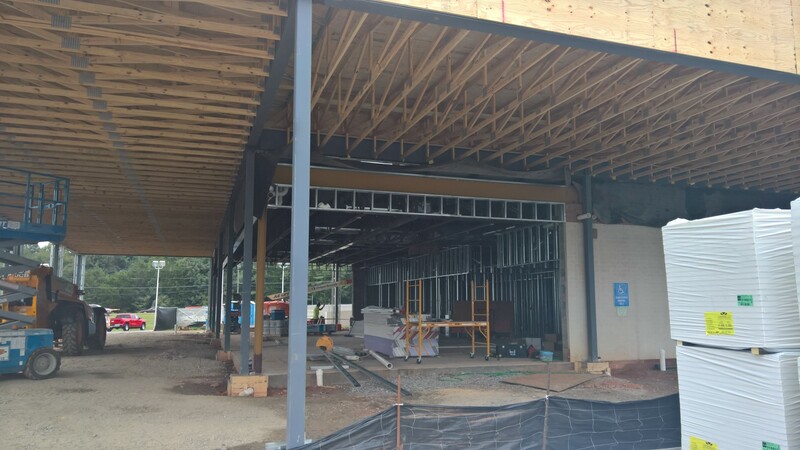 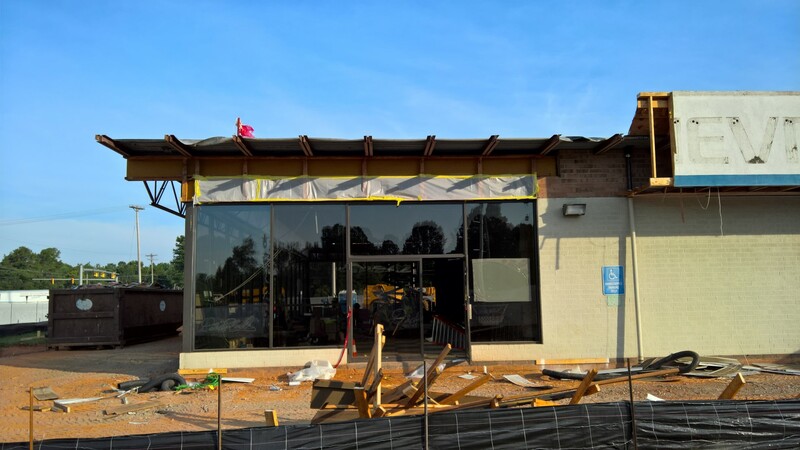 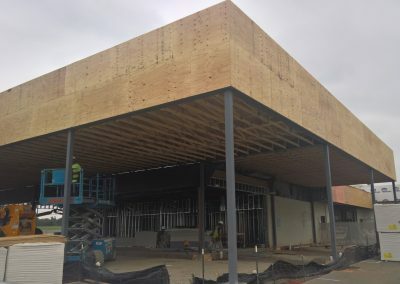 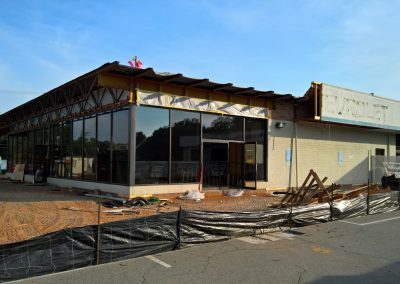 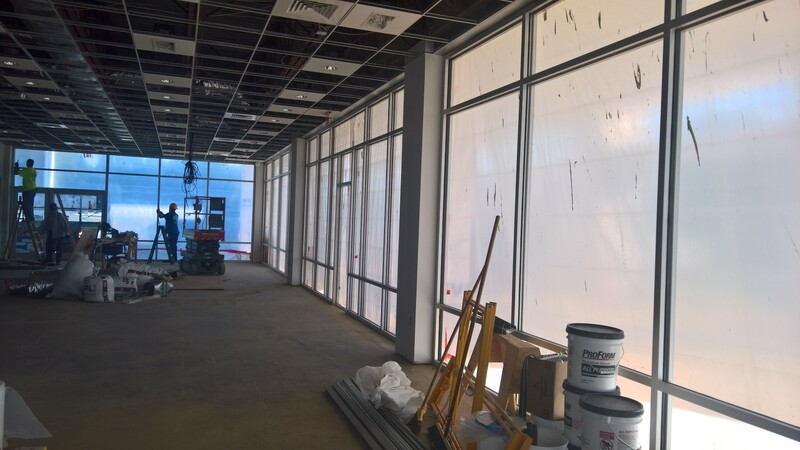 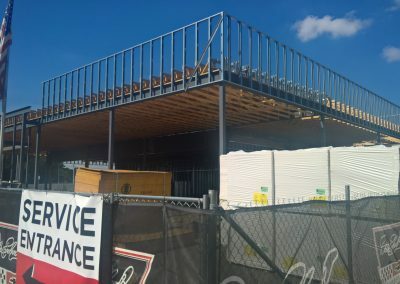 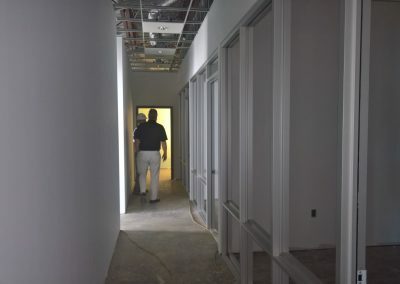 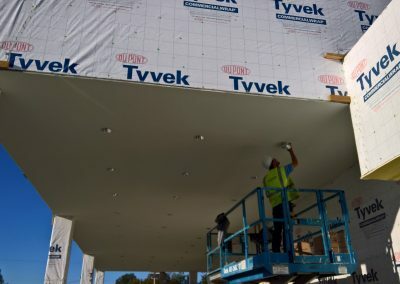 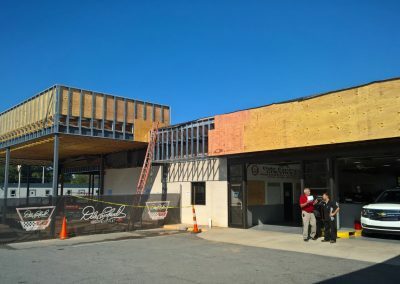 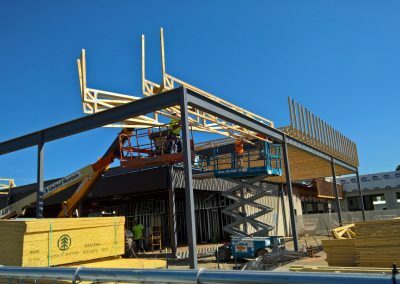 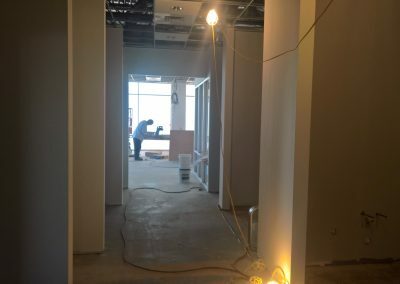 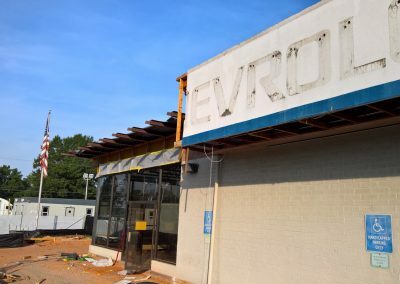 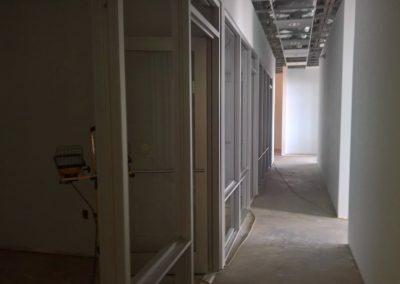 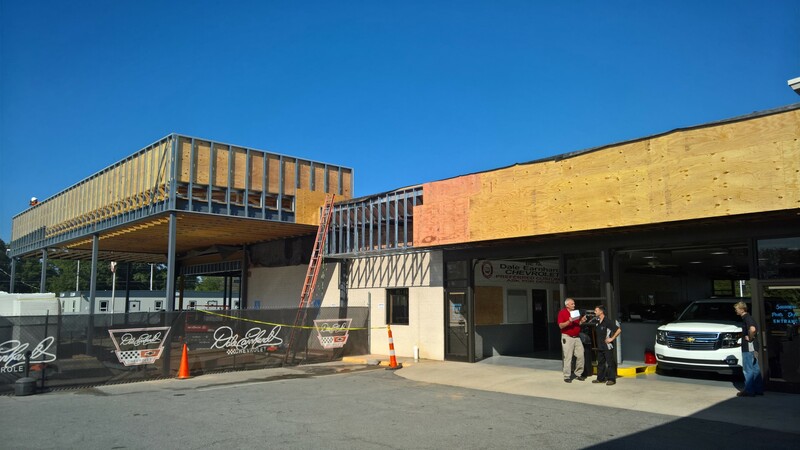 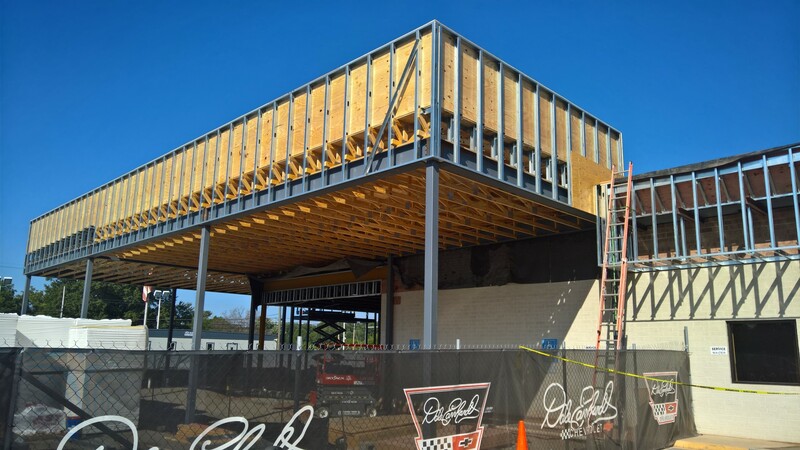 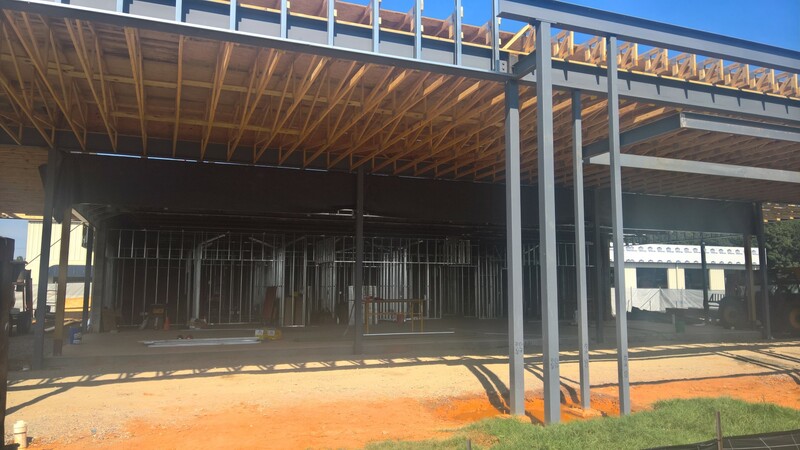 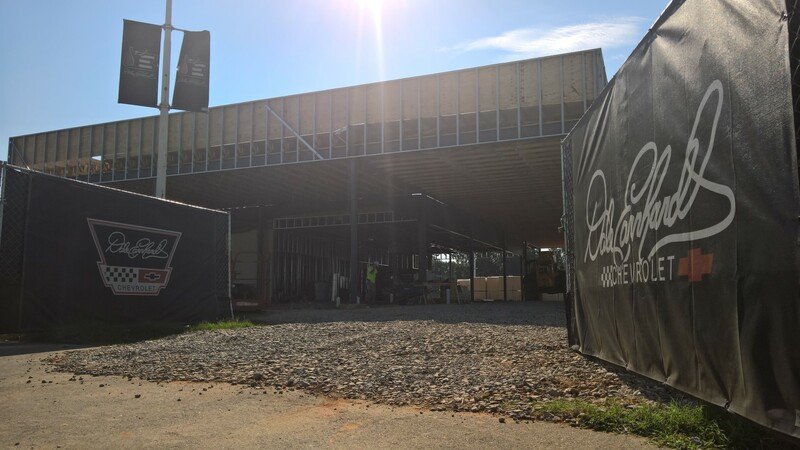 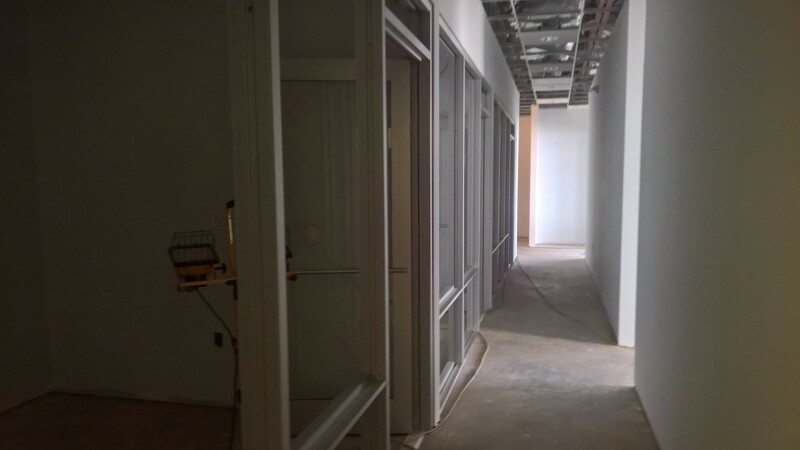 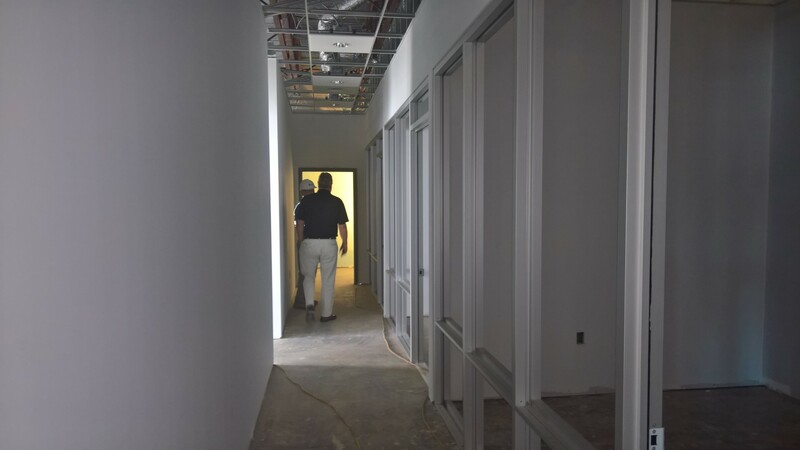 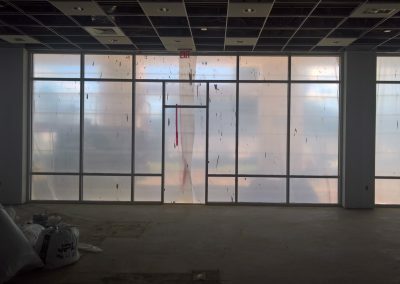 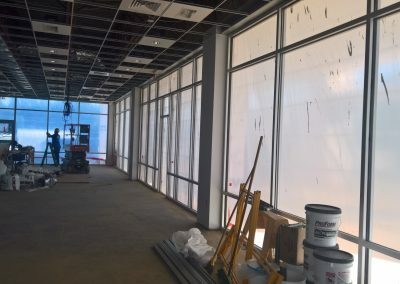 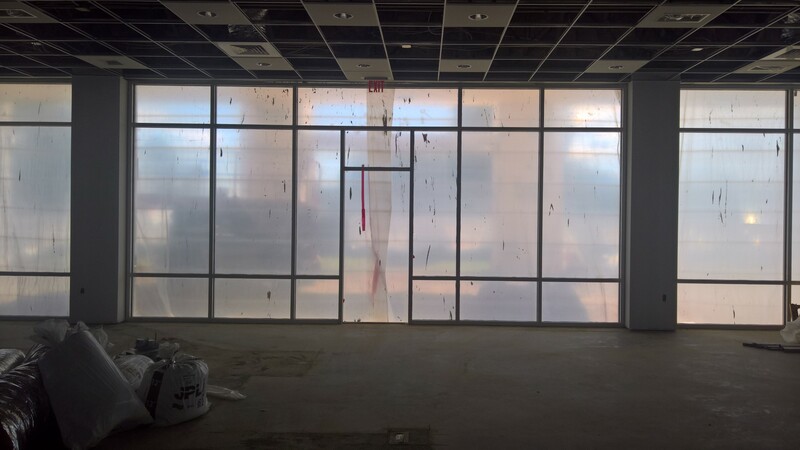 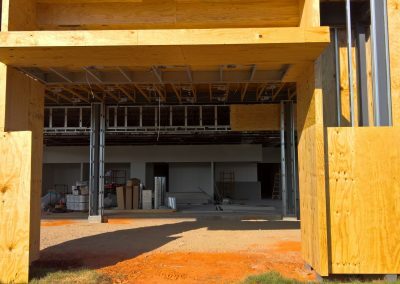 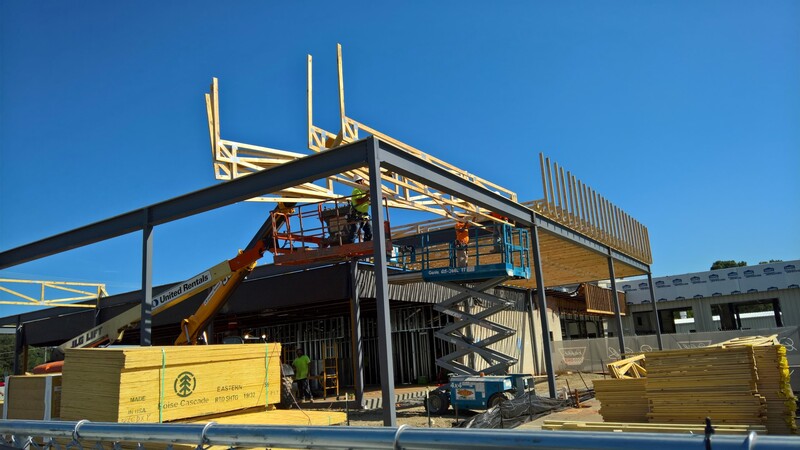 With the bulk of the exterior finished there aren’t many visible exterior changes happening so we take a trip on the inside to see how the inside is shaping up.